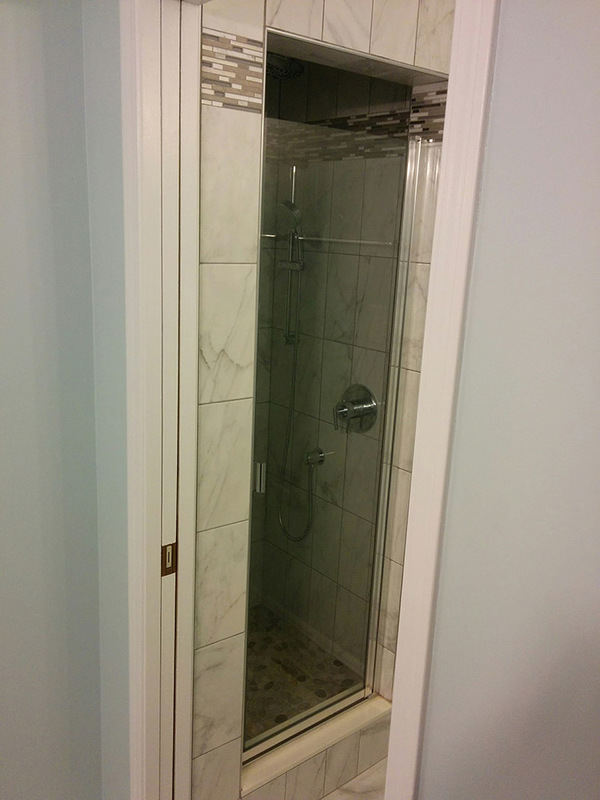 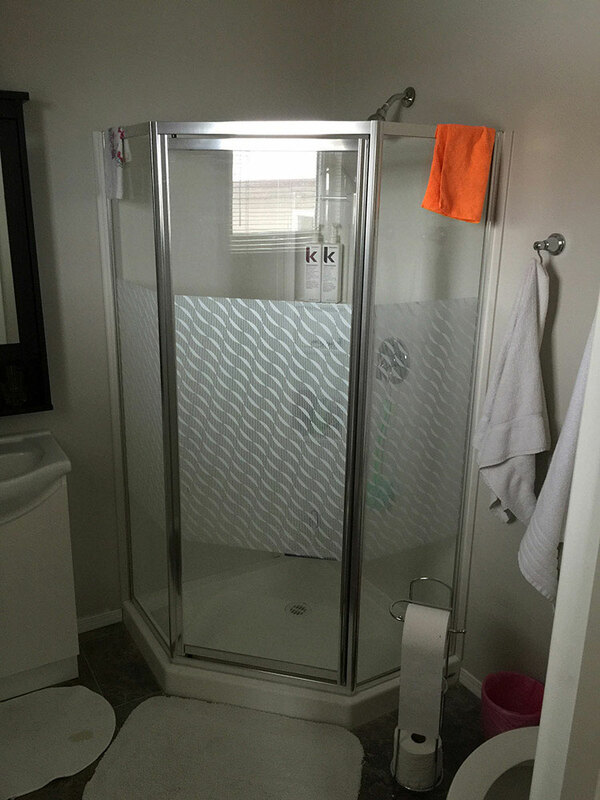 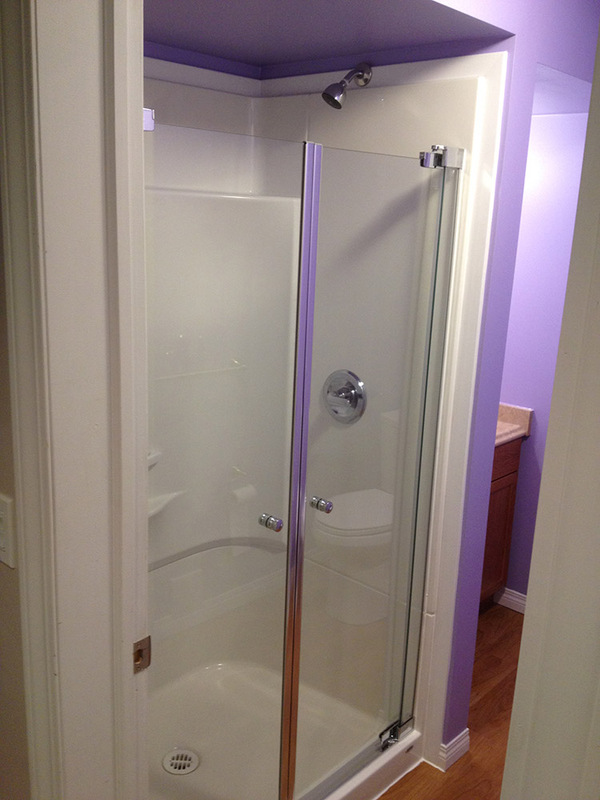 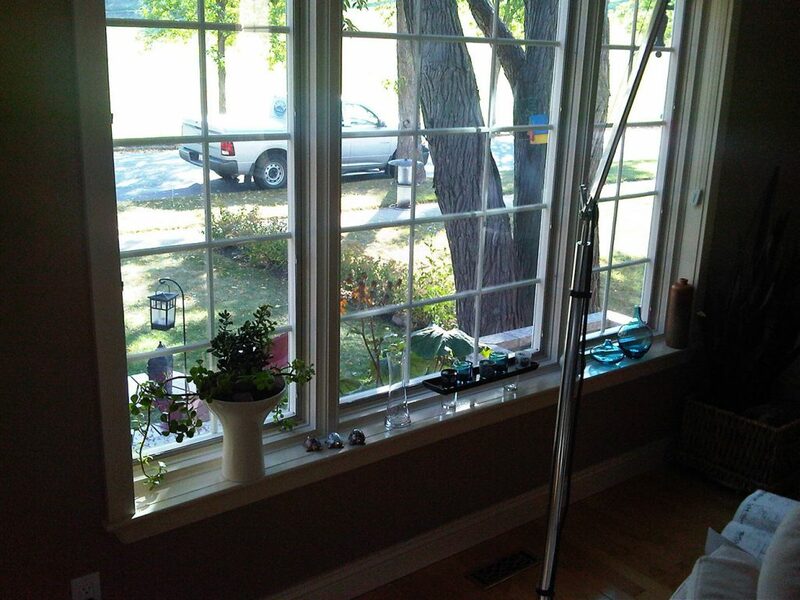 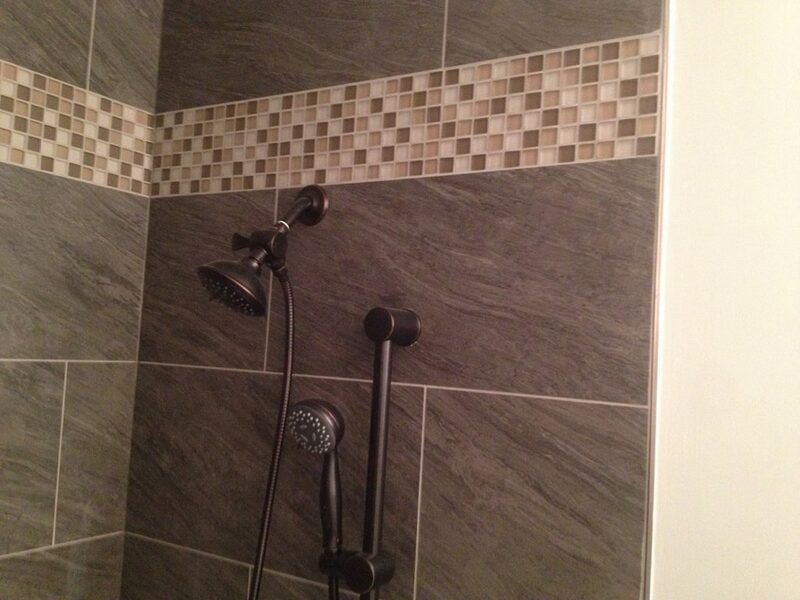 Sturgeon County Accessible Shower Renovation: Both of our clients are very happy with this shower. 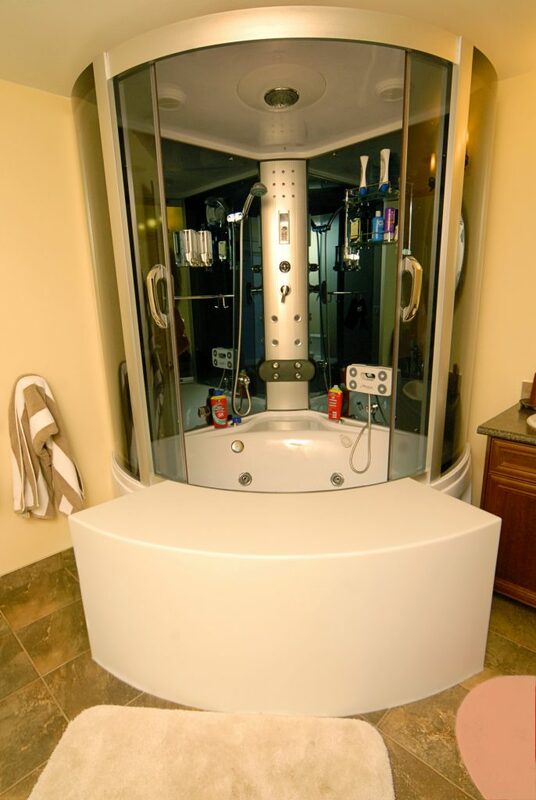 It not only allows for both spouses to bathe comfortably, but they also told us it makes it really easy to give their German Shepard a bath too. 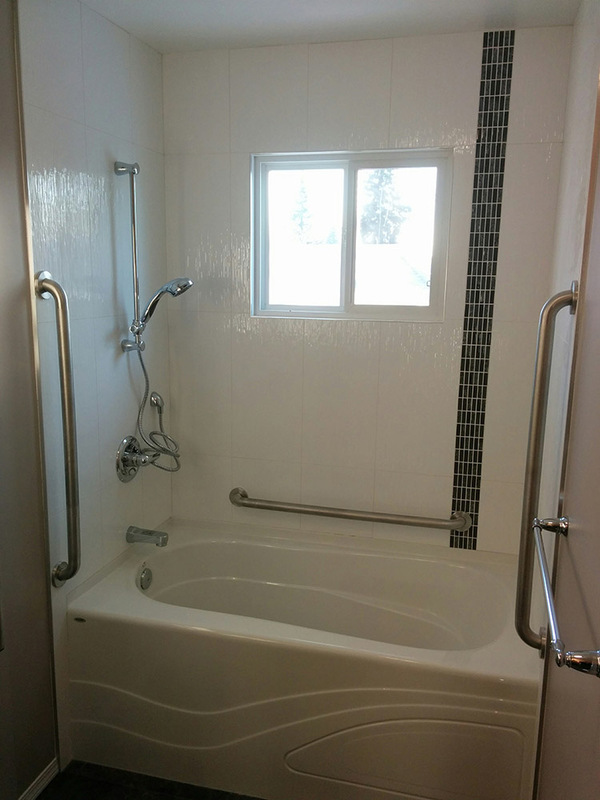 Sturgeon County Accessible Shower Renovation: The shower bench is folded away when not in use. 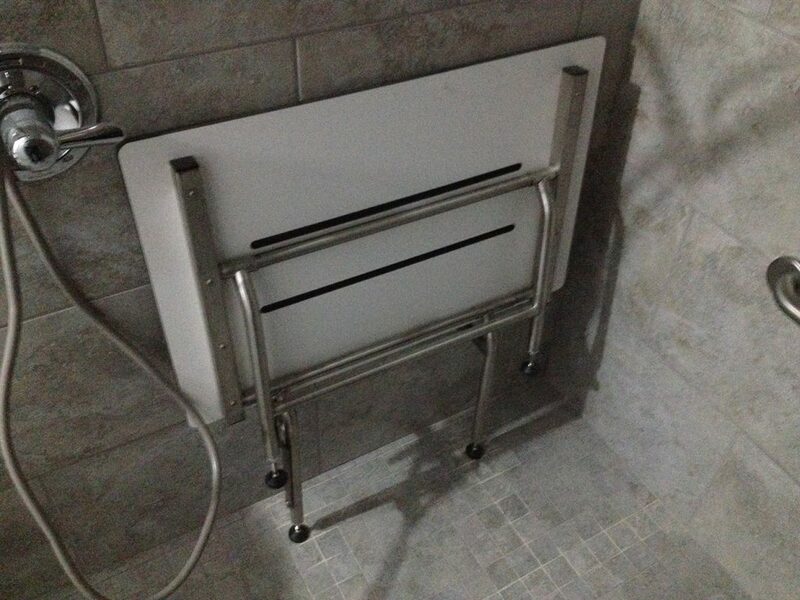 The shower bench can support up to 500 pounds. 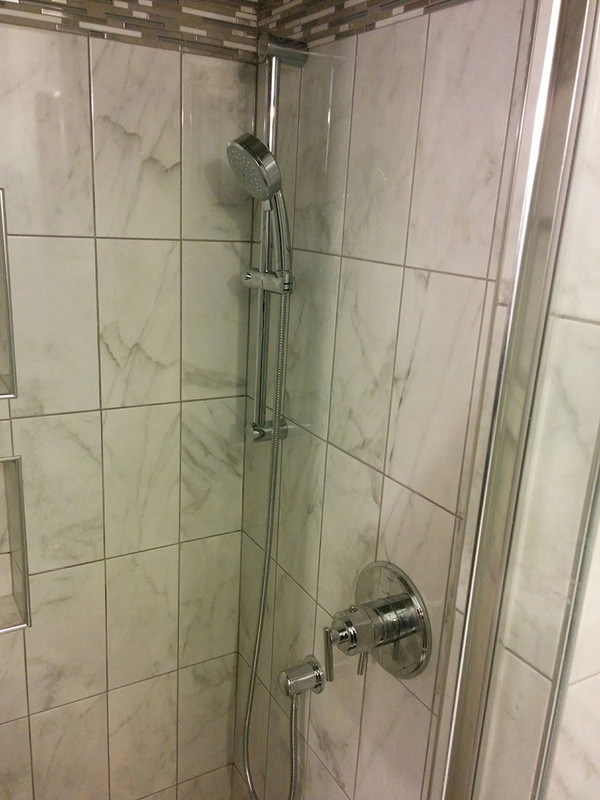 Kensington Accessible Shower Renovation: A closeup of the hand shower. 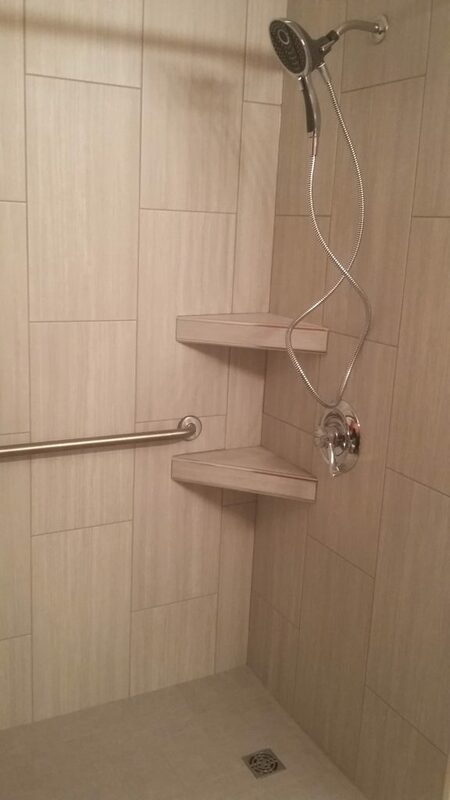 It comes with a grip on the back of the head so it's easier to hang on to. 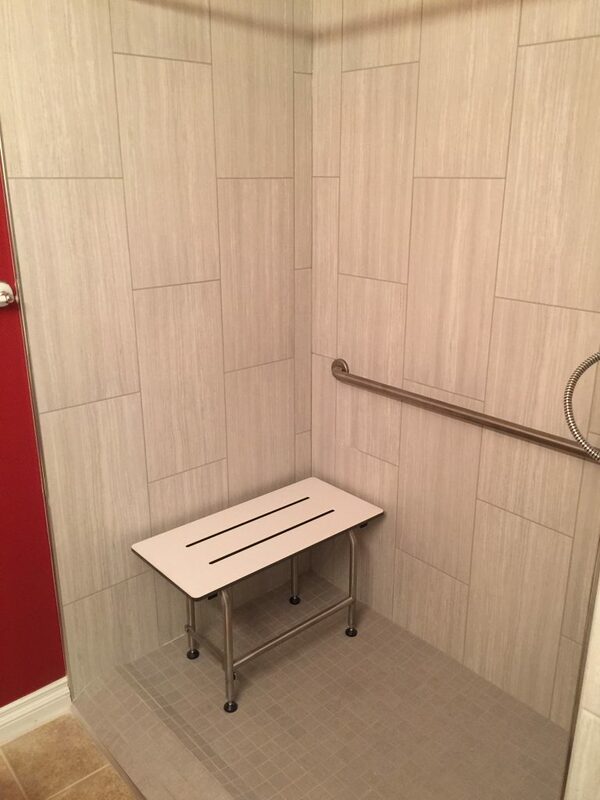 Millwoods Accessibility Renovations: This curb-less shower has a fold up shower seat and a tiled corner shelf for soap and shampoo. 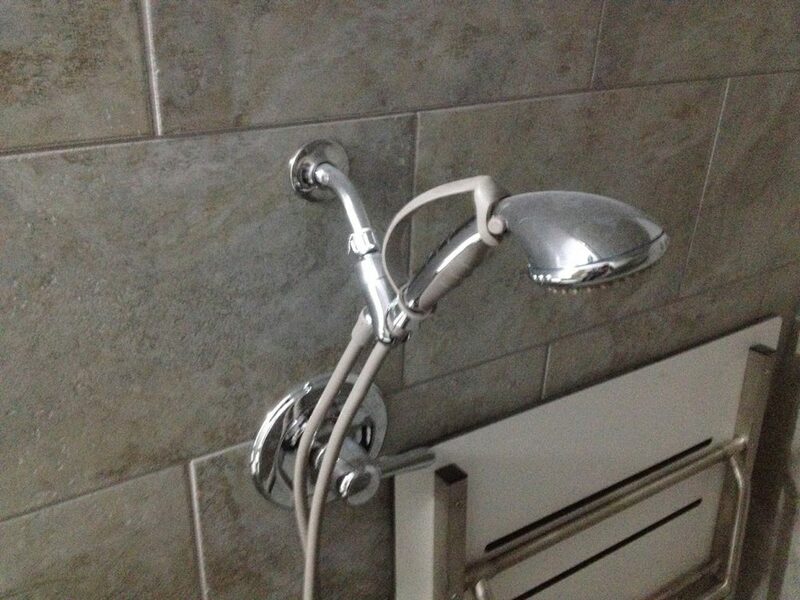 The shower head is height-adjustable for easy reach. 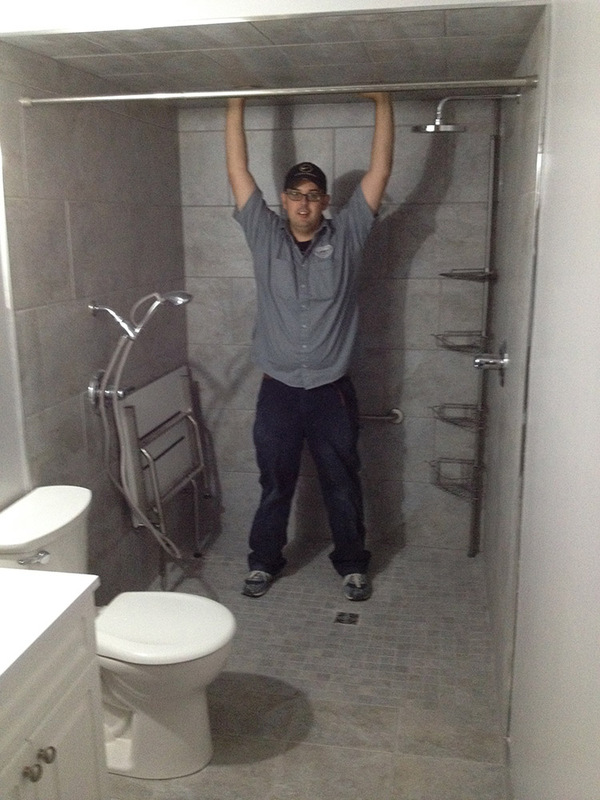 Kensington Accessible Bathroom Renovation: Here's Michael having a bit of fun in the just-completed bathroom. 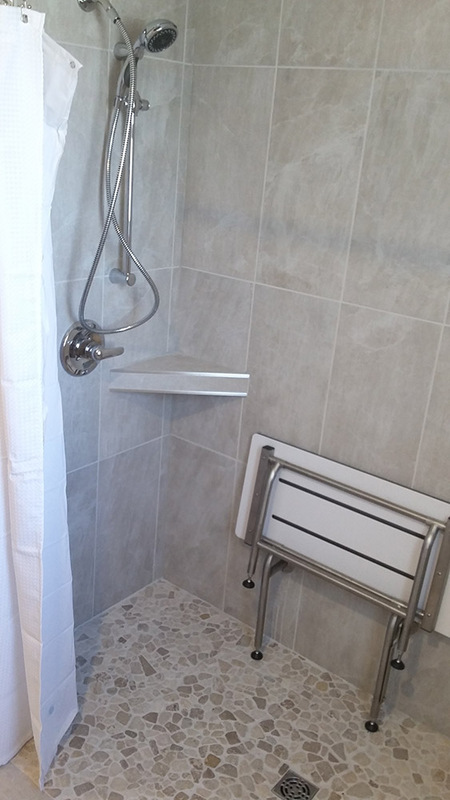 The bathroom includes a fold up shower seat, rain head and comfort height toilet. 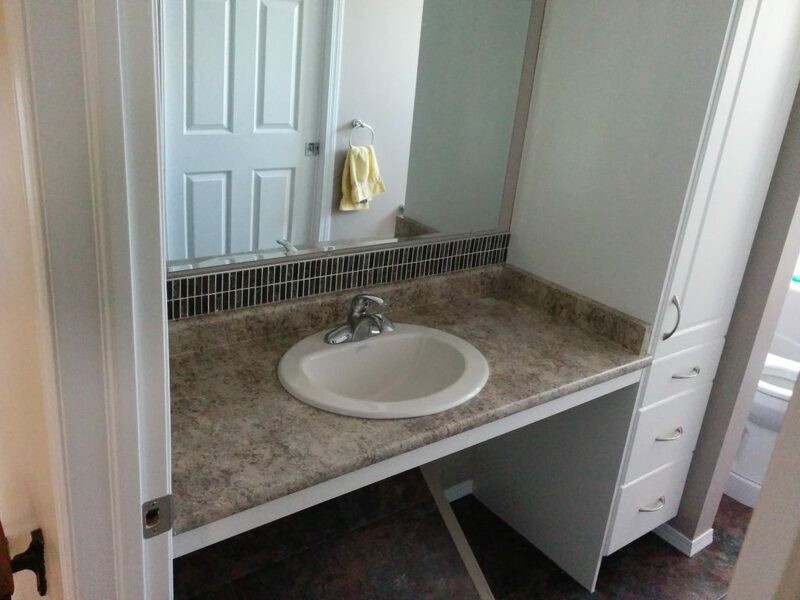 Everything is accessible with a walker. 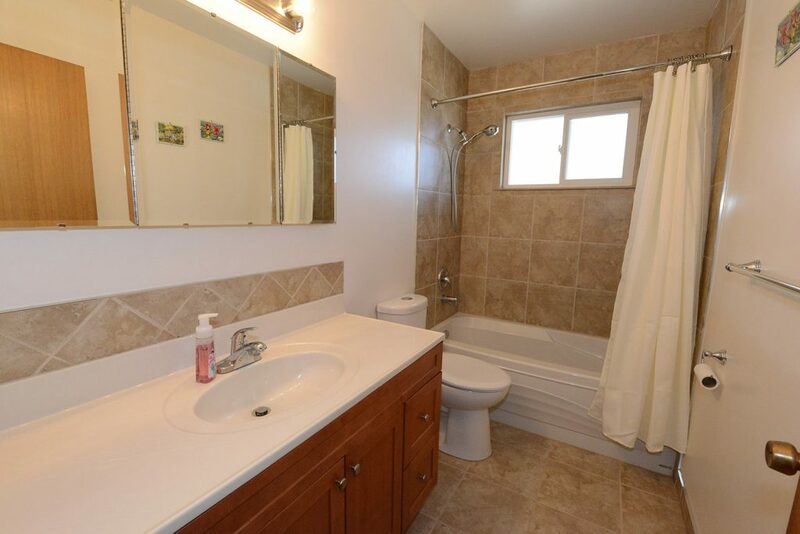 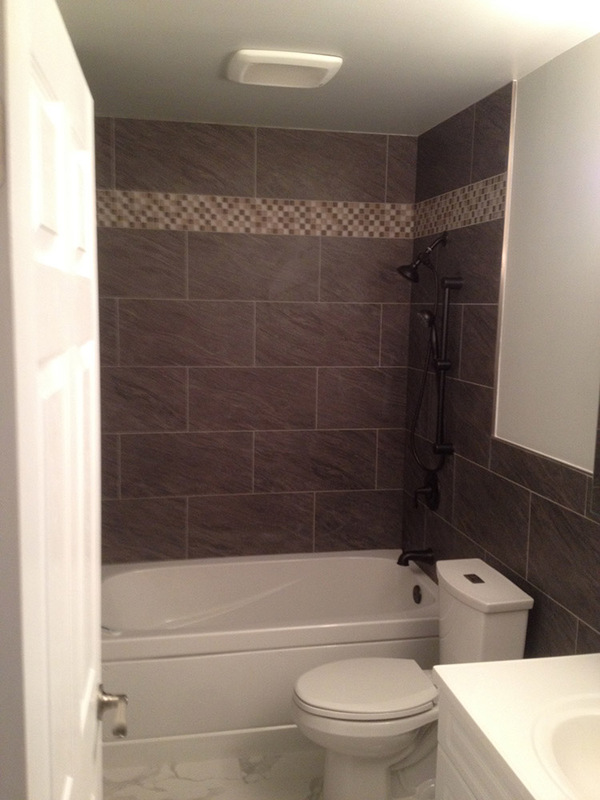 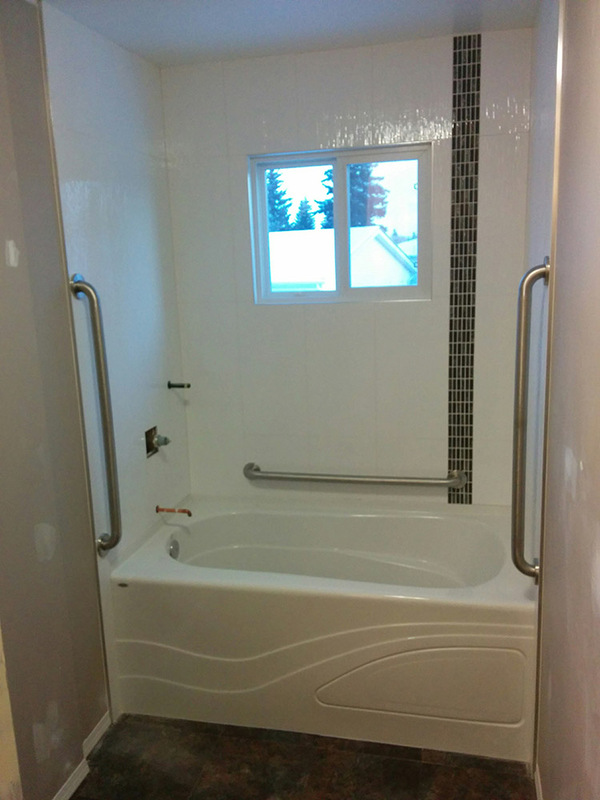 Millwoods Accessible Renovation: This beautiful bathtub used to be where the ensuite bathroom was located. 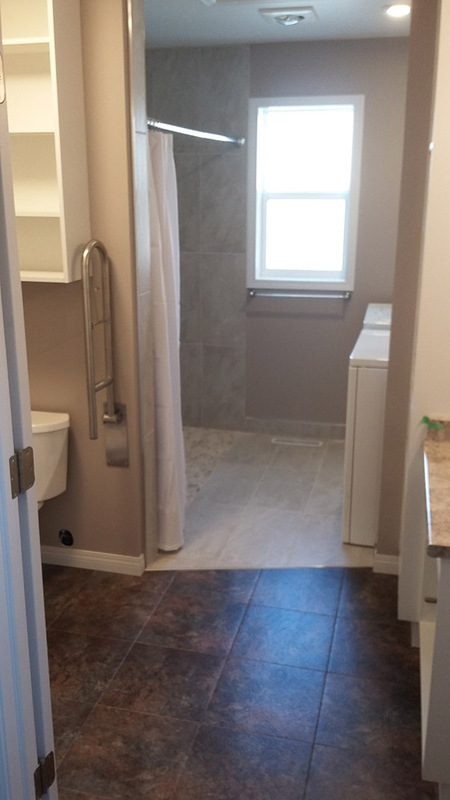 We removed the wall between the main bathroom and the ensuite bathroom to make one large bathroom, both accessible from the hallway and the bedroom (via a pocket door). 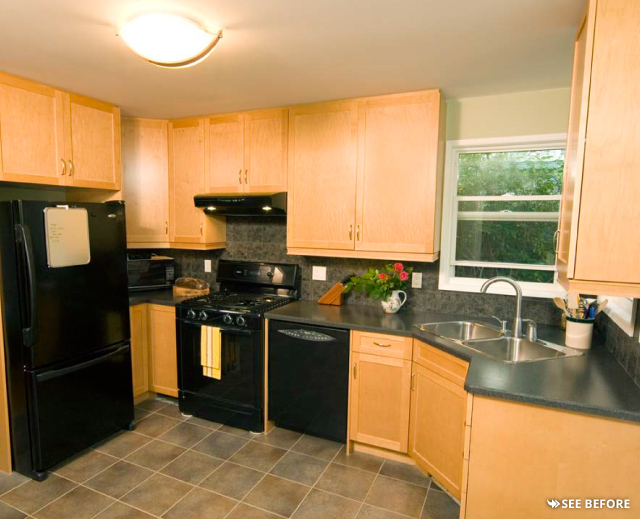 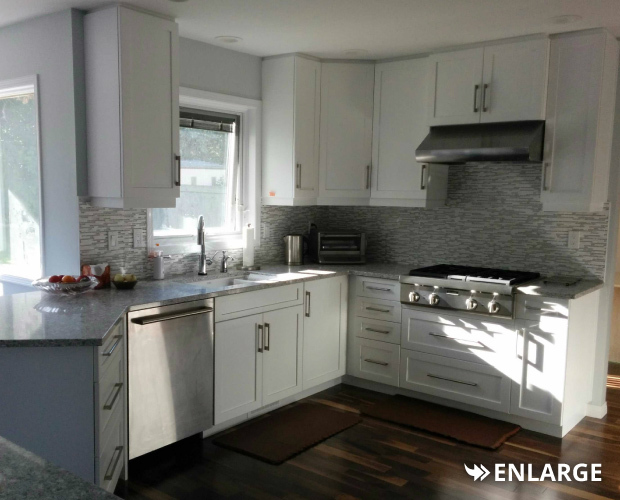 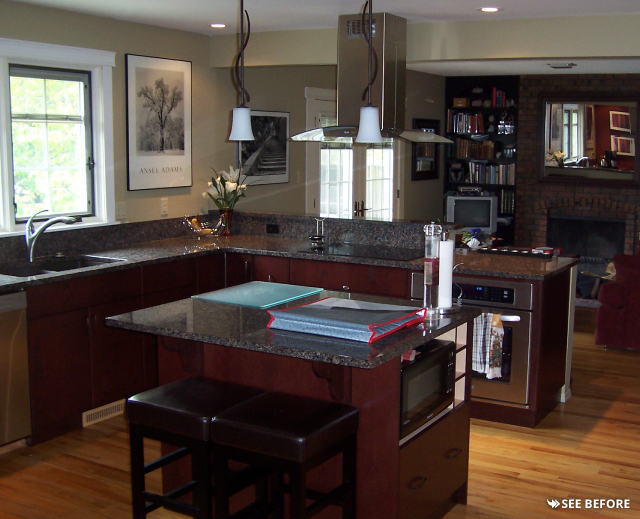 This beautiful kitchen used to be defined by a wall separating it from the dining room and living room. 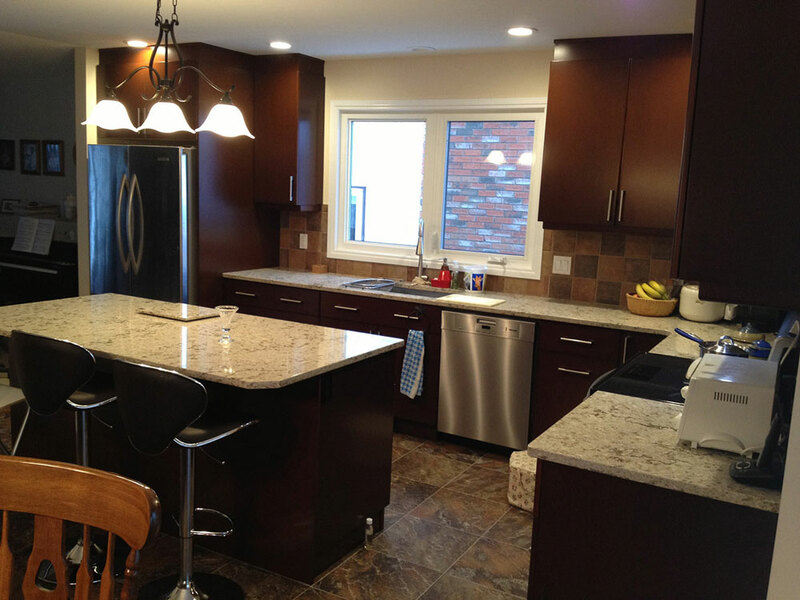 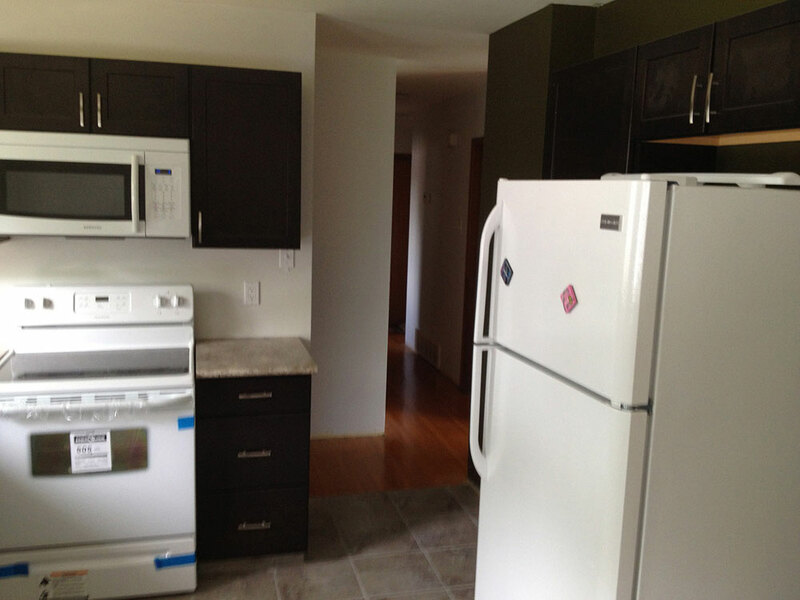 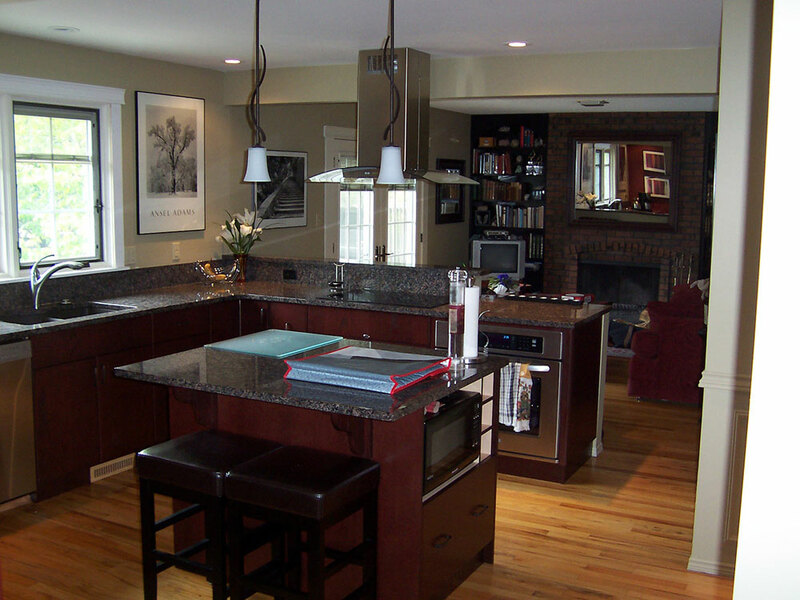 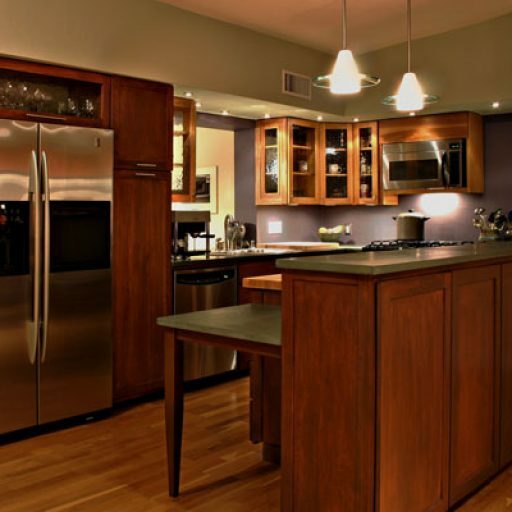 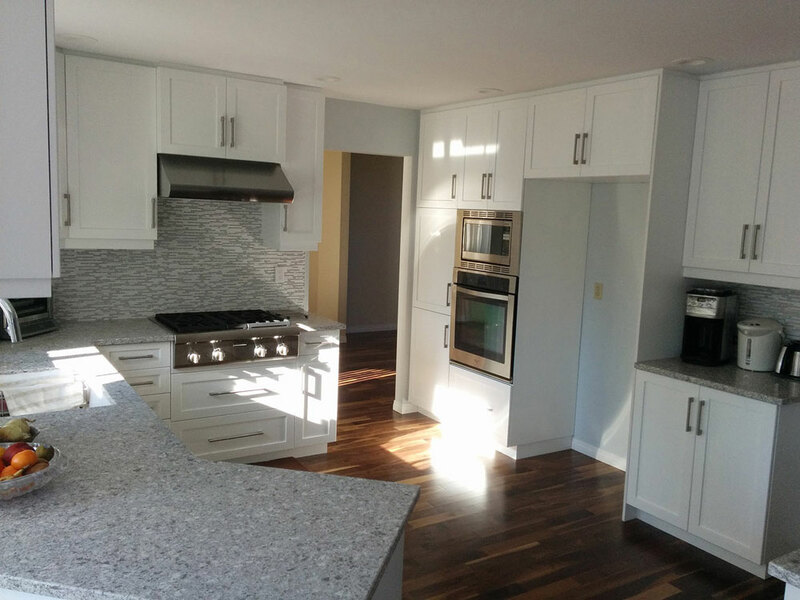 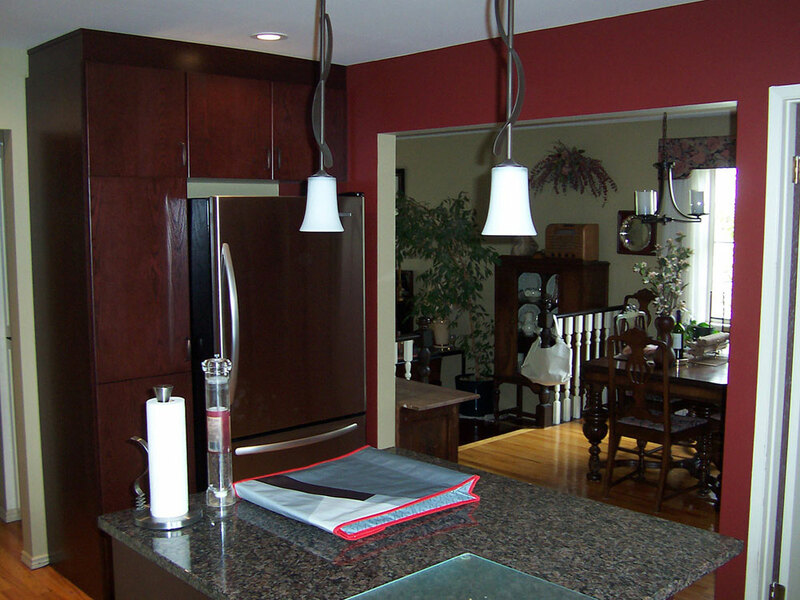 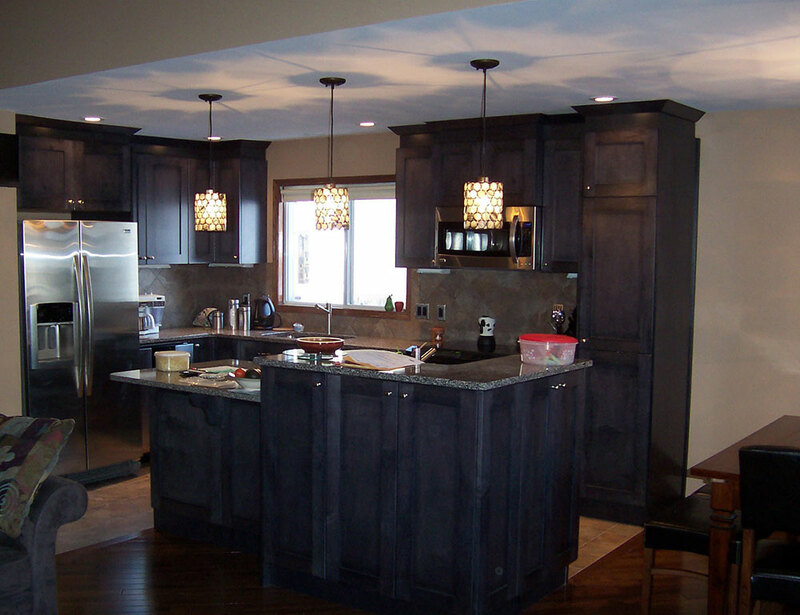 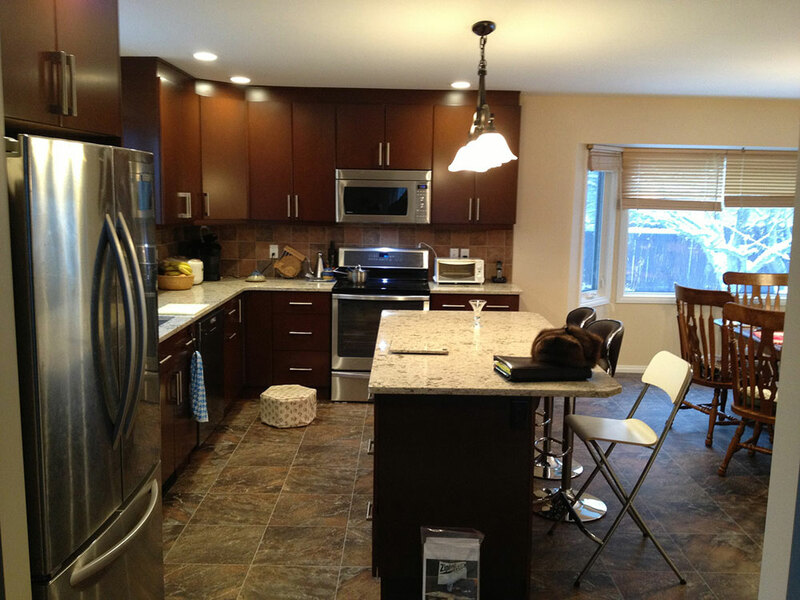 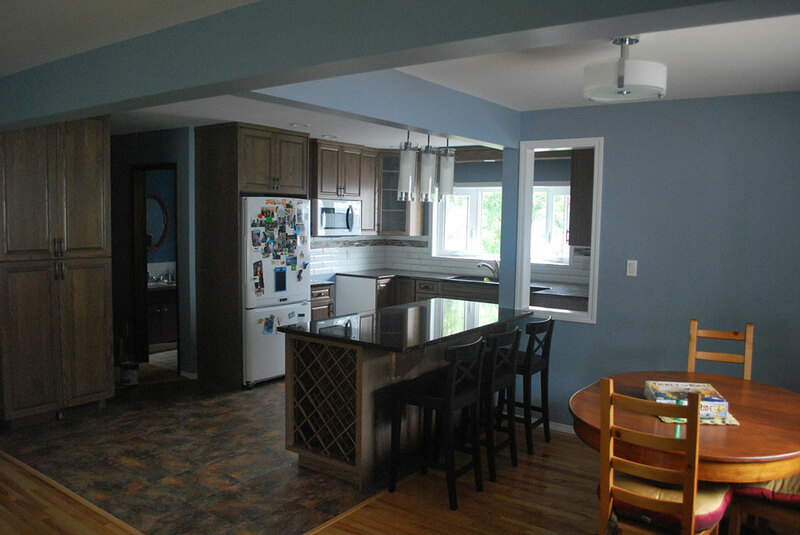 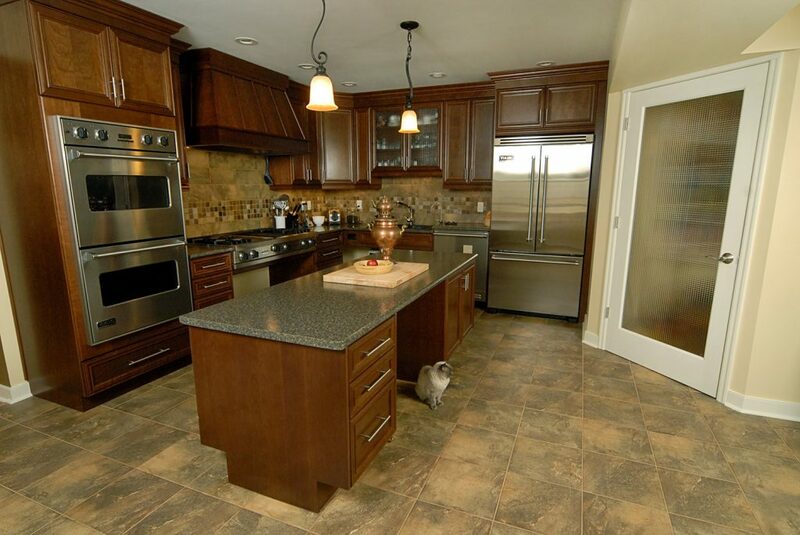 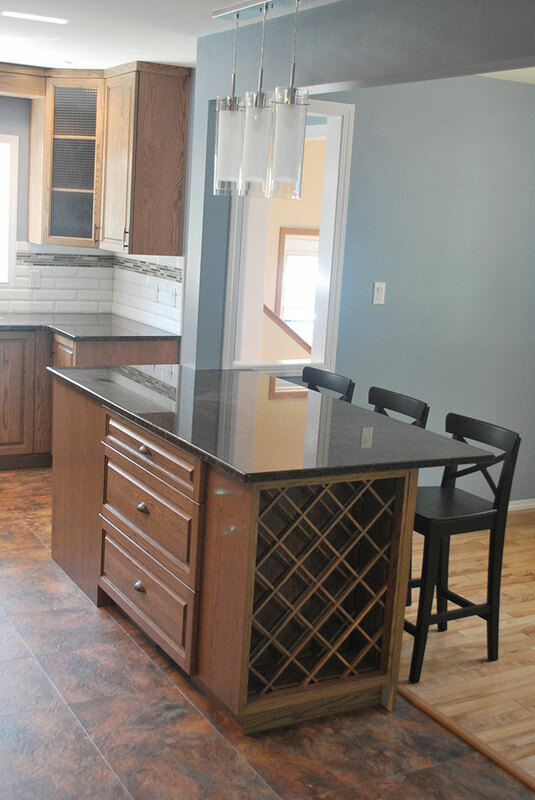 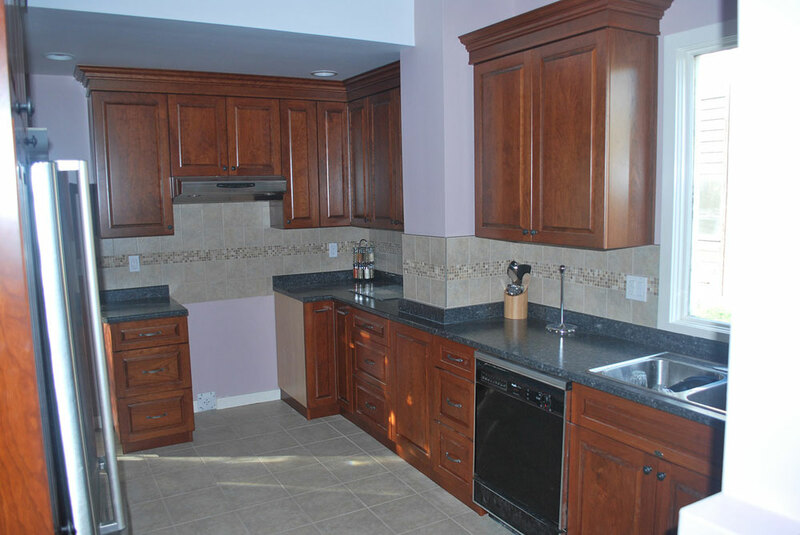 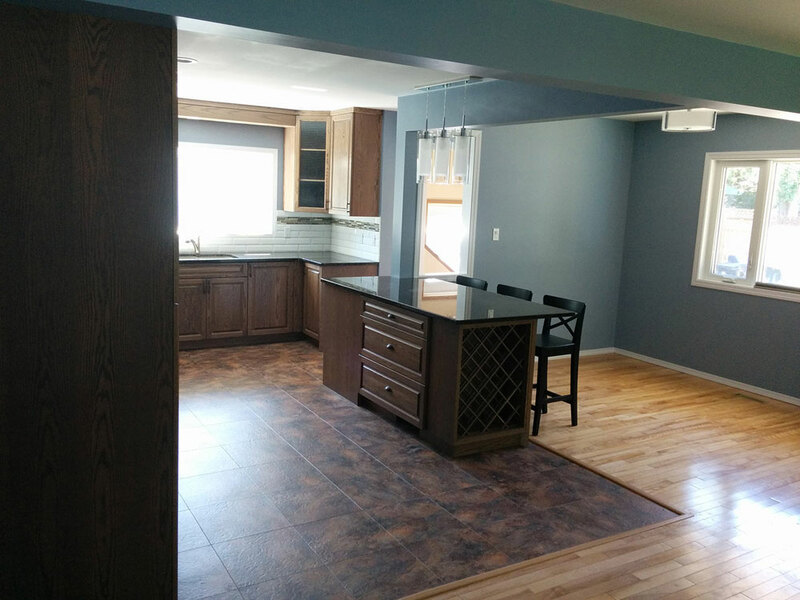 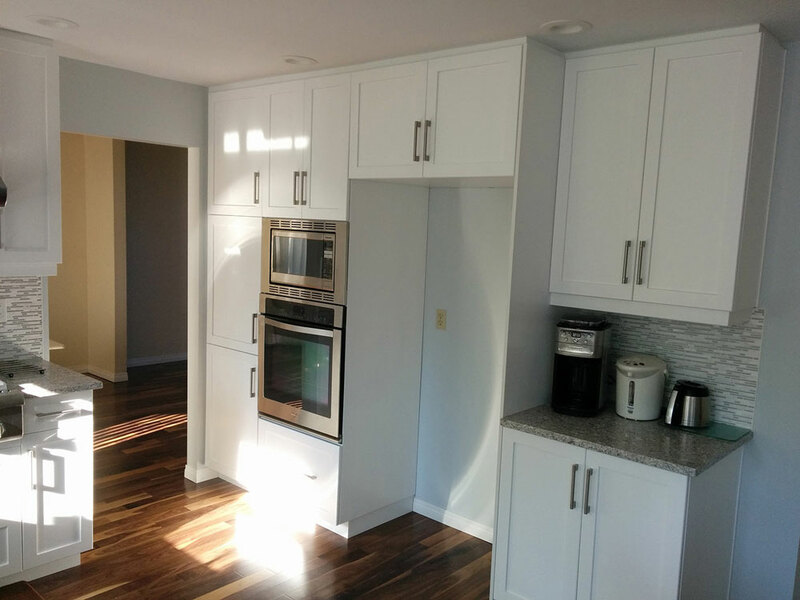 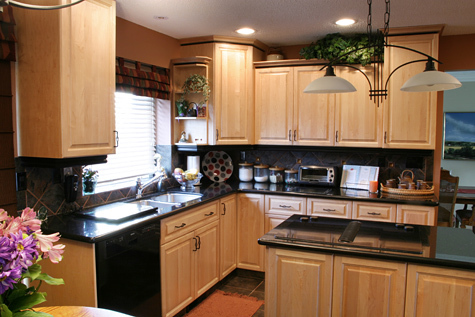 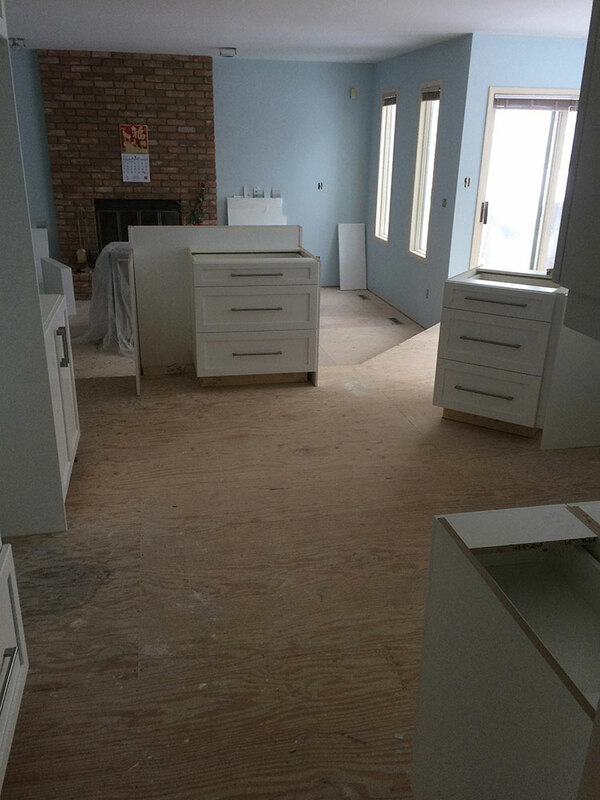 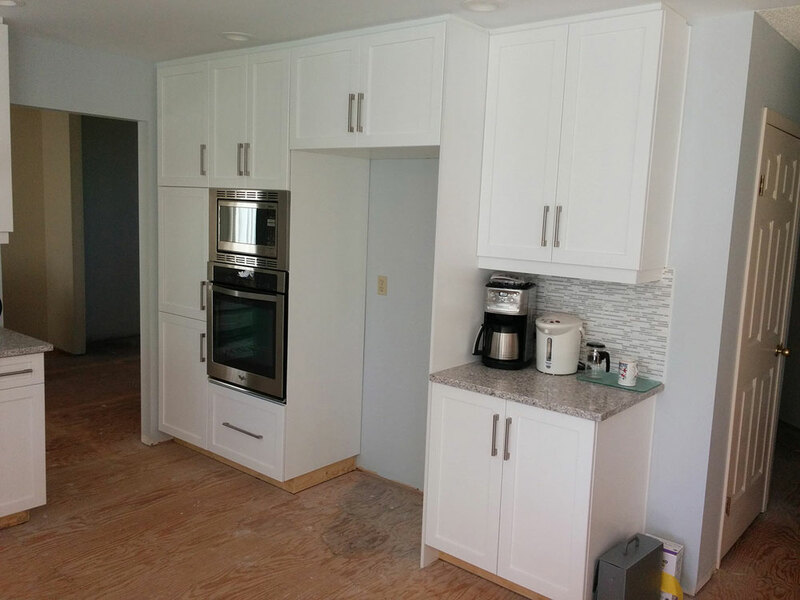 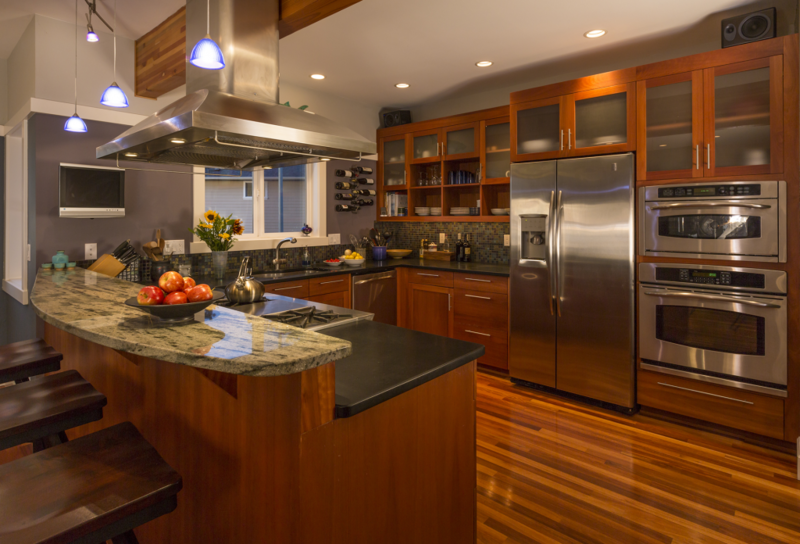 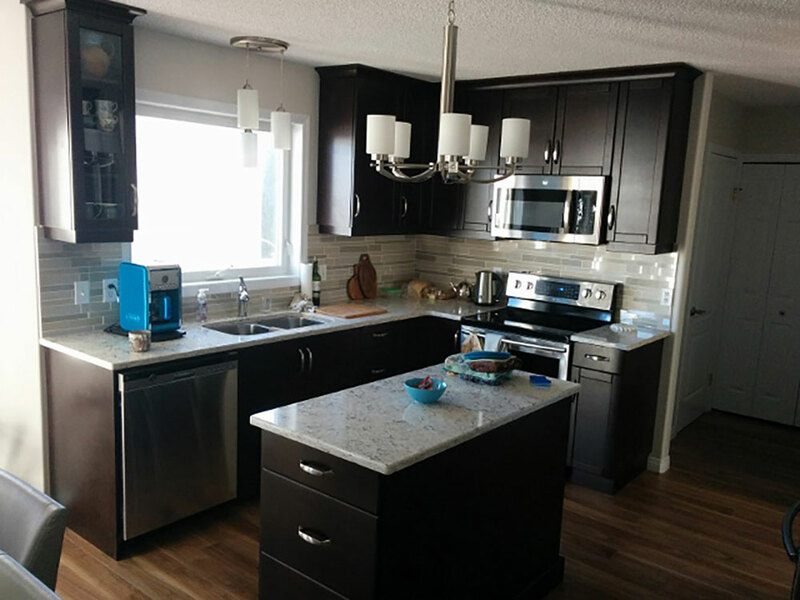 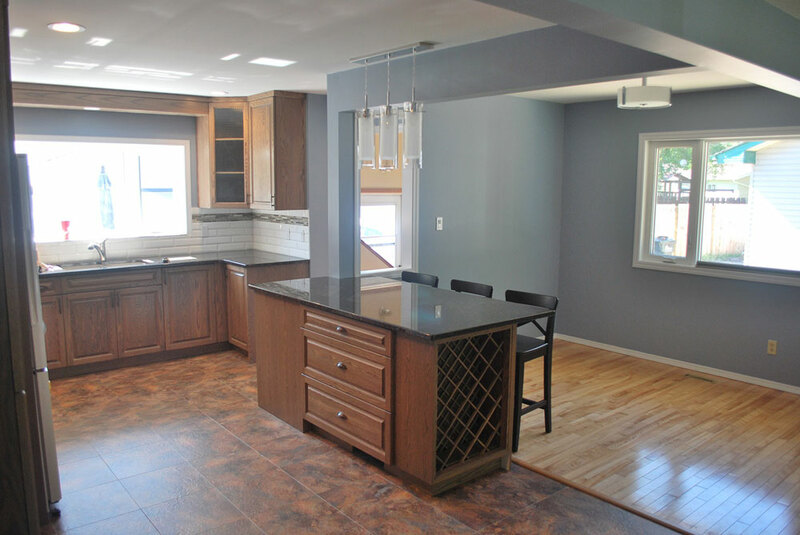 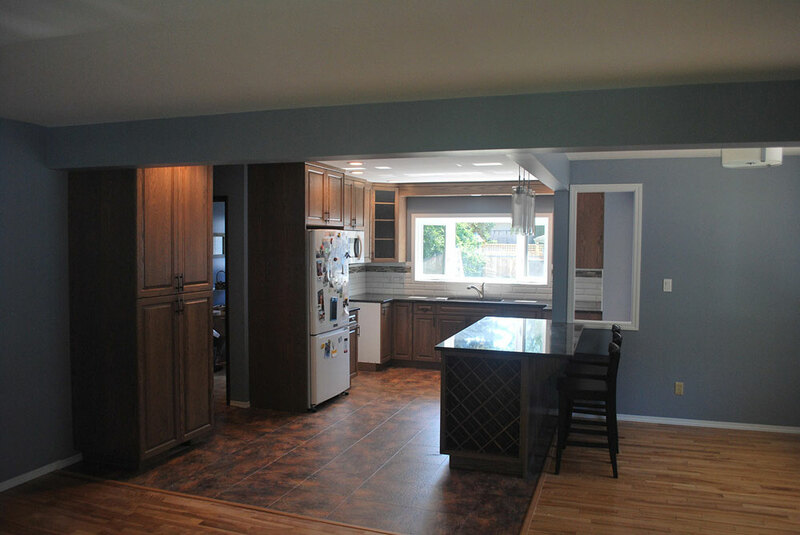 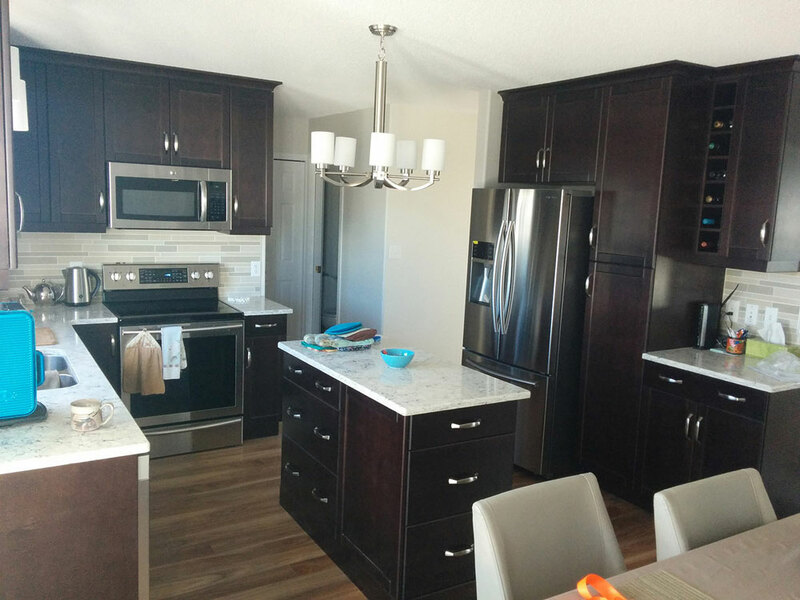 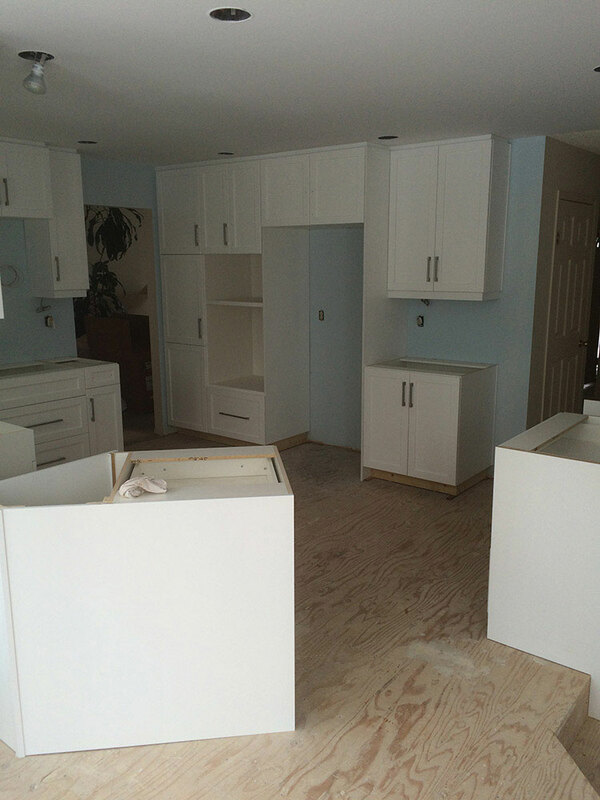 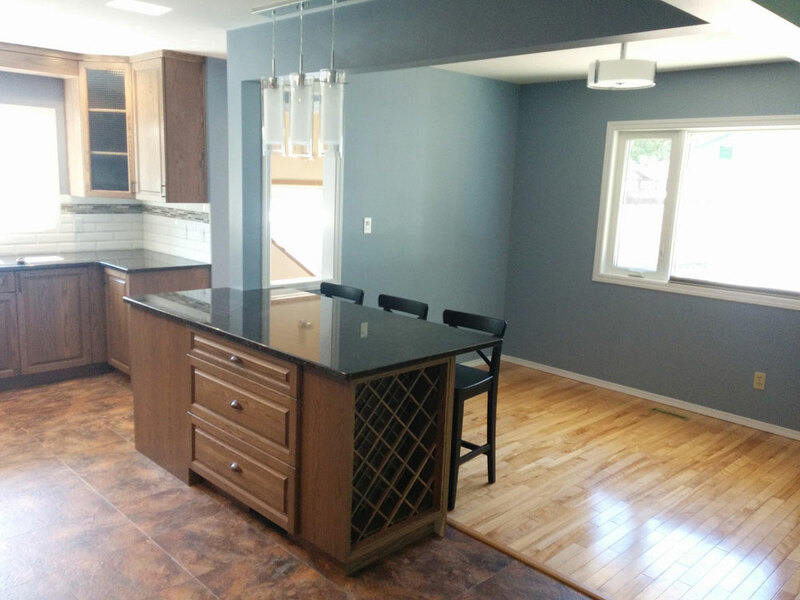 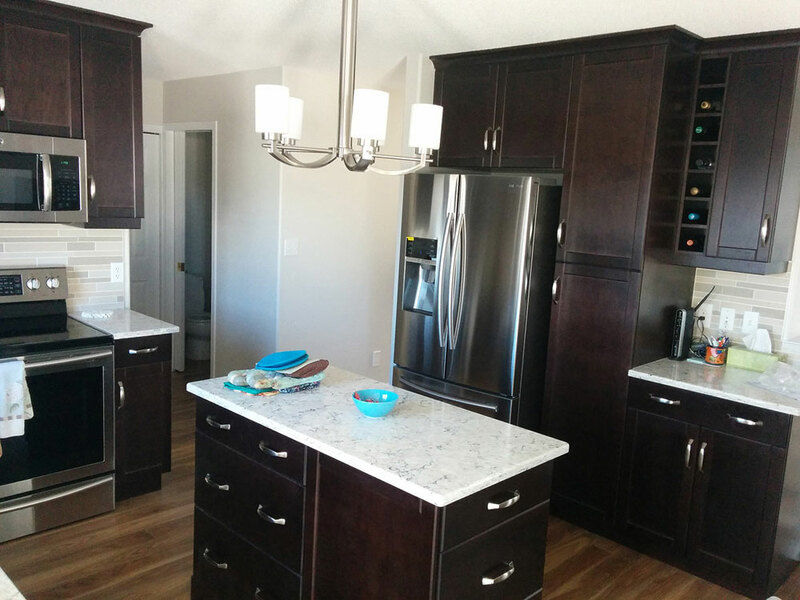 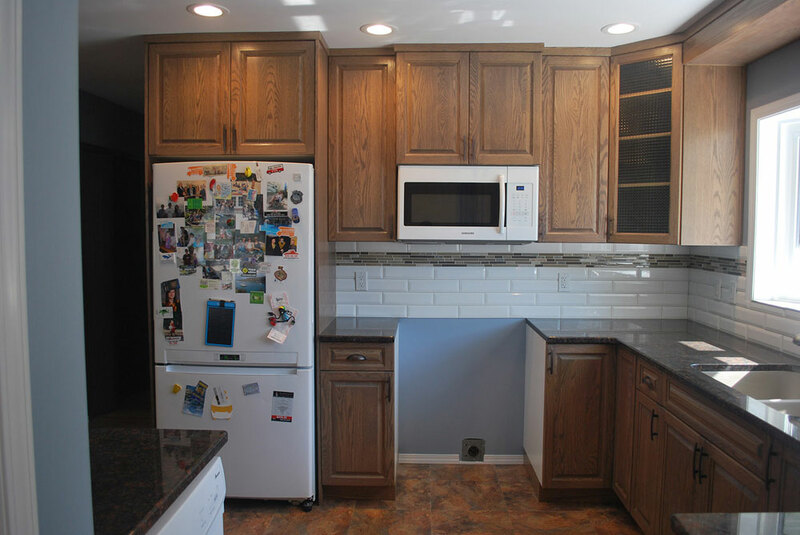 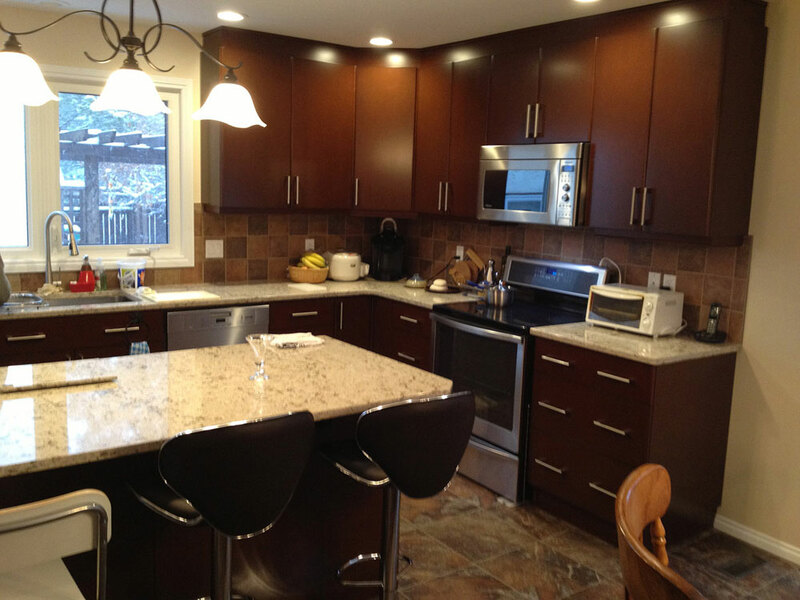 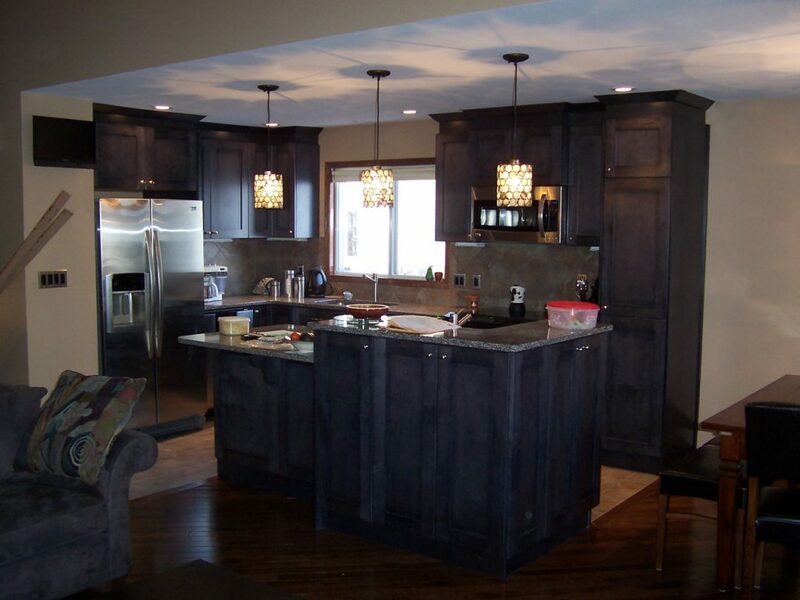 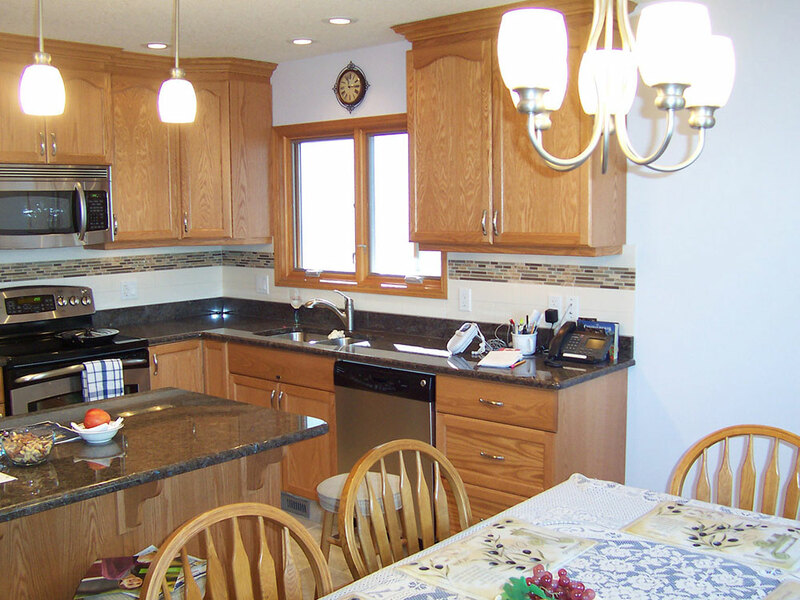 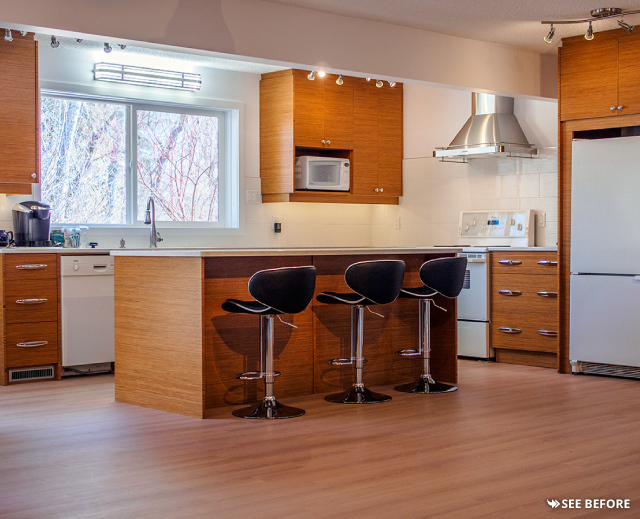 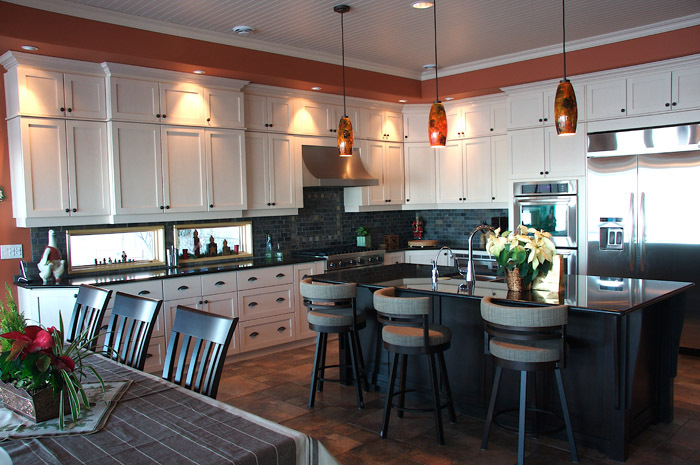 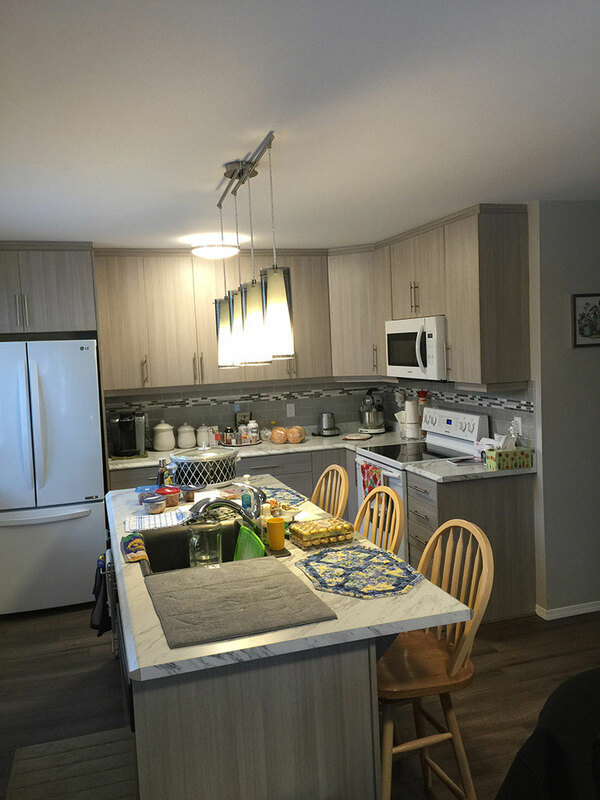 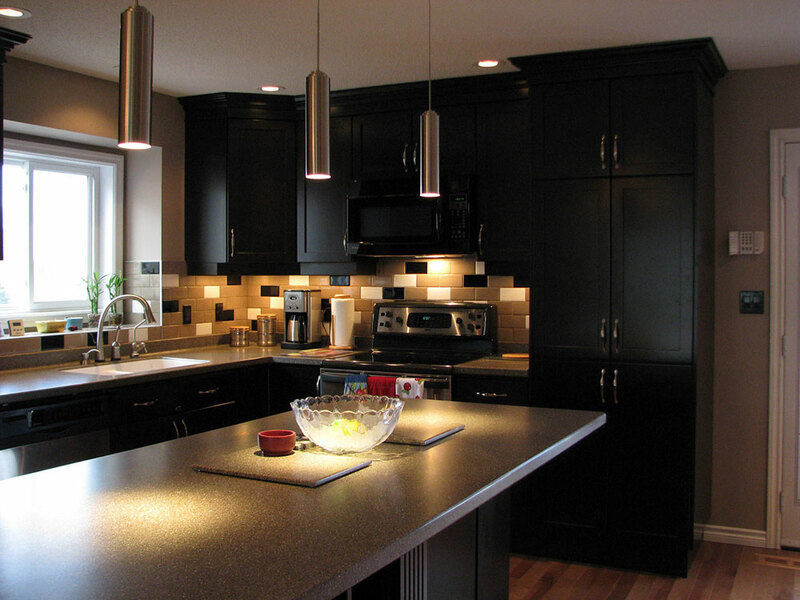 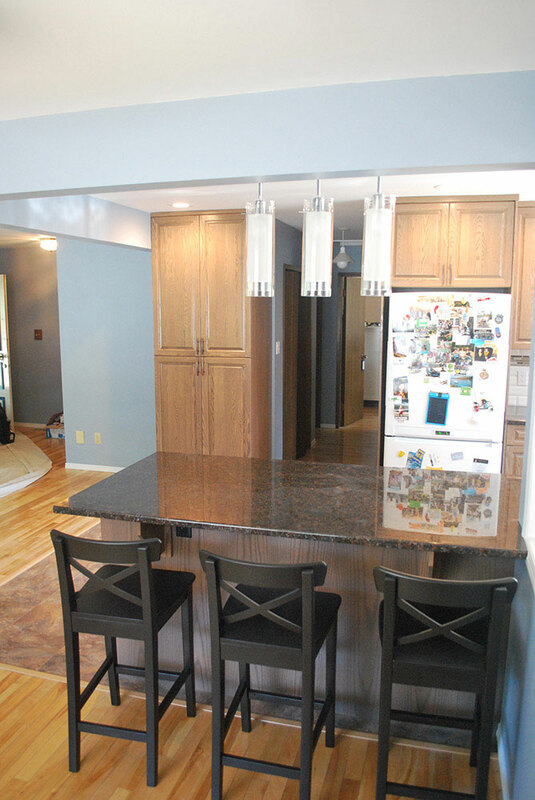 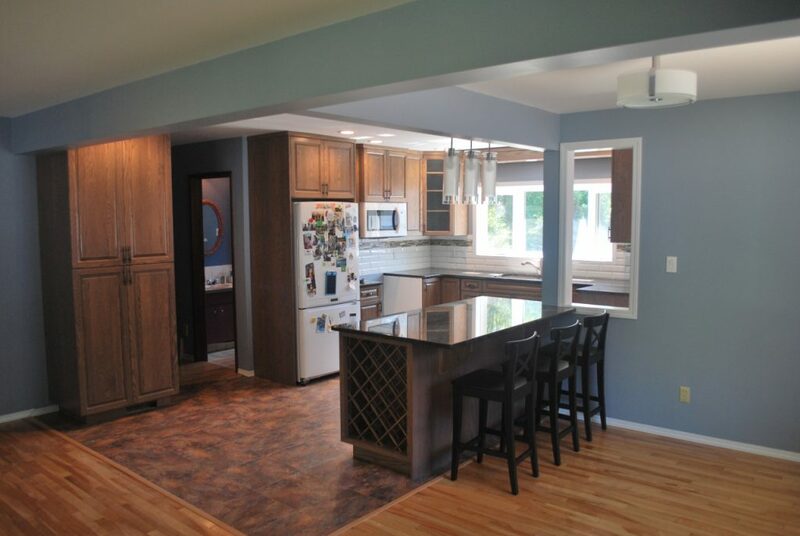 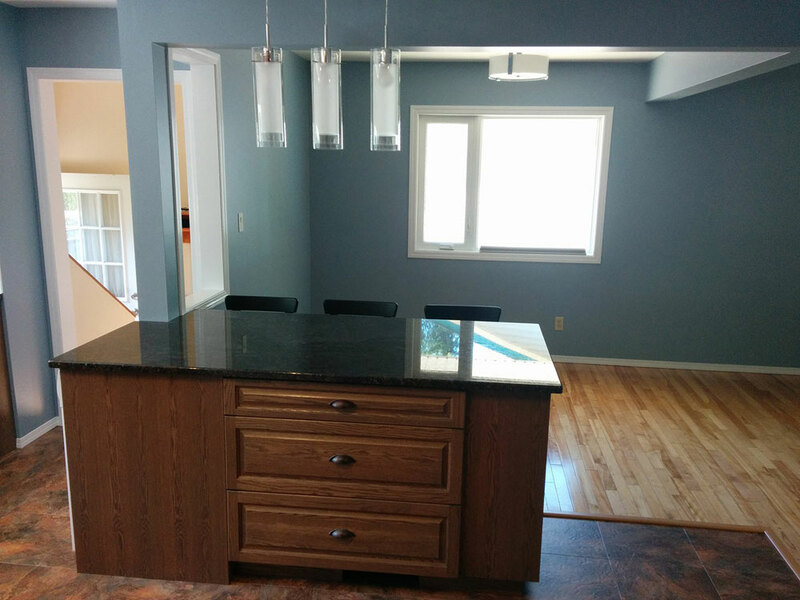 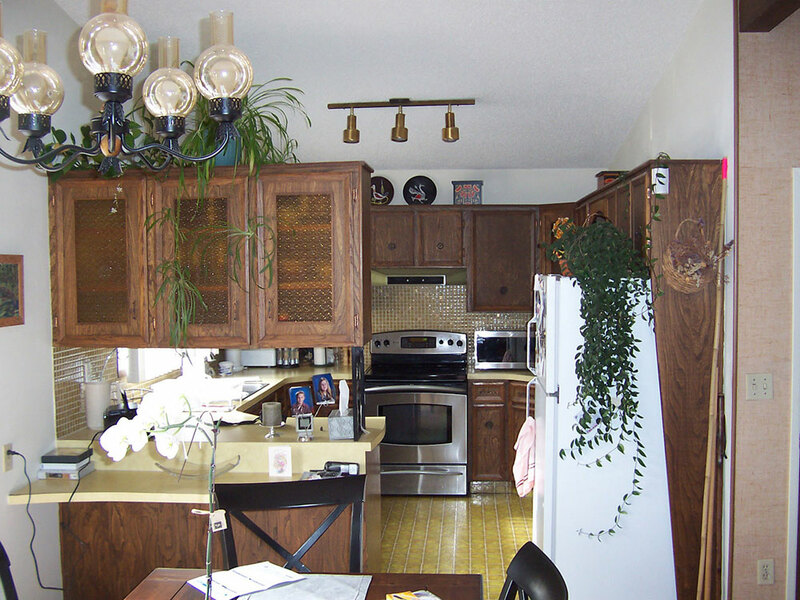 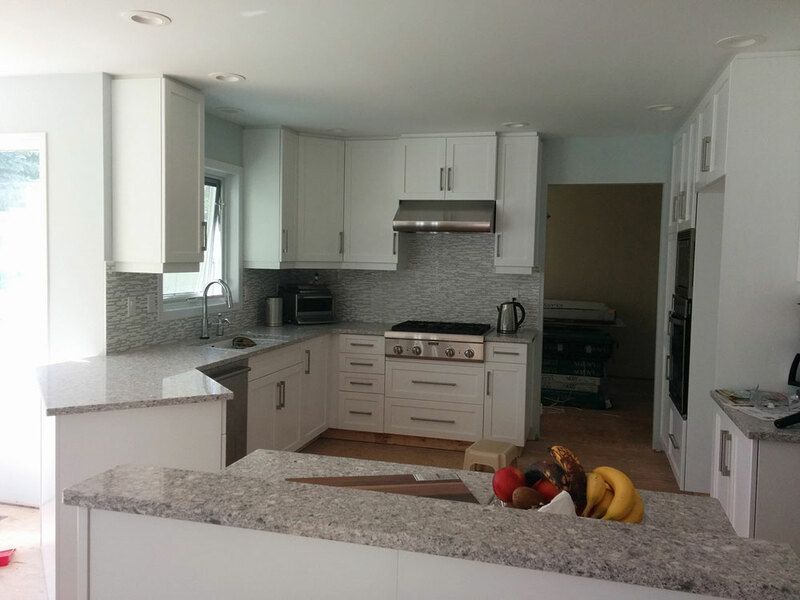 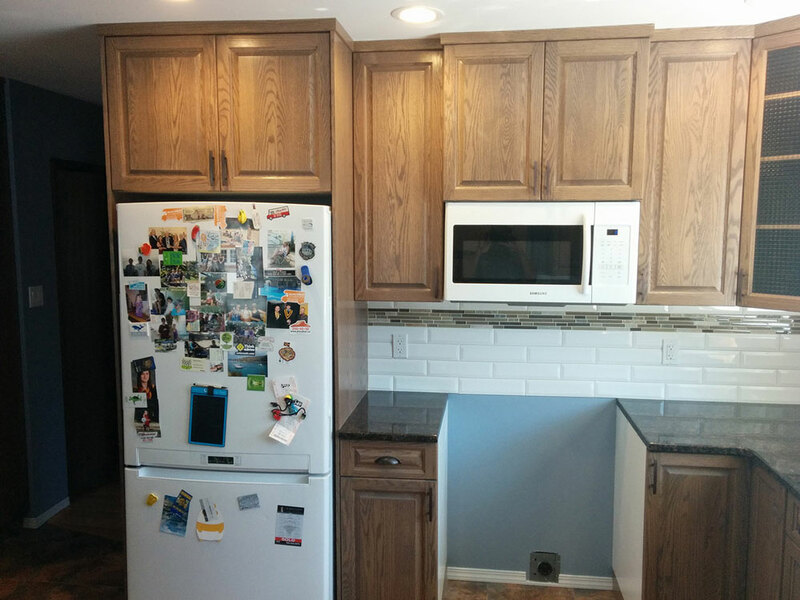 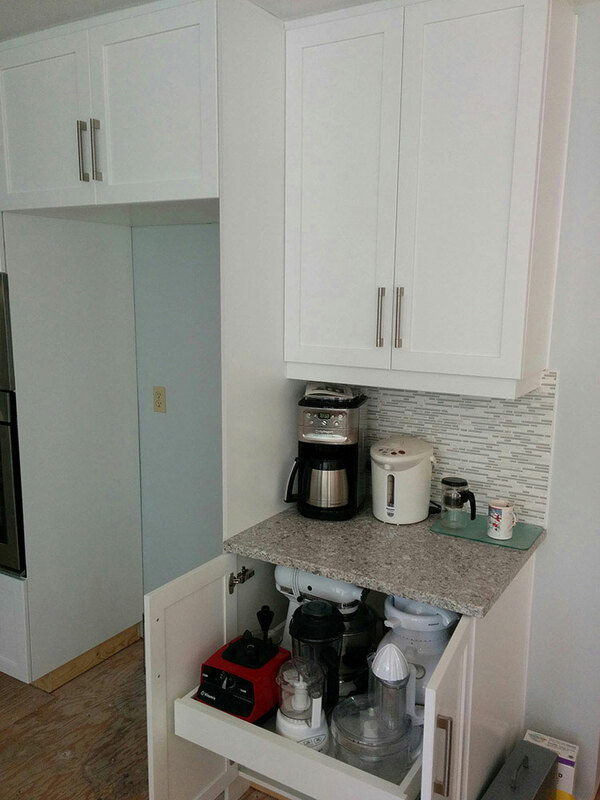 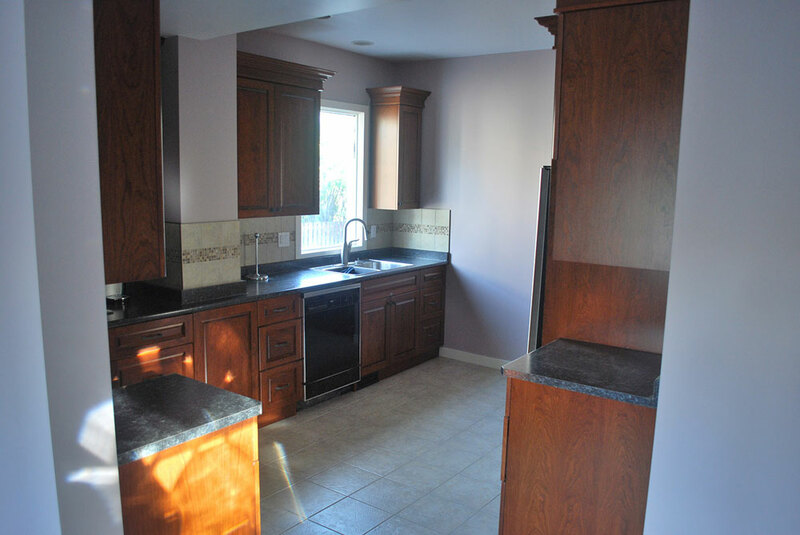 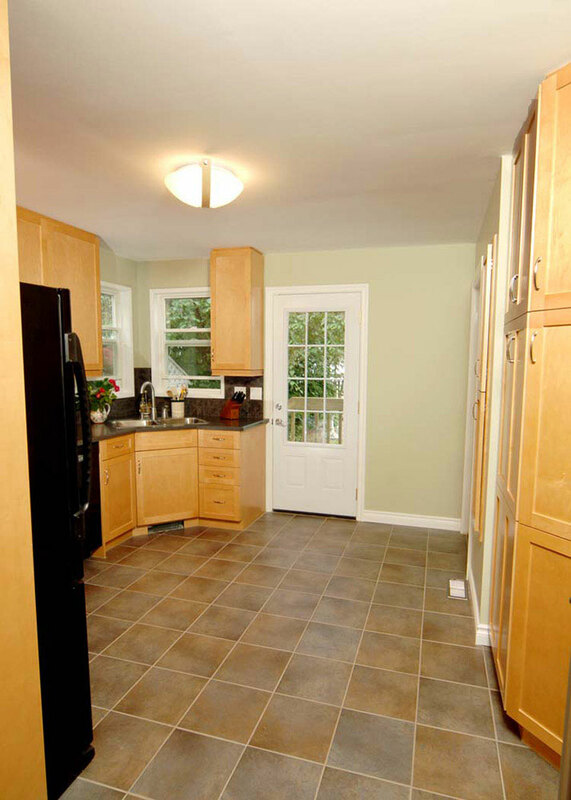 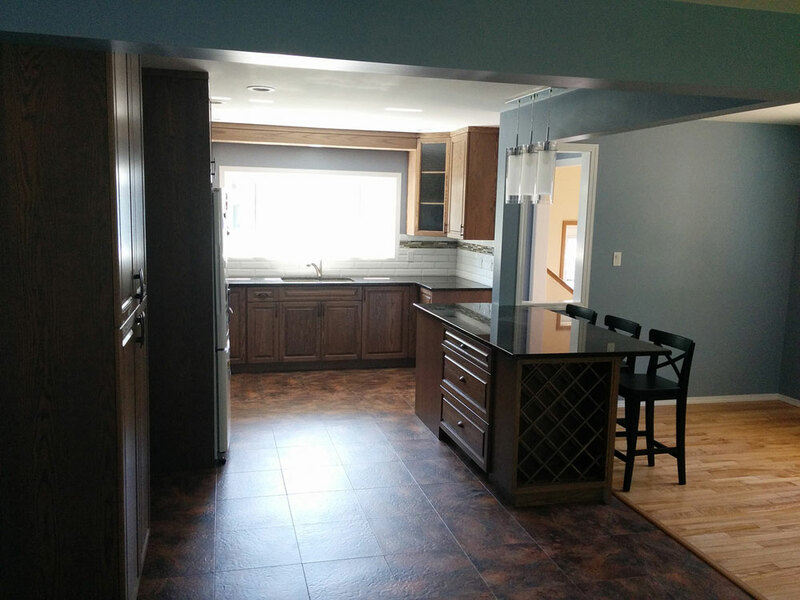 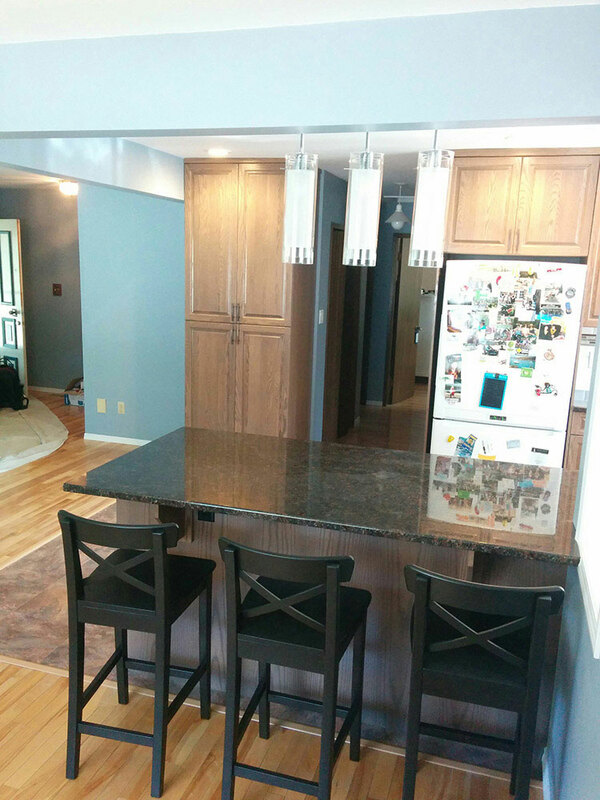 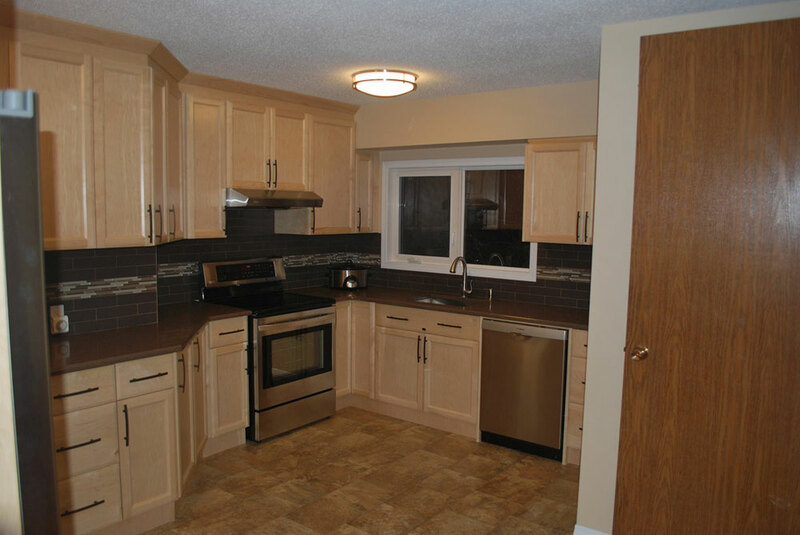 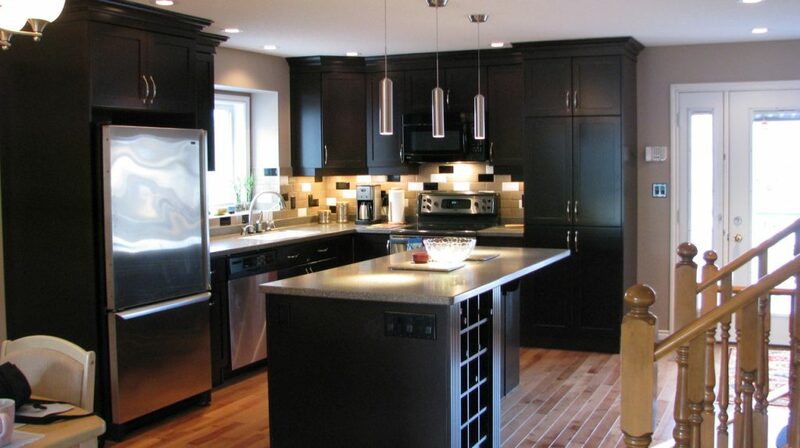 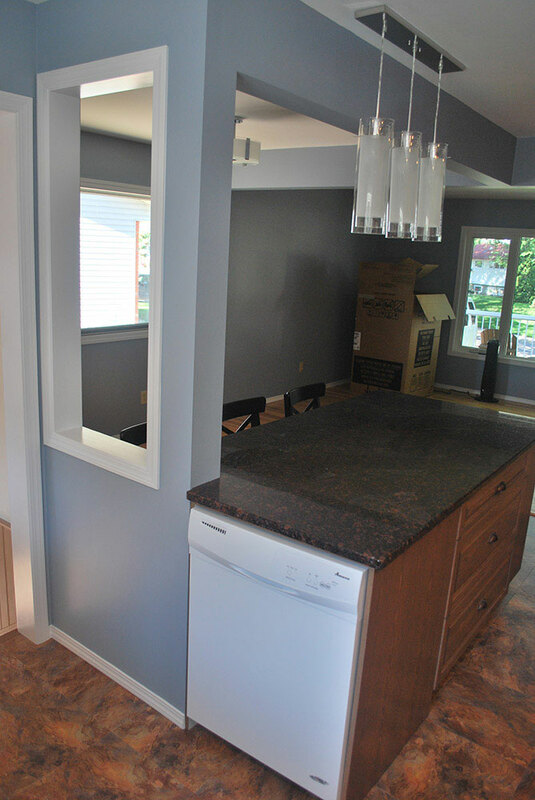 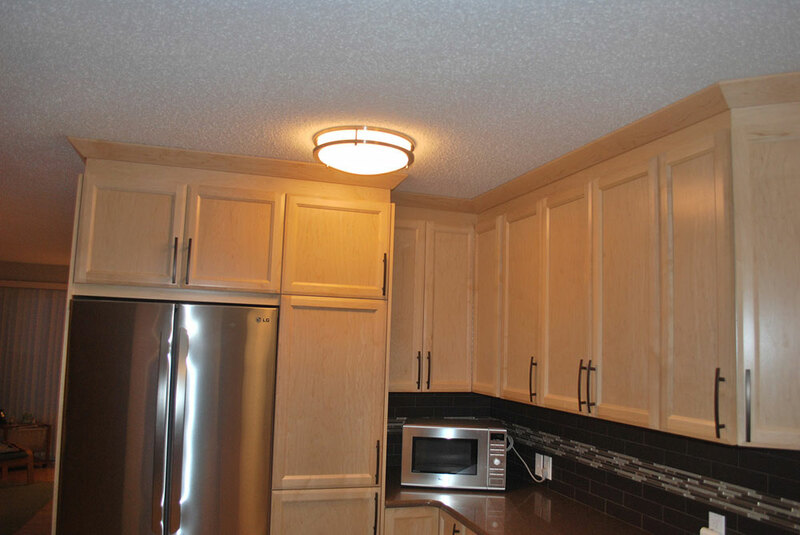 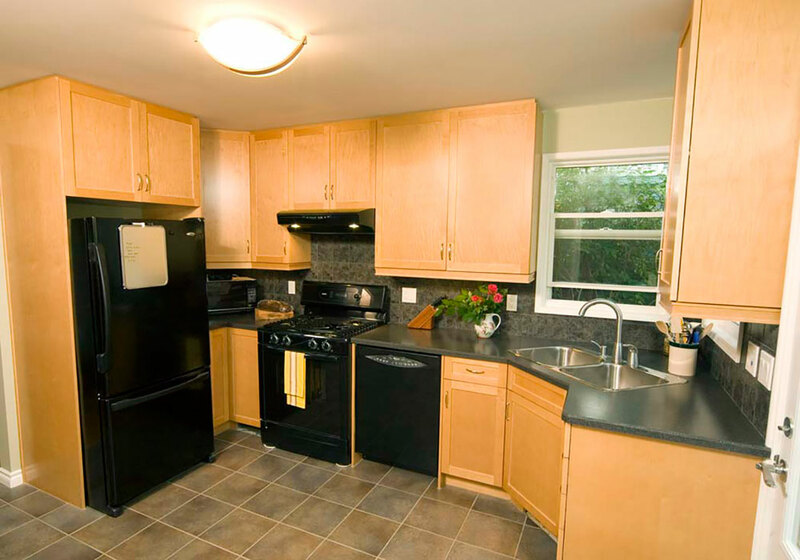 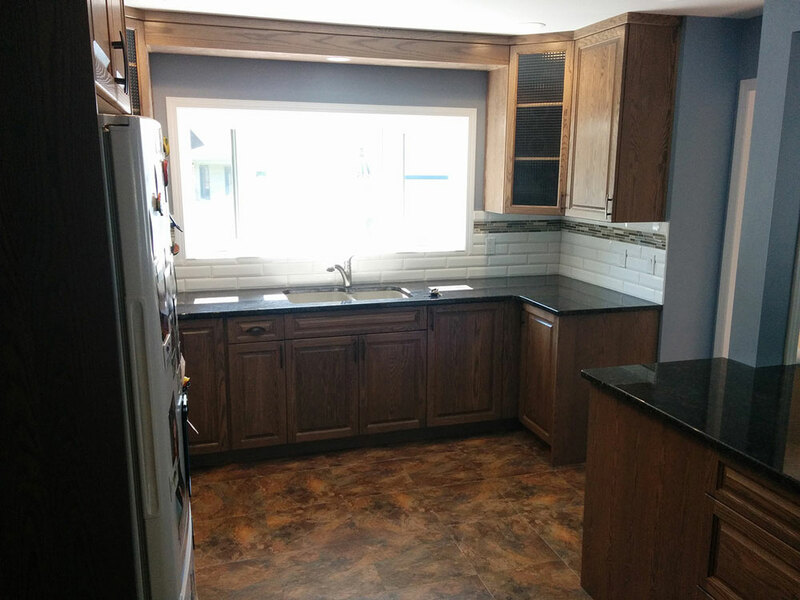 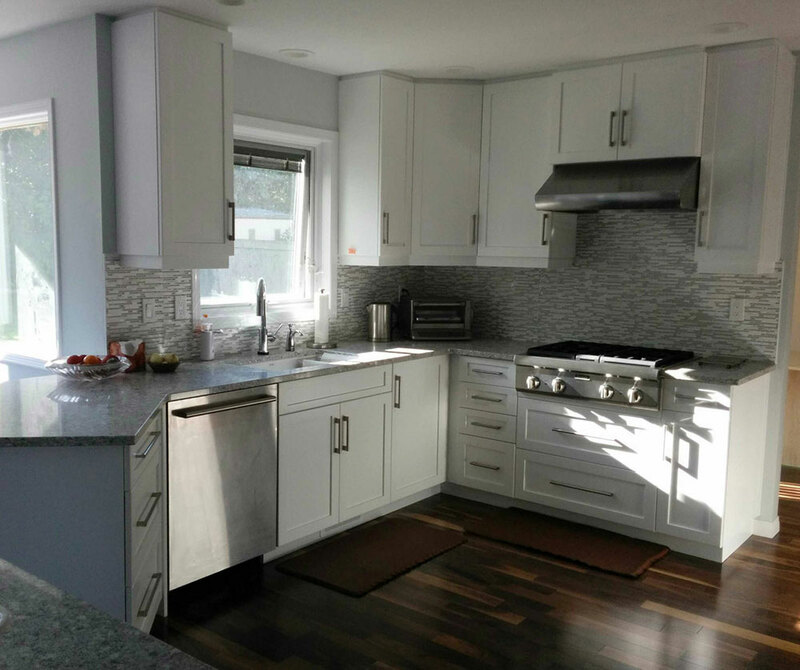 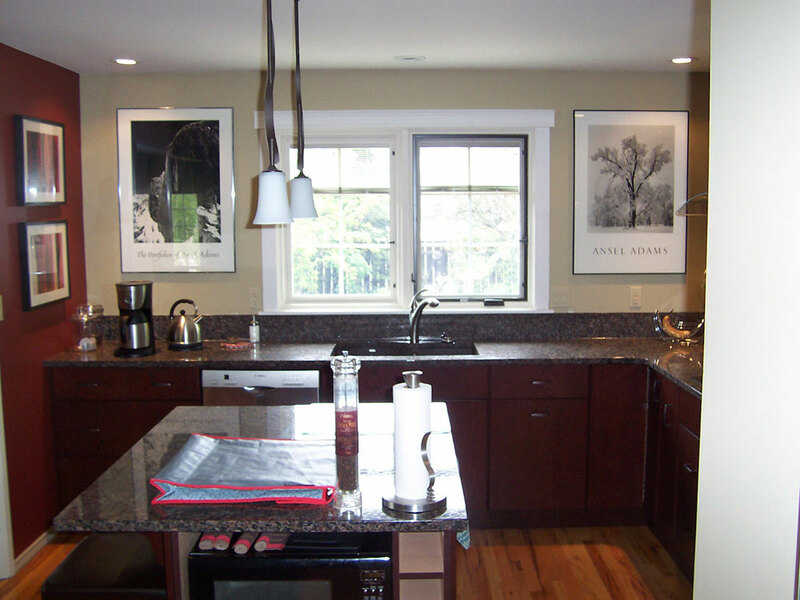 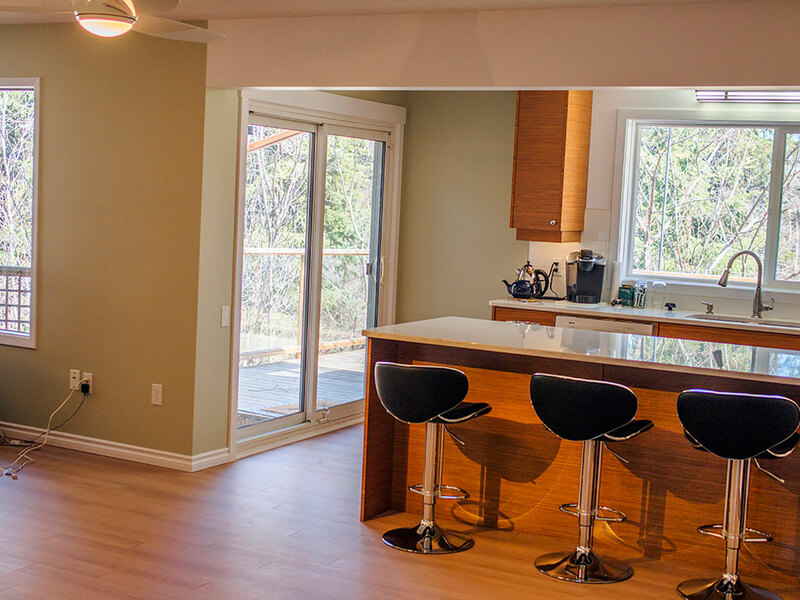 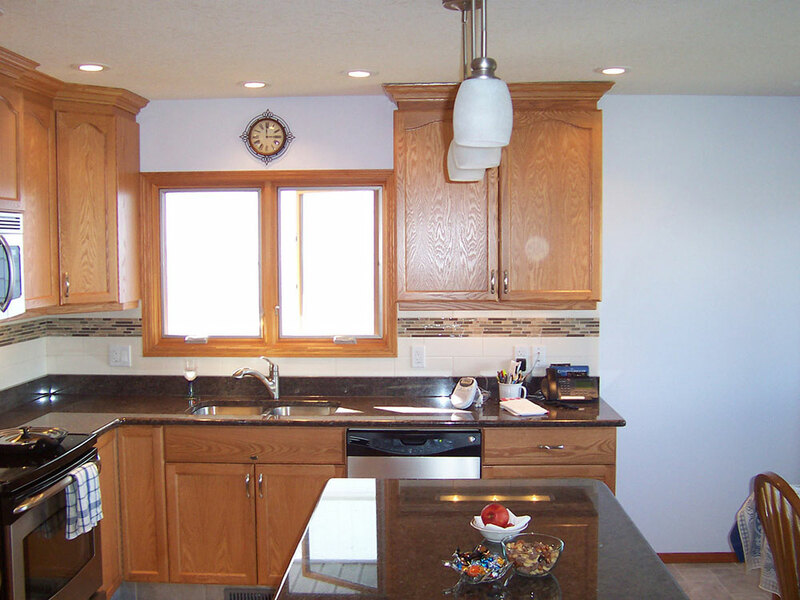 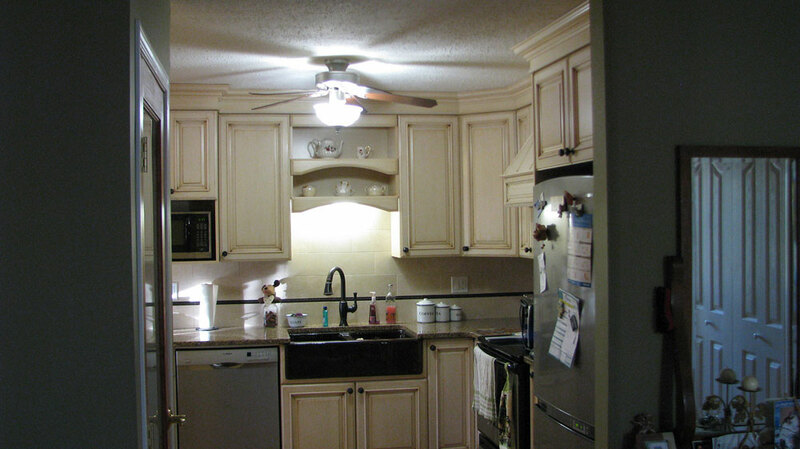 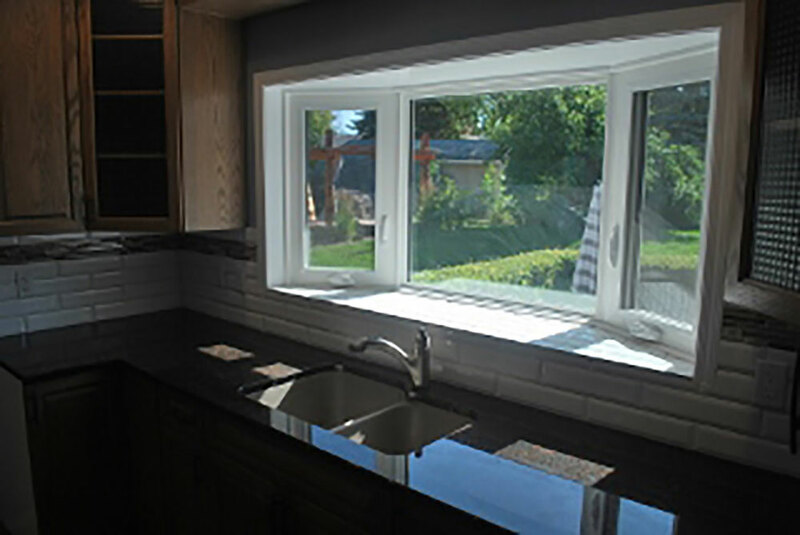 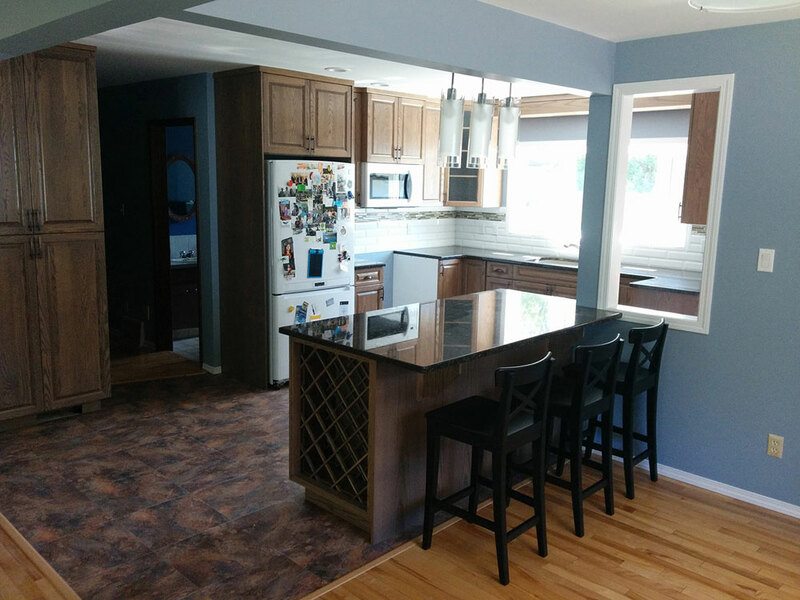 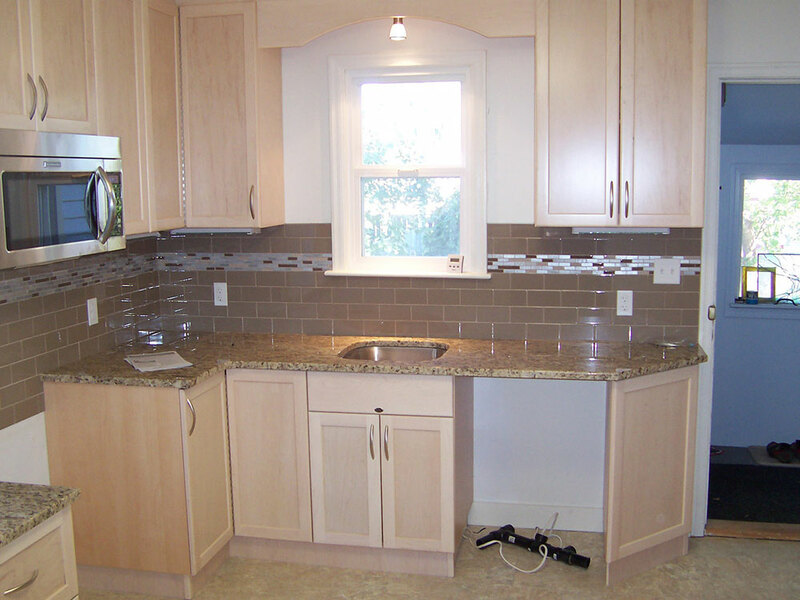 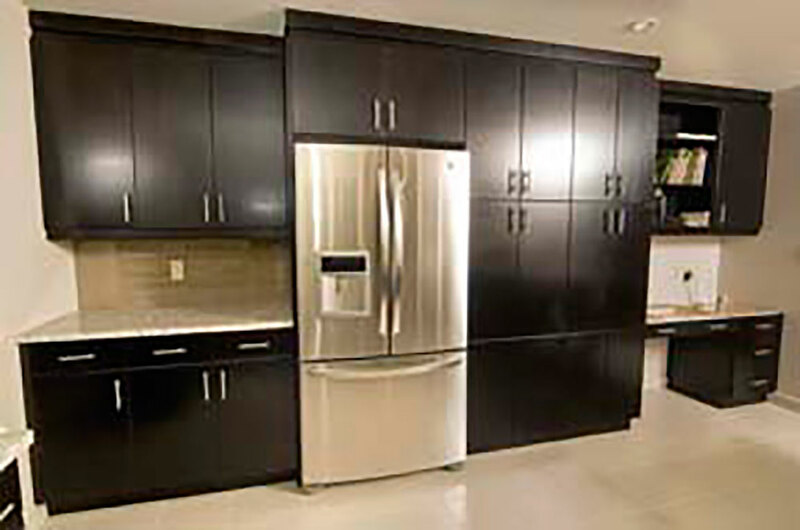 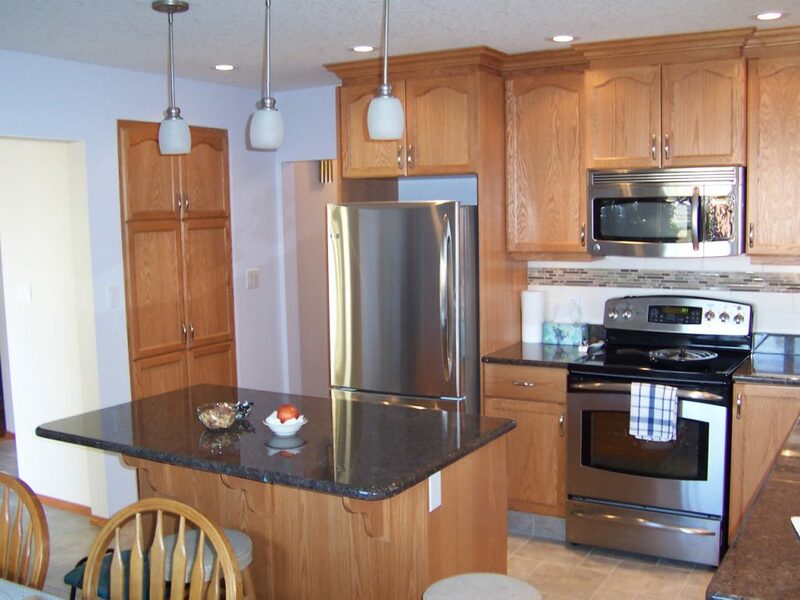 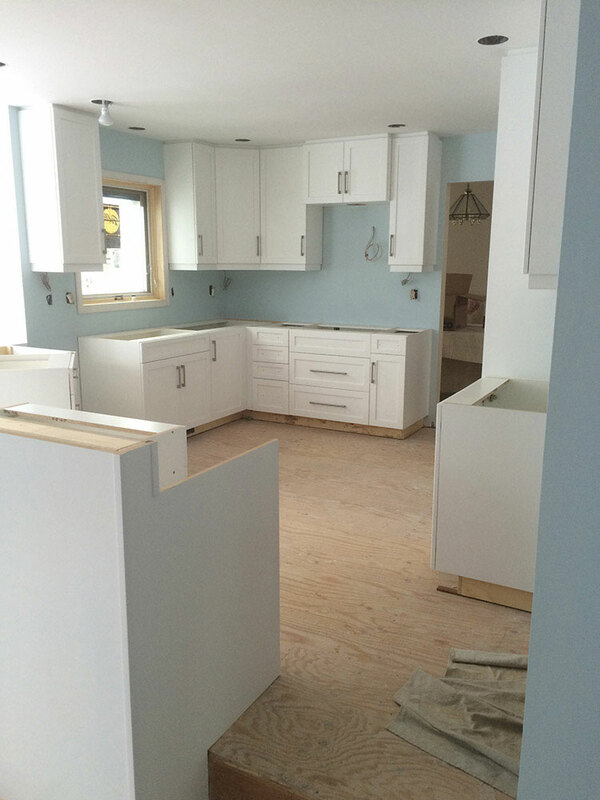 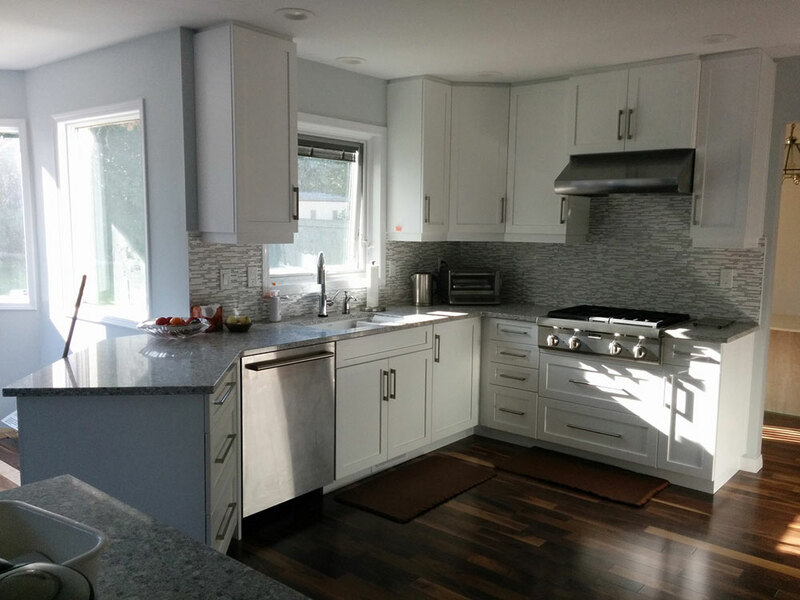 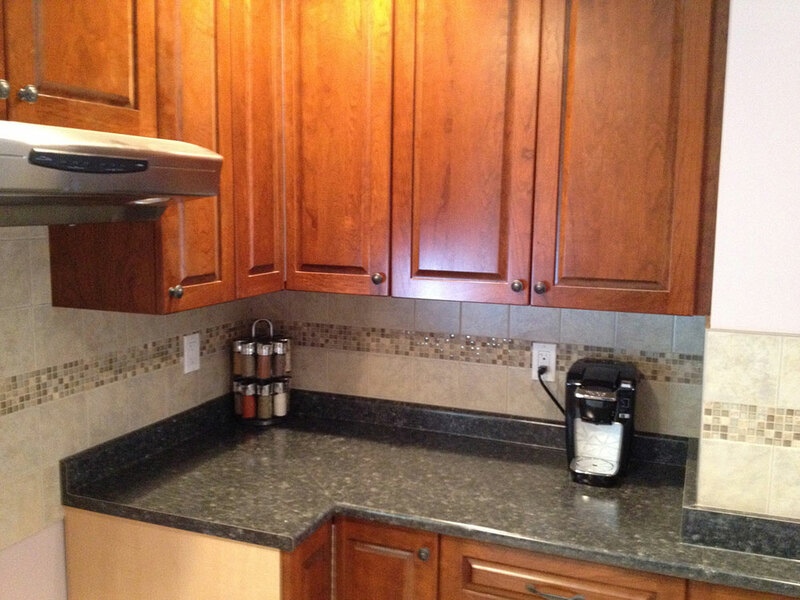 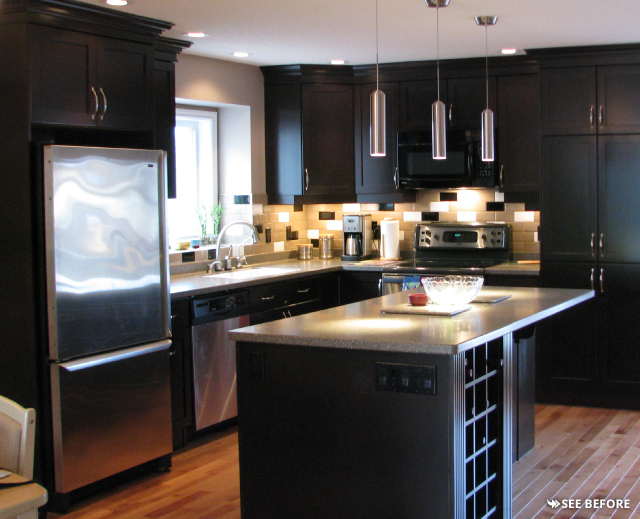 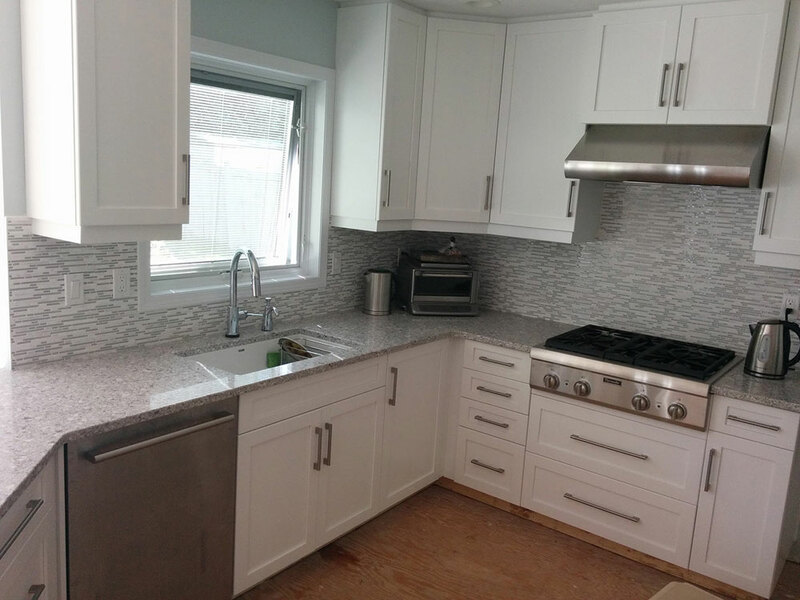 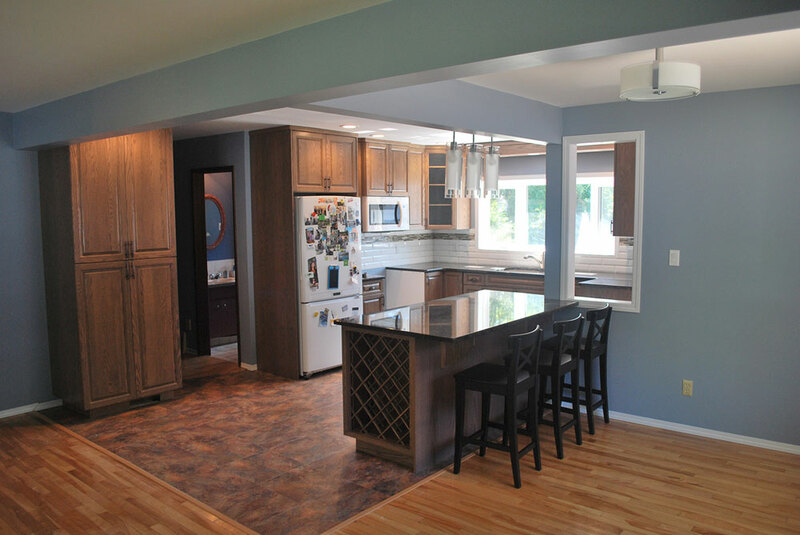 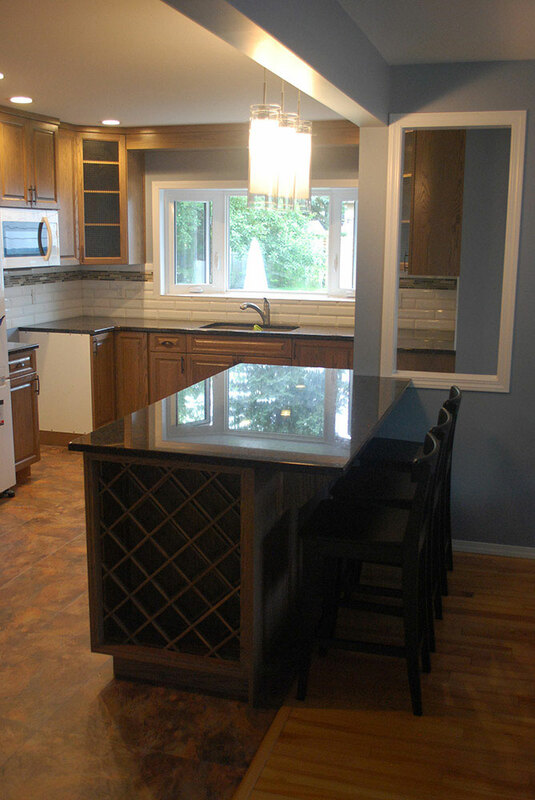 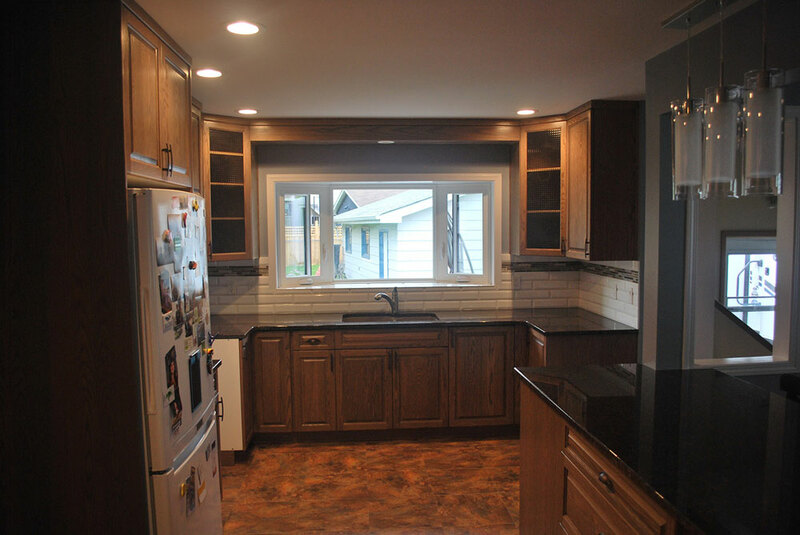 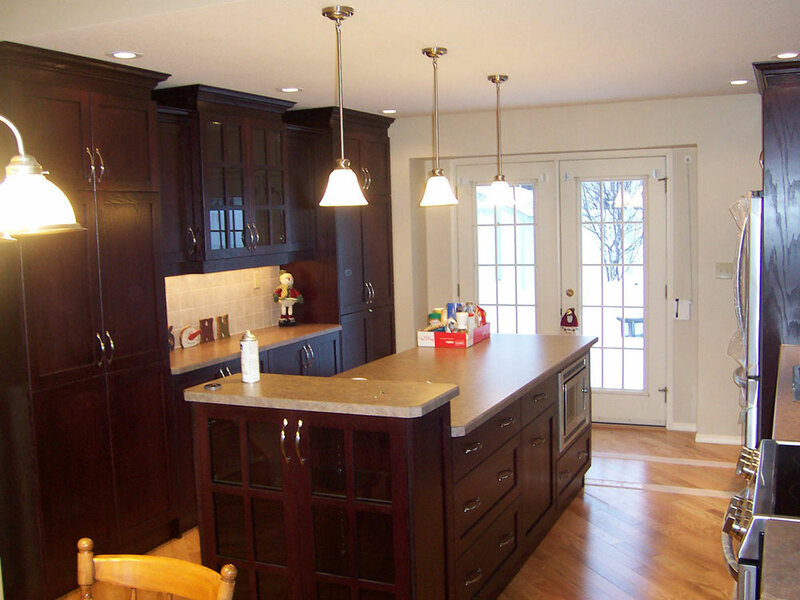 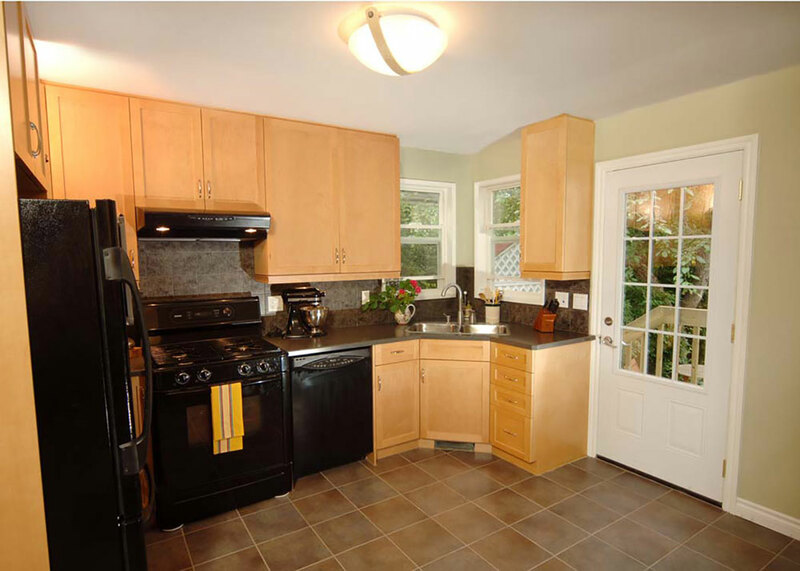 By removing the walls, we were able develop a more open concept approach to the design of the kitchen. 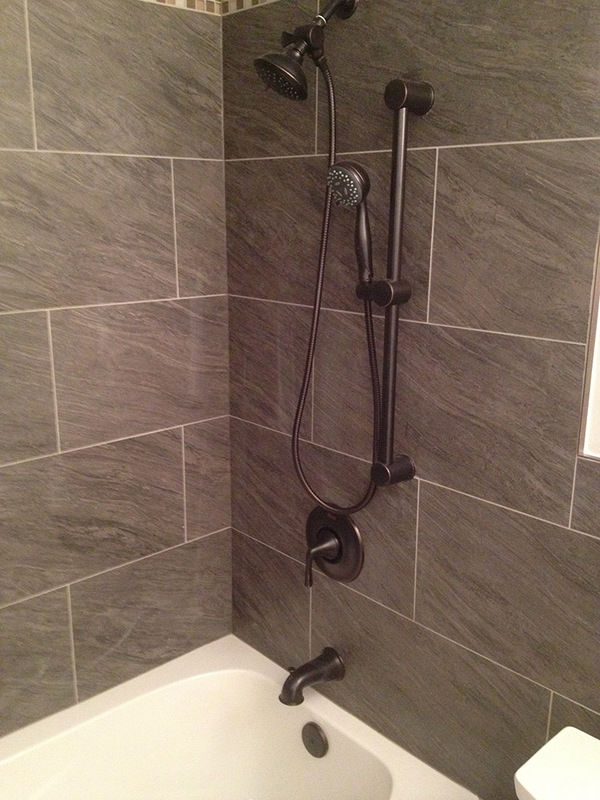 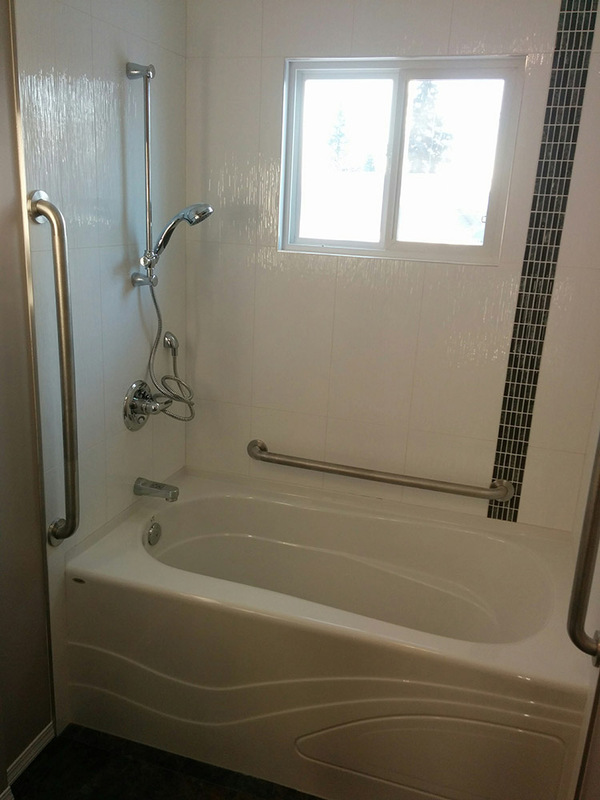 Sturgeon County Accessible Shower Renovation: This shower is not only beautiful, but is accessible by wheelchair. 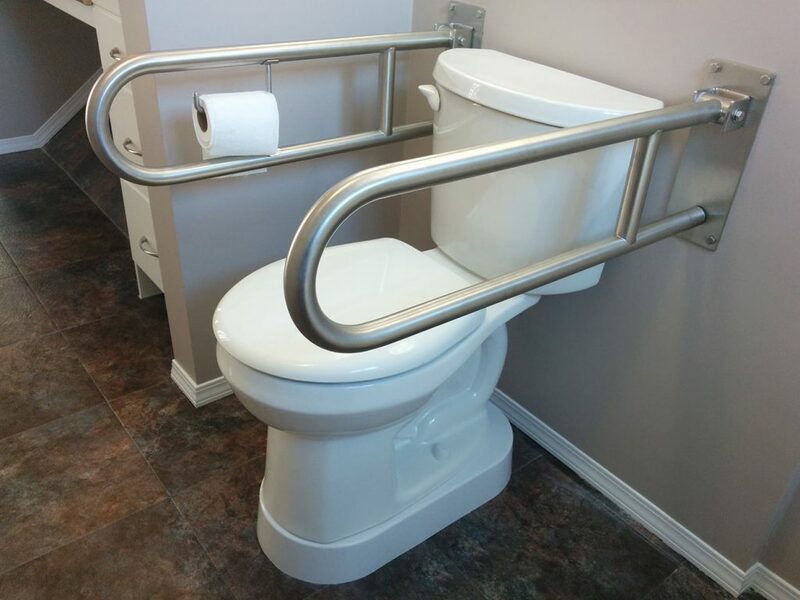 The bench folds away when not in use and the grab bars are placed to assist with transfer from the bench to the wheelchair. 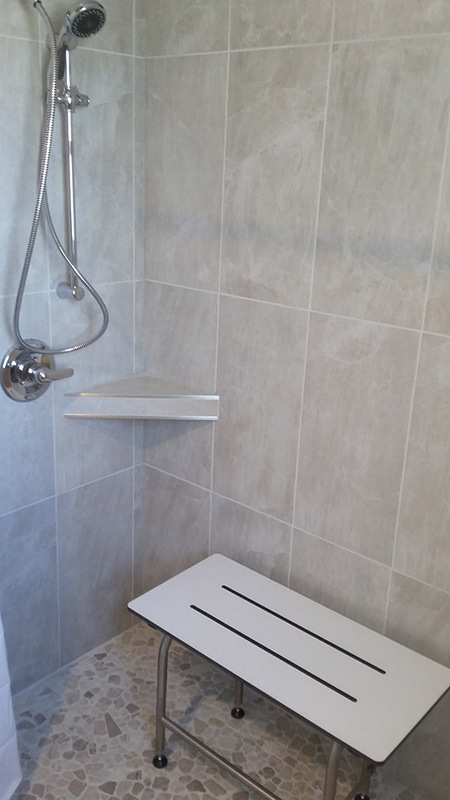 We opted for a phenolic shower seat rather than a tile bench because wet soapy tile can get very slippery. 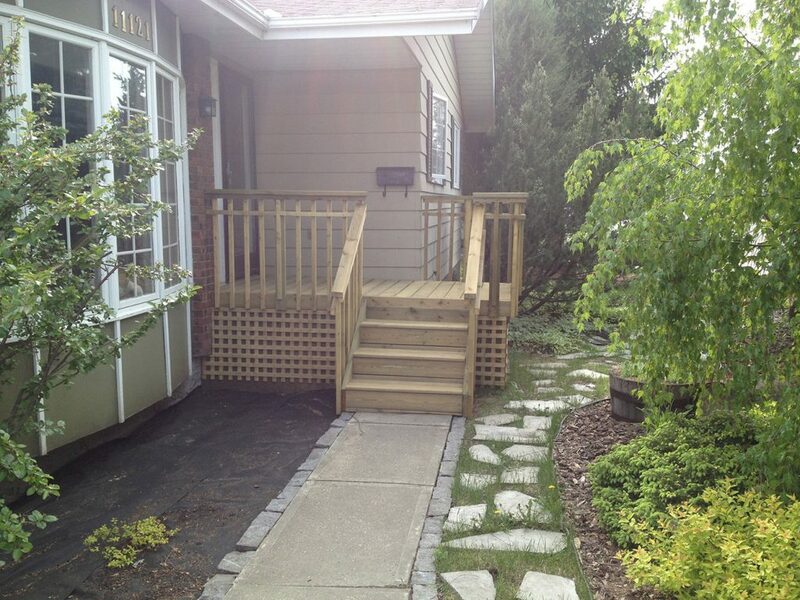 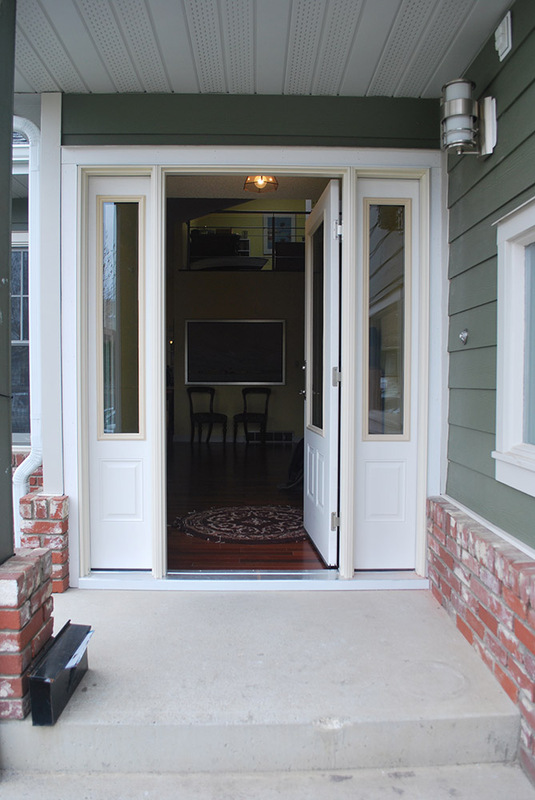 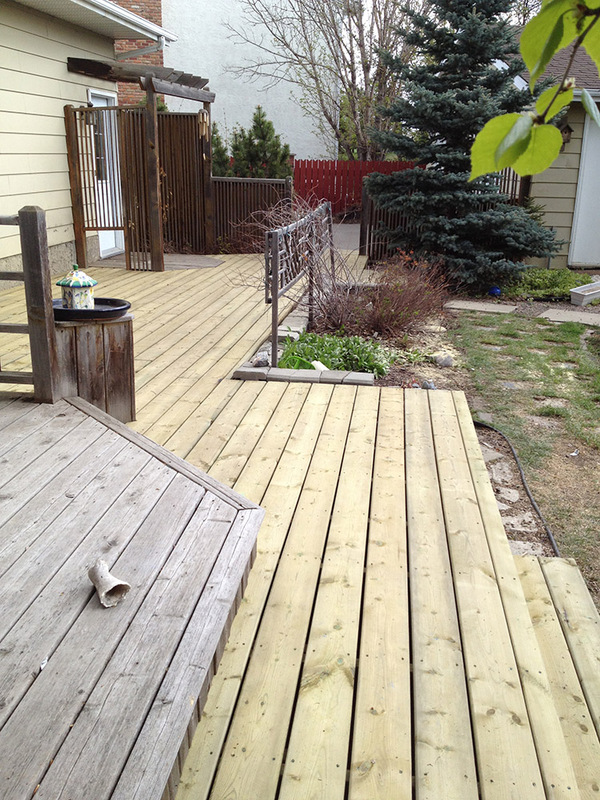 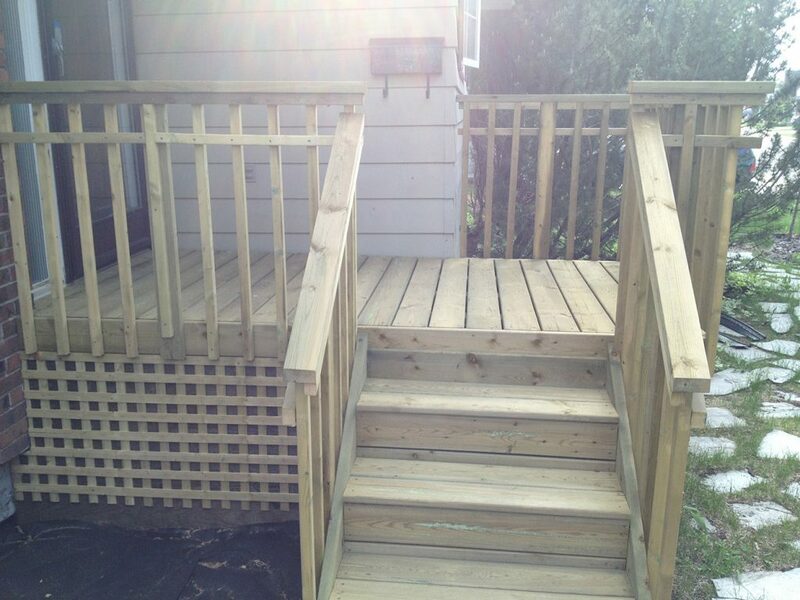 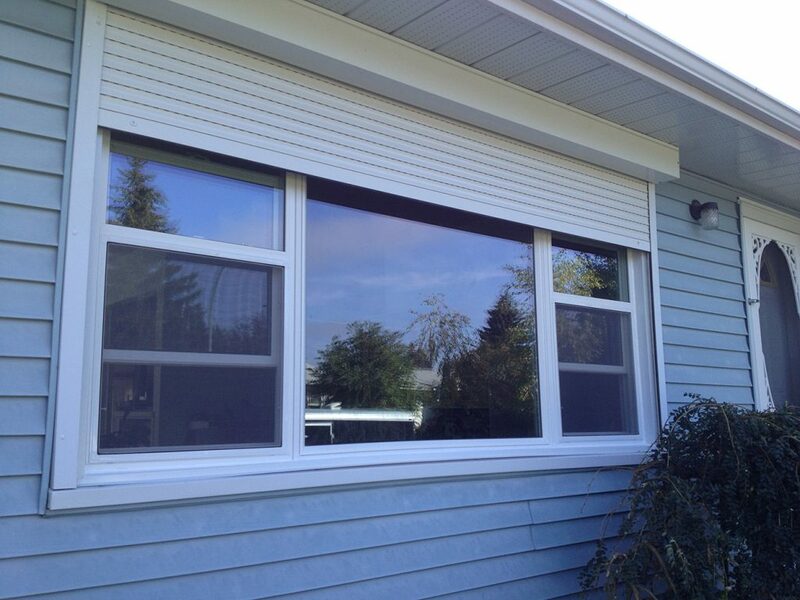 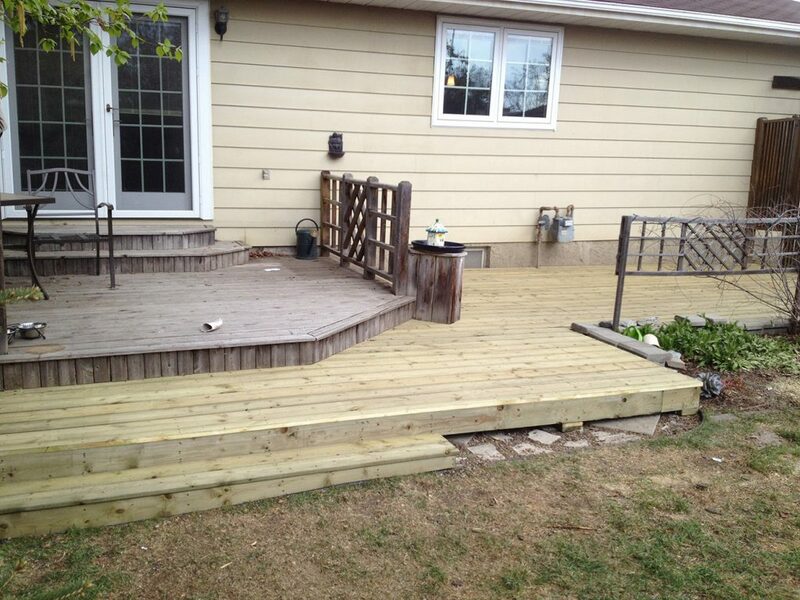 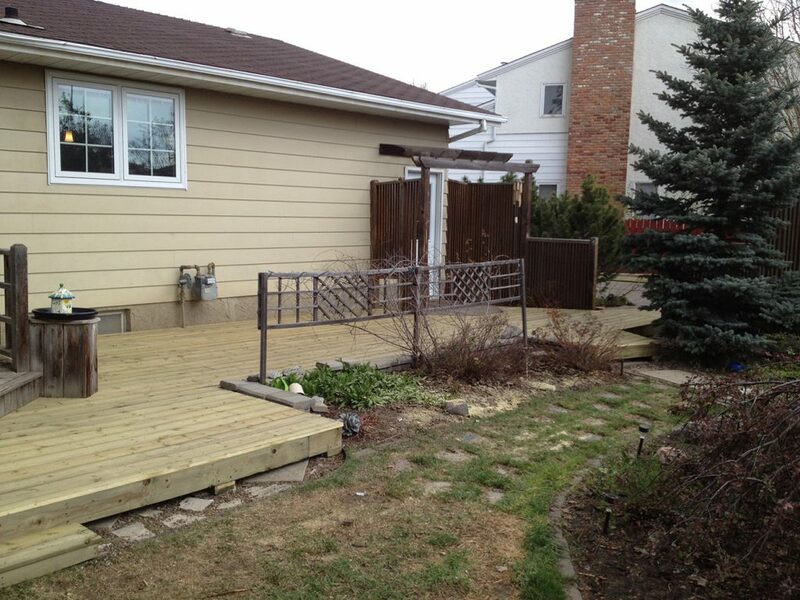 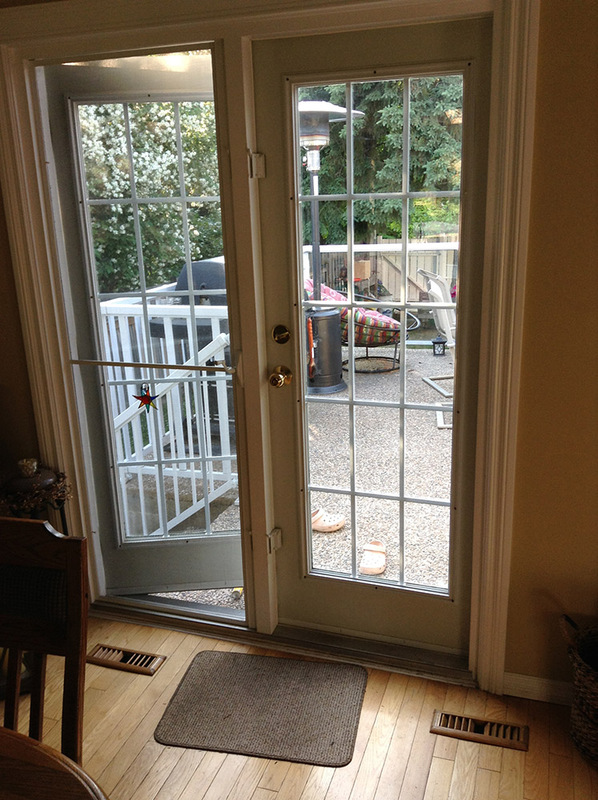 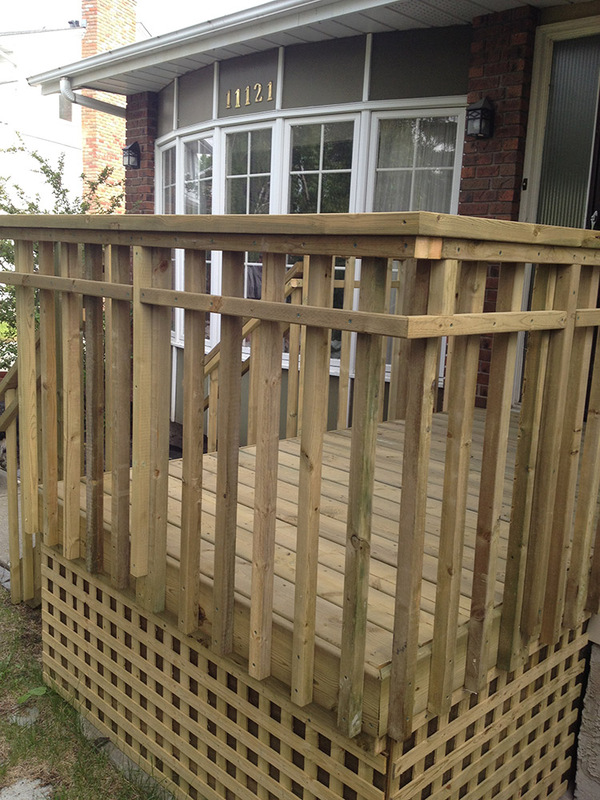 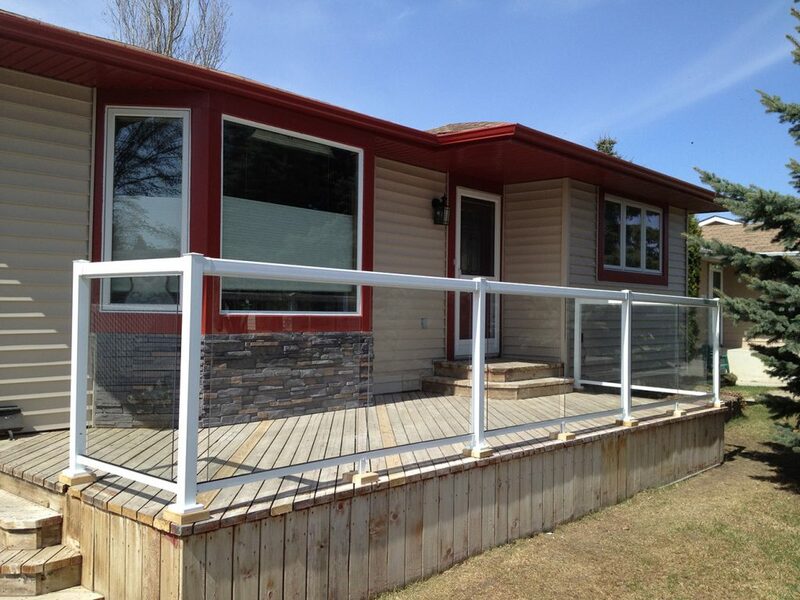 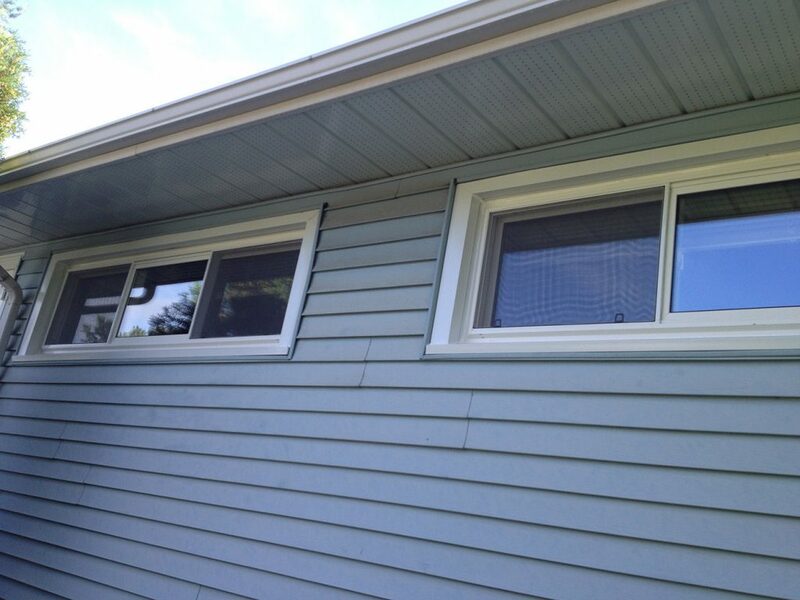 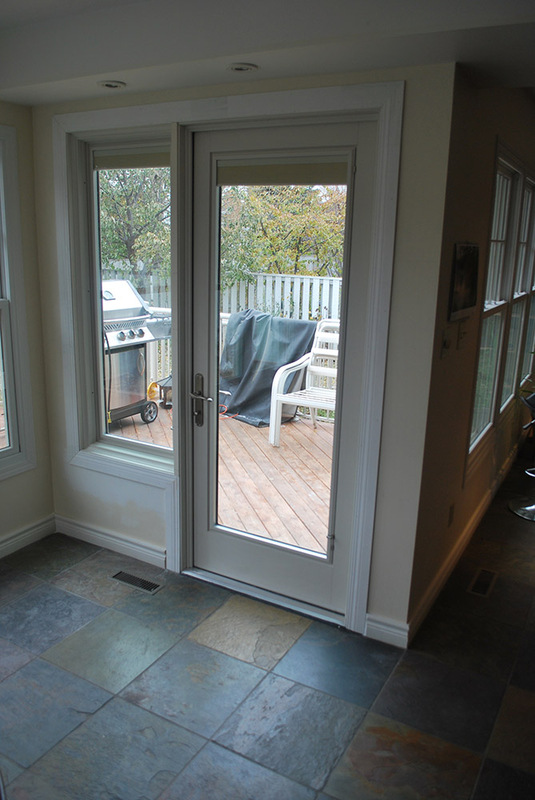 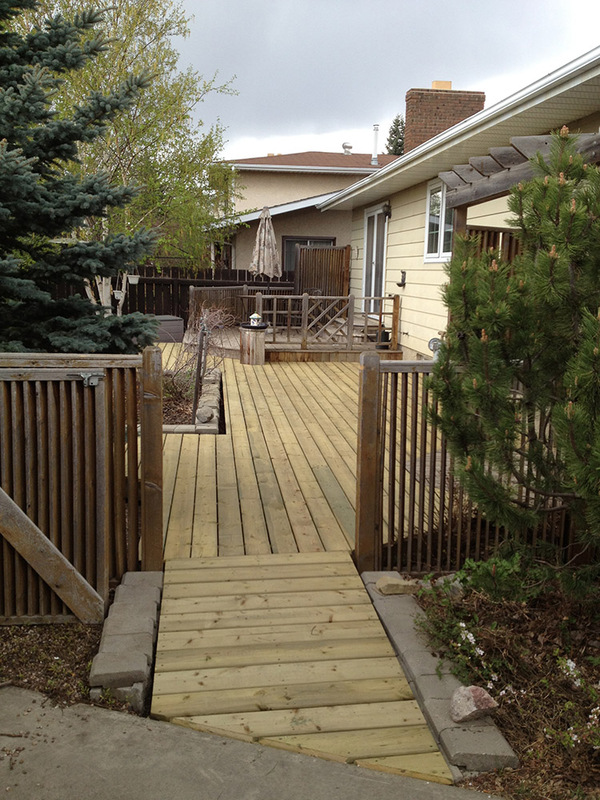 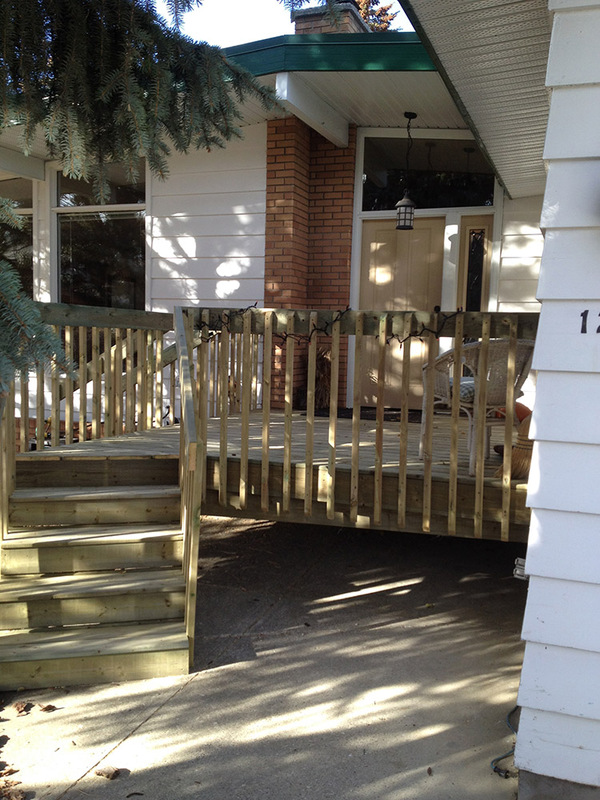 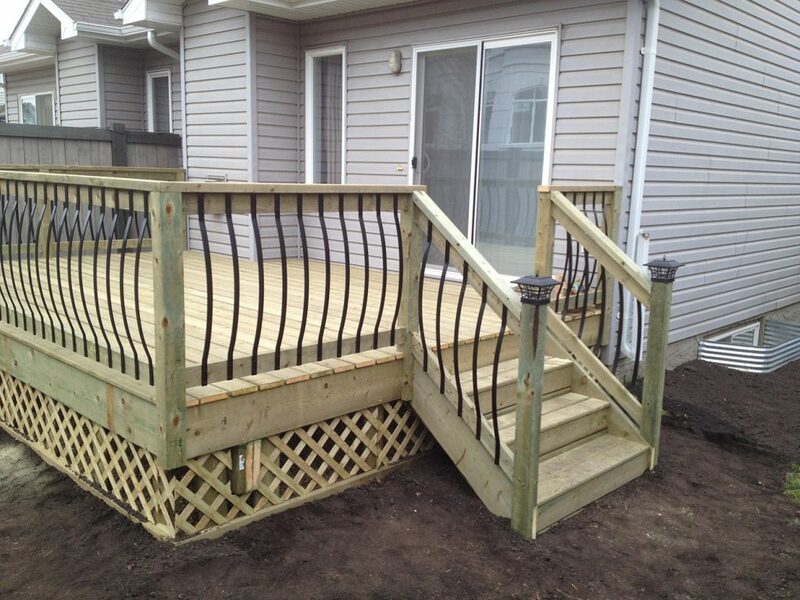 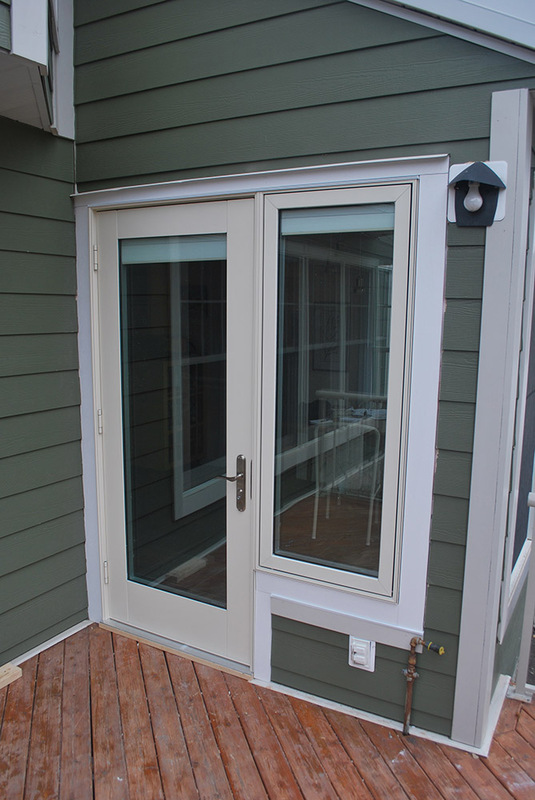 Blackmud Creek Renovation: A new deck was built over the porch in order to support a wheelchair lift. 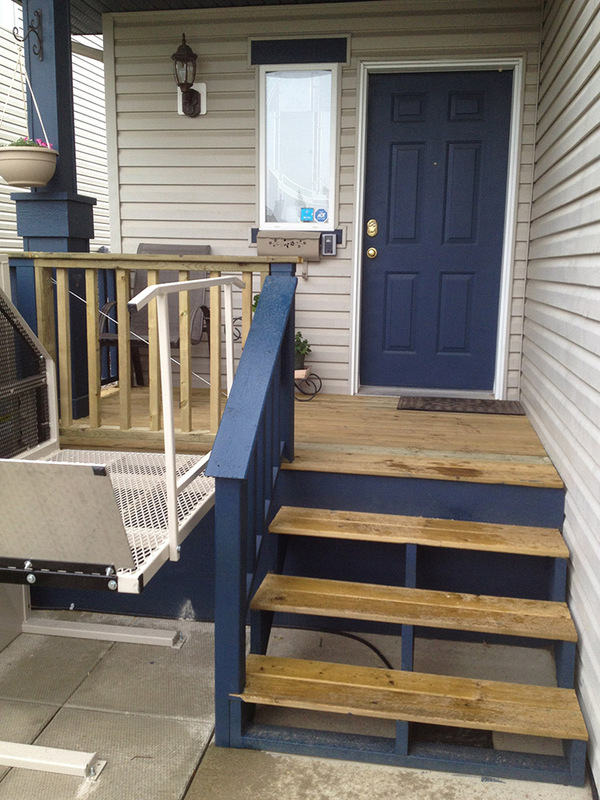 Riverbend Accessibility Renovation: This elevator is used to access the different levels of a split level home by wheelchair. 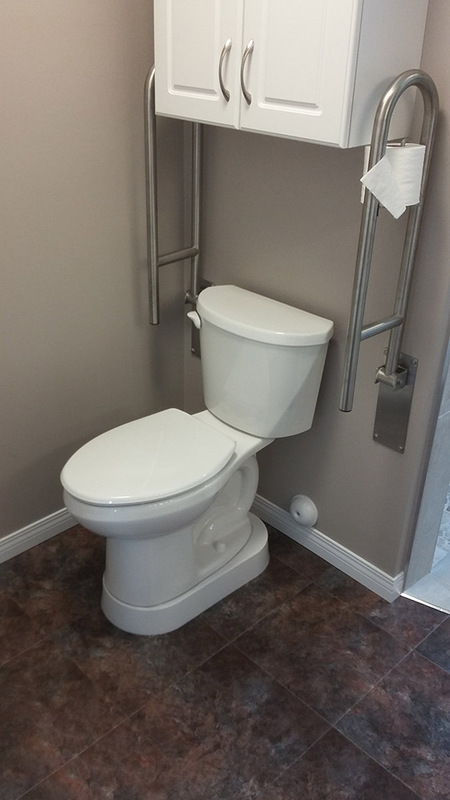 Millwoods Accessible Bathroom Renovation: In the addition, we installed another toilet on the 'Toilevator', a special platform that raises the toilet to a more comfortable height. 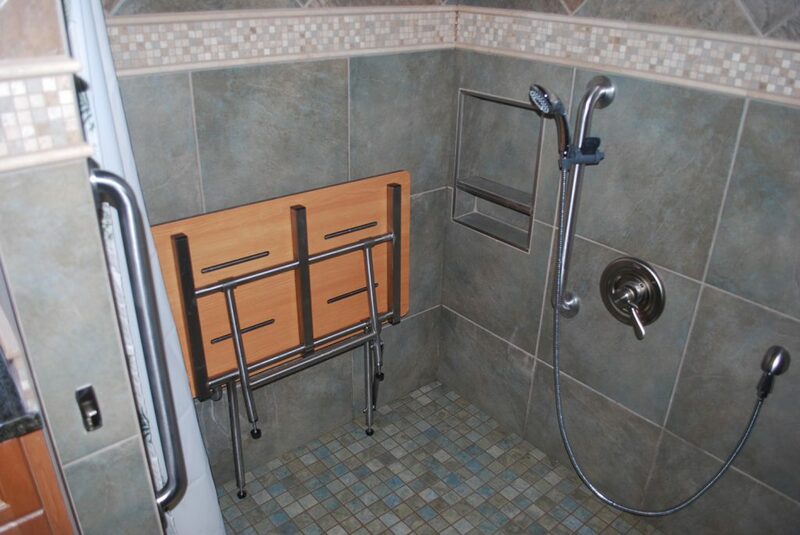 Here, you can see the grab bars folded up when not in use. 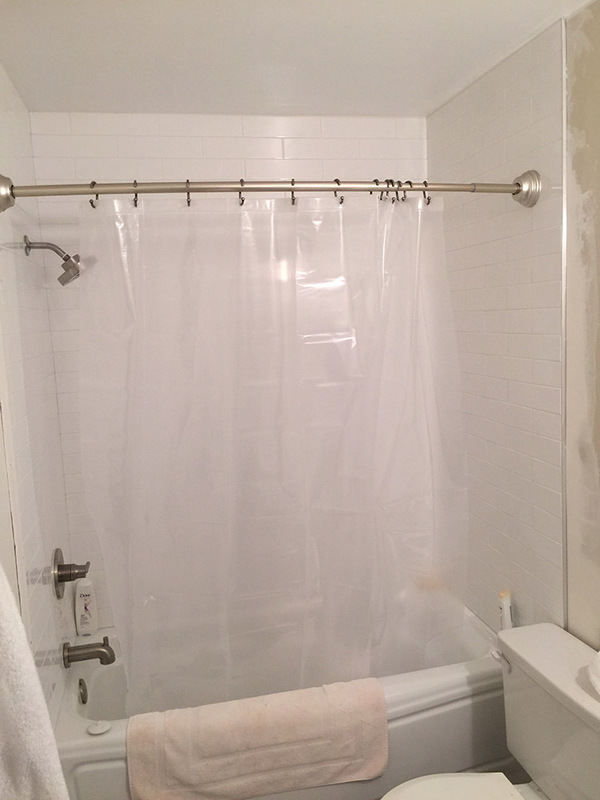 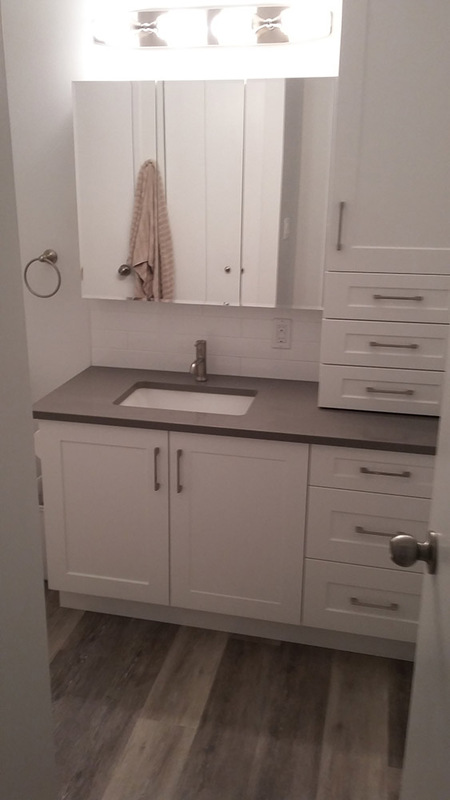 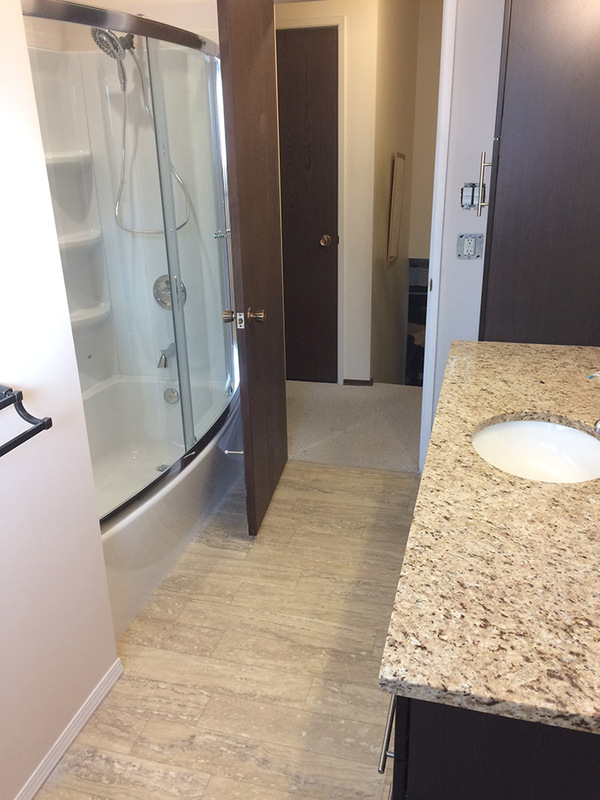 Westmount Accessible Renovation: This walk in shower features two corner shelves and a grab bar that goes almost the entire length of the shower. 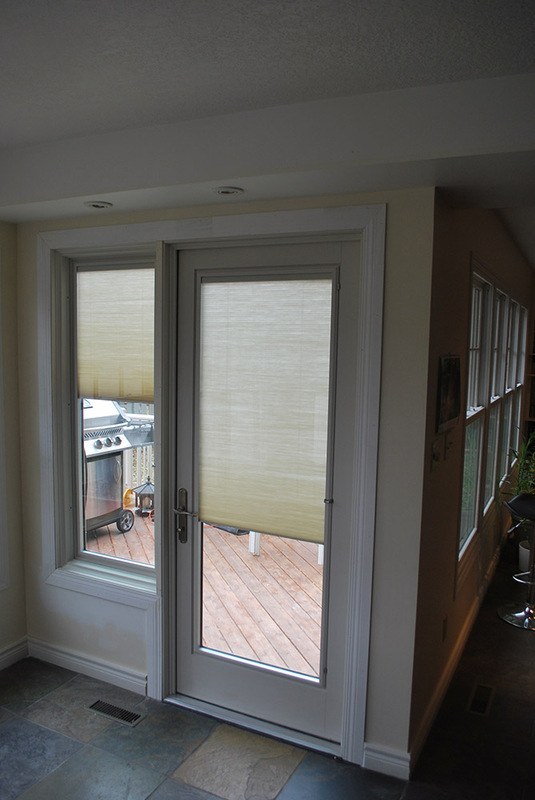 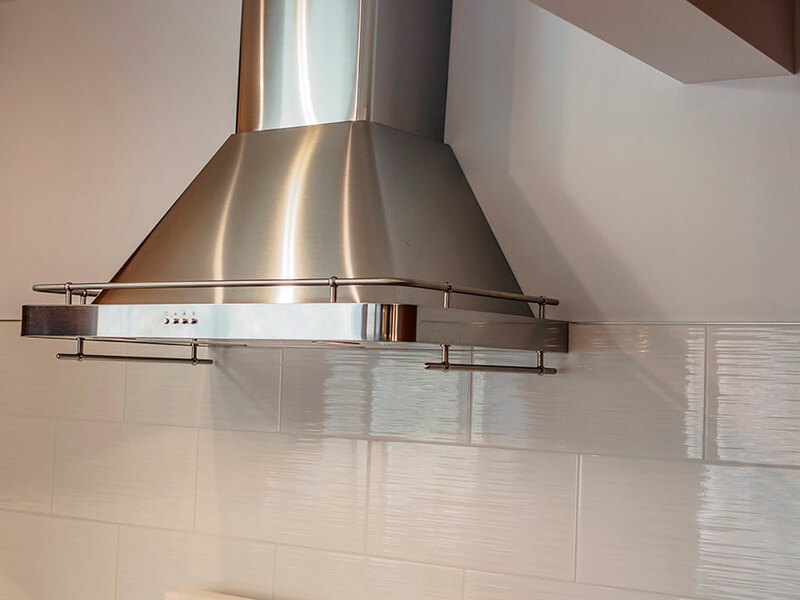 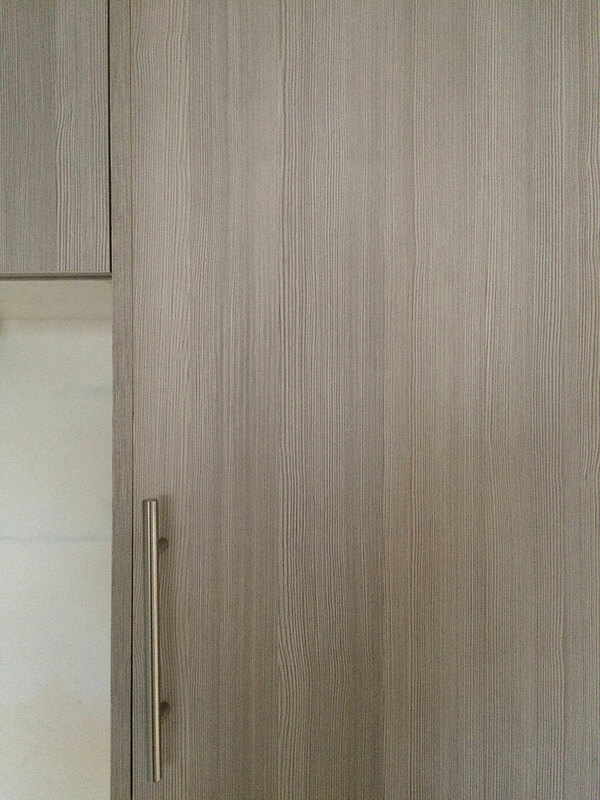 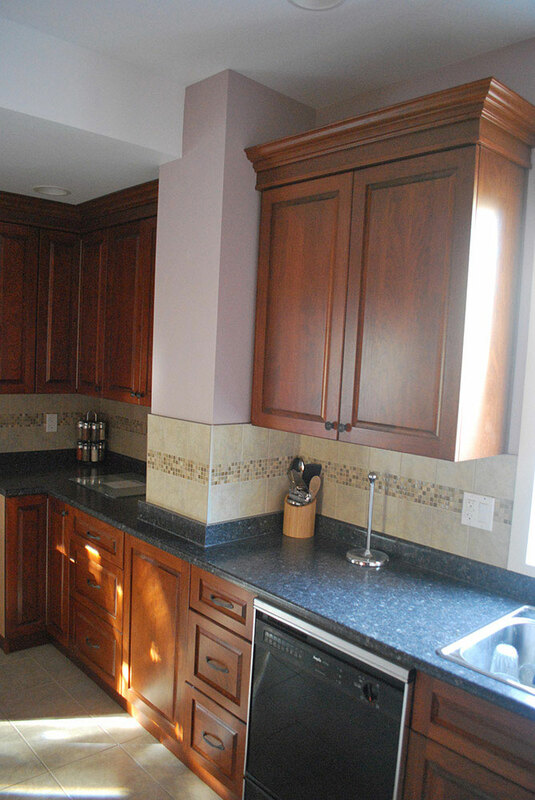 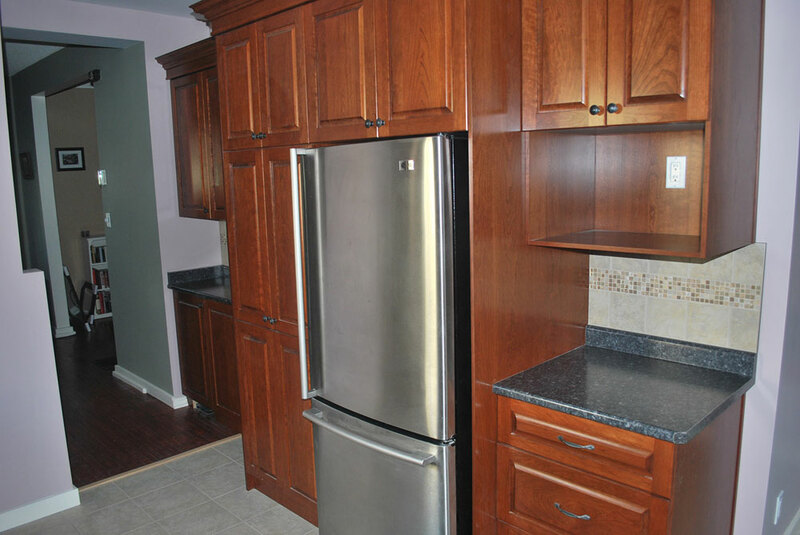 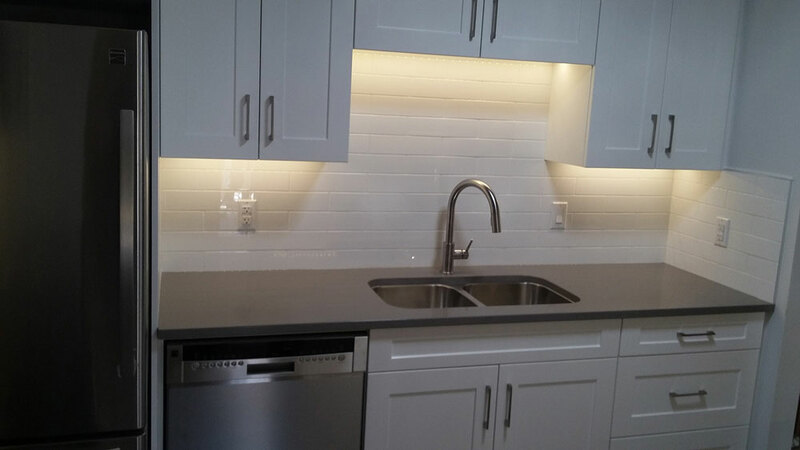 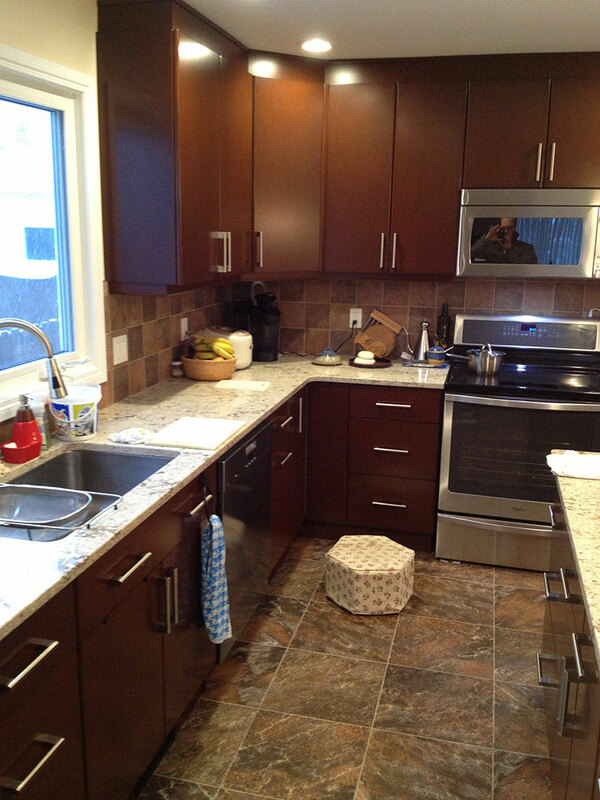 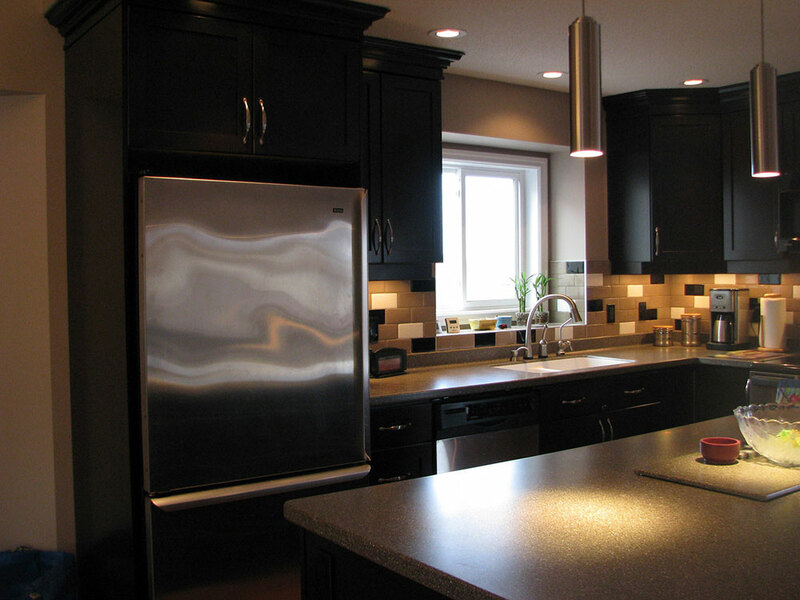 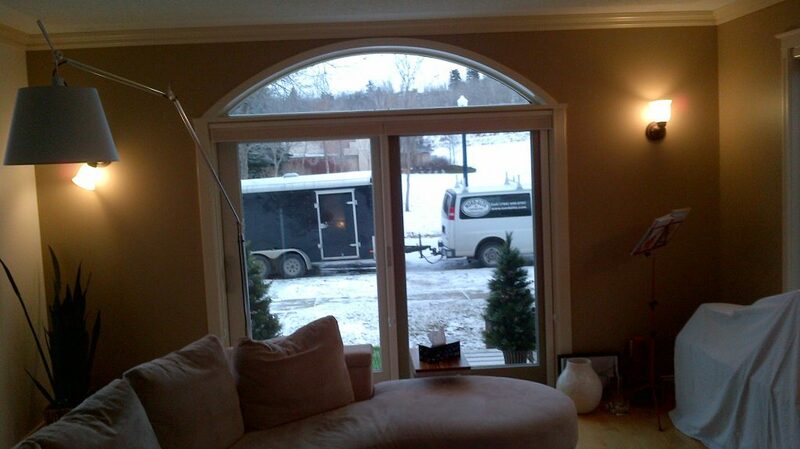 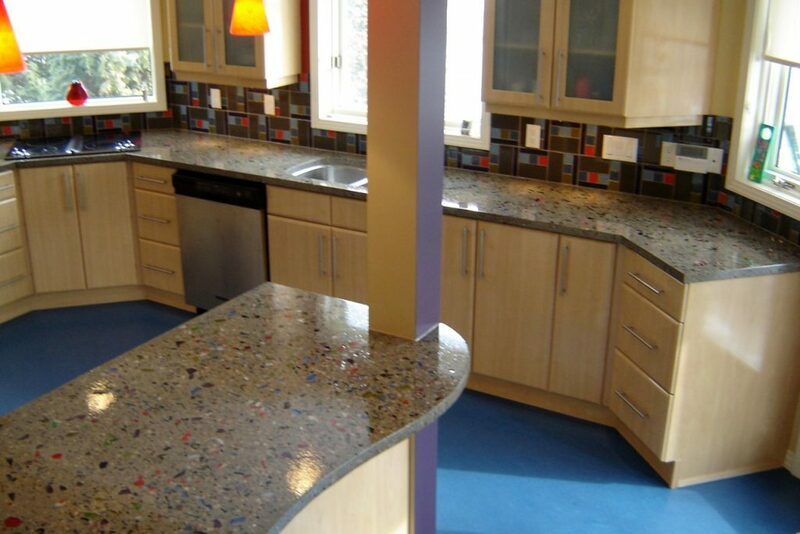 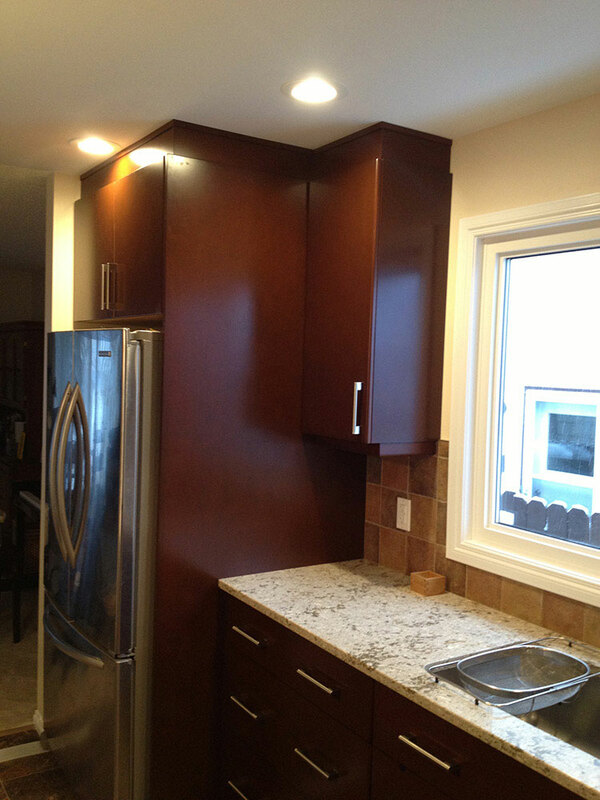 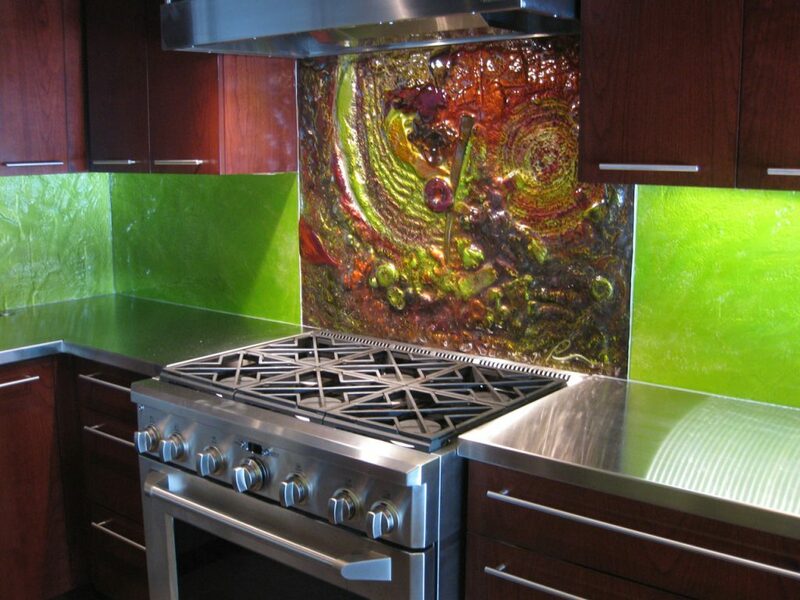 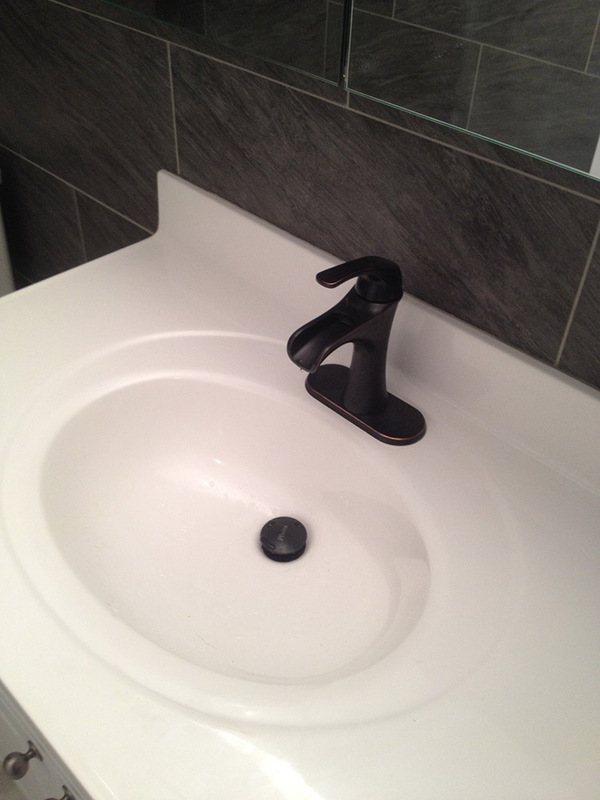 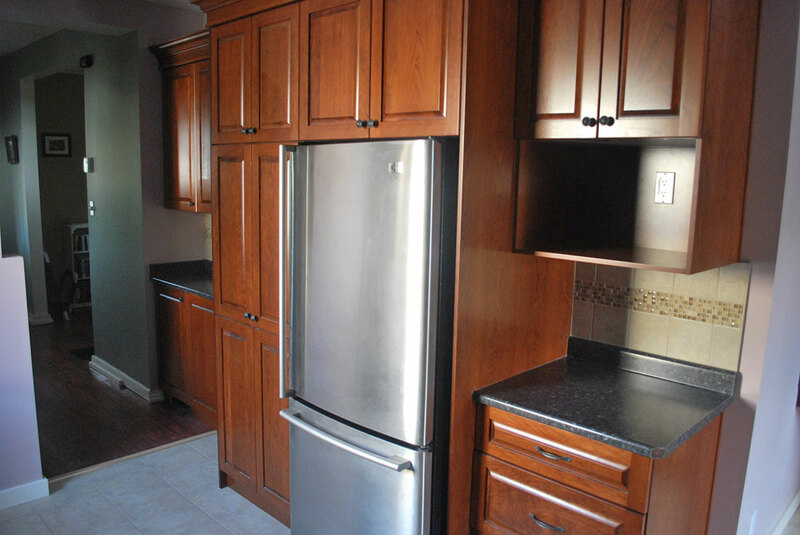 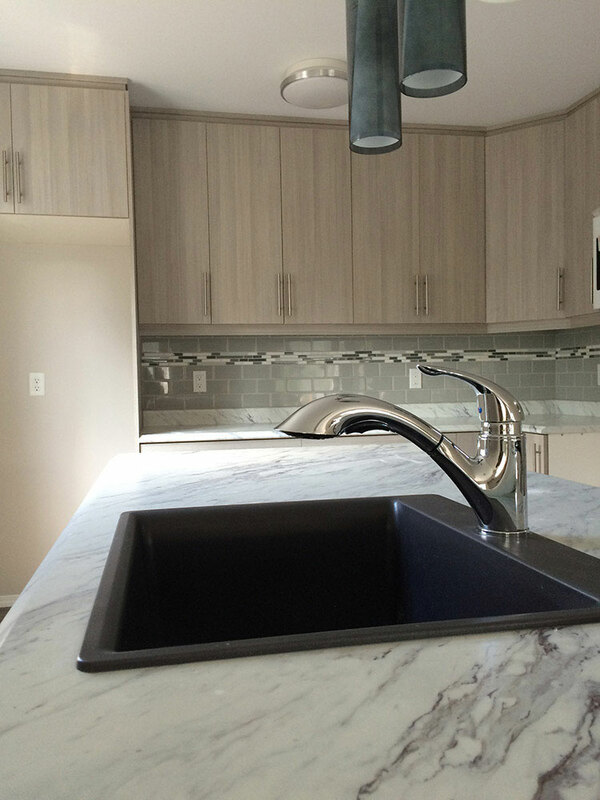 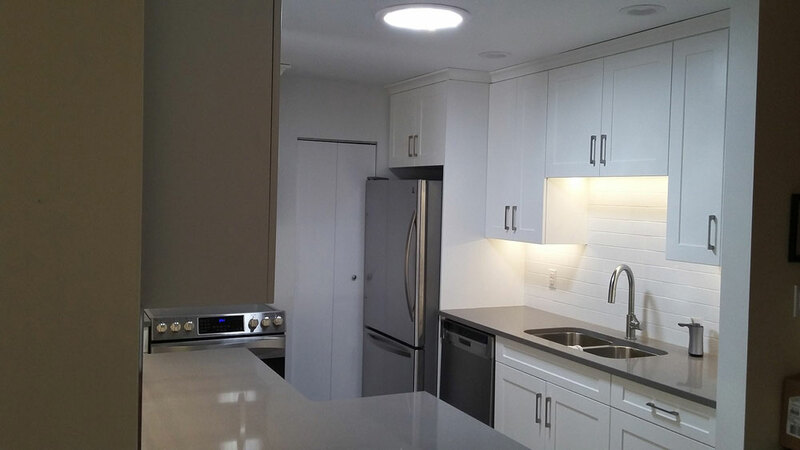 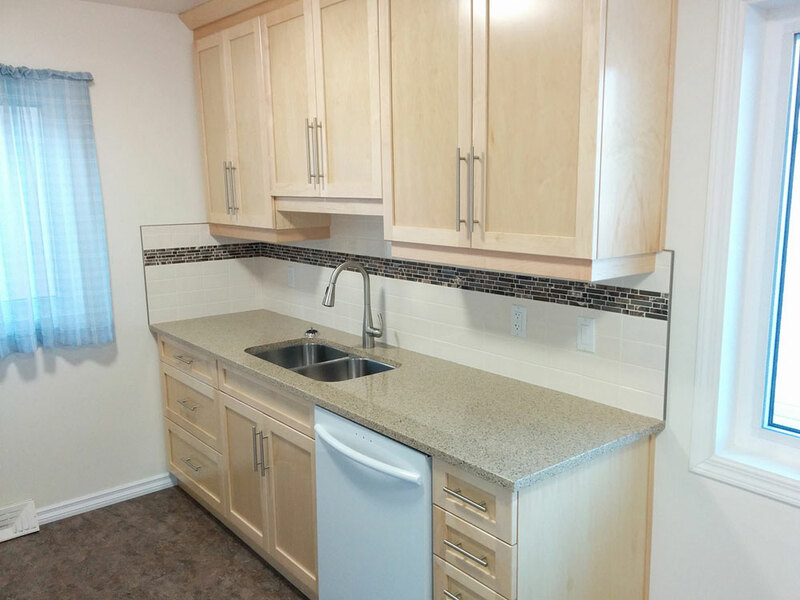 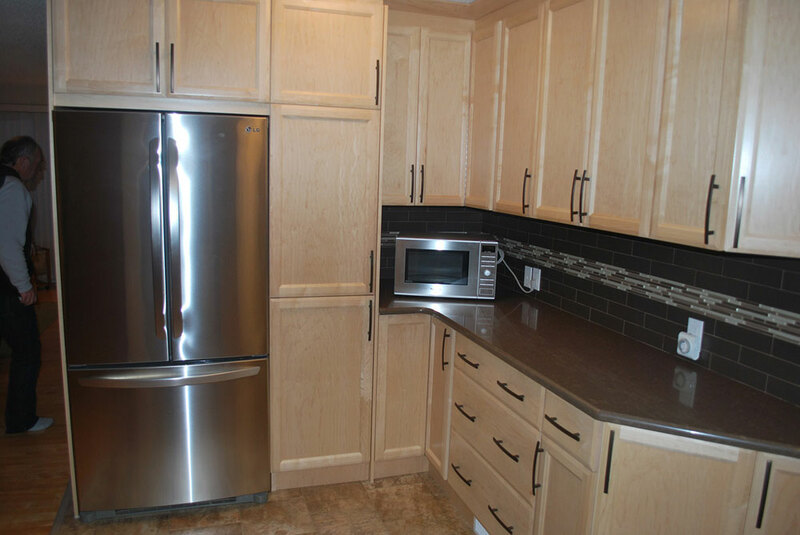 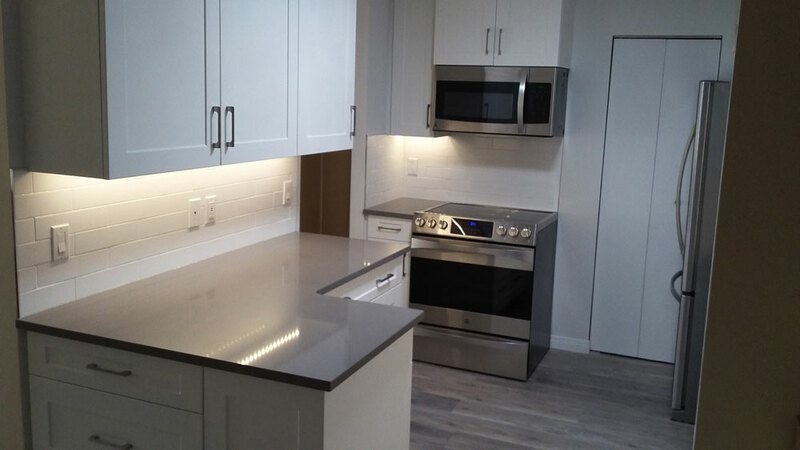 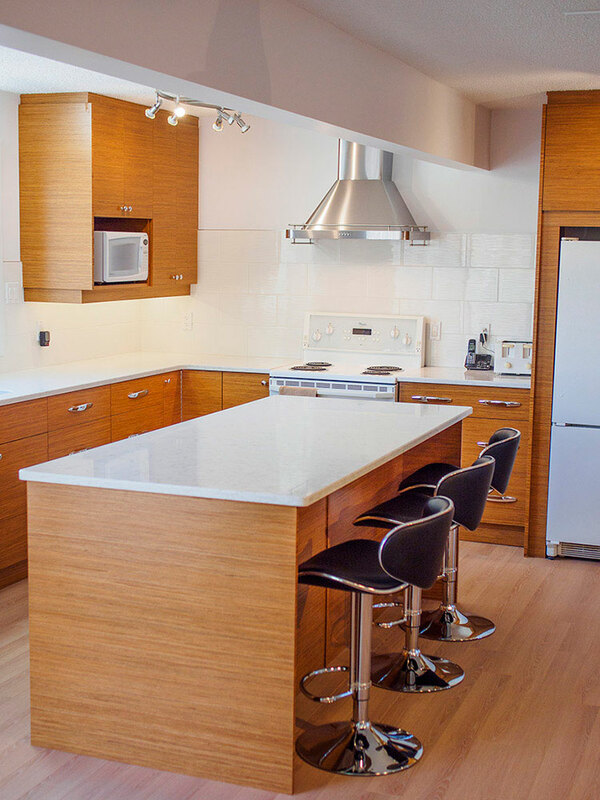 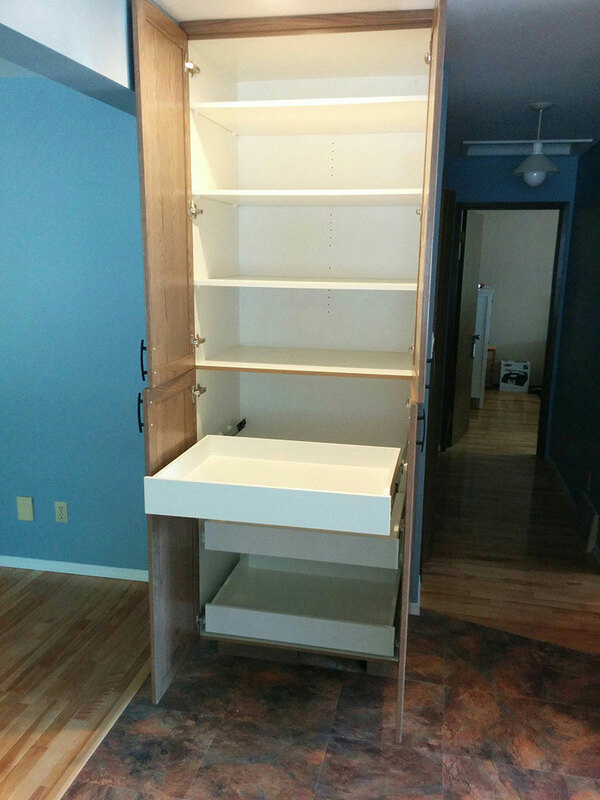 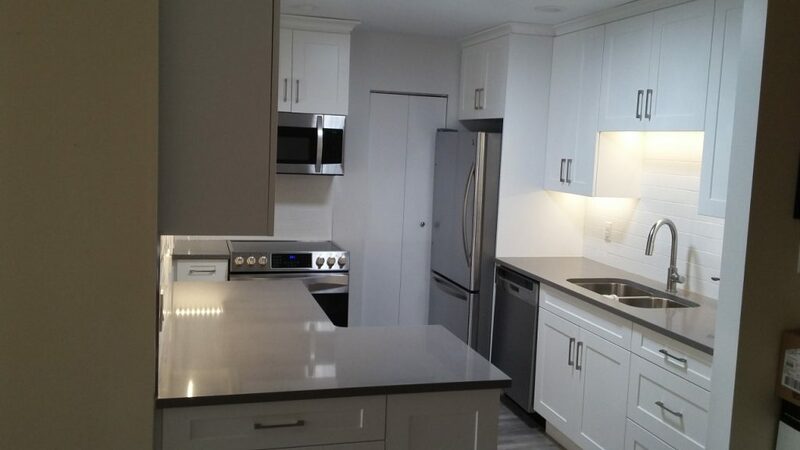 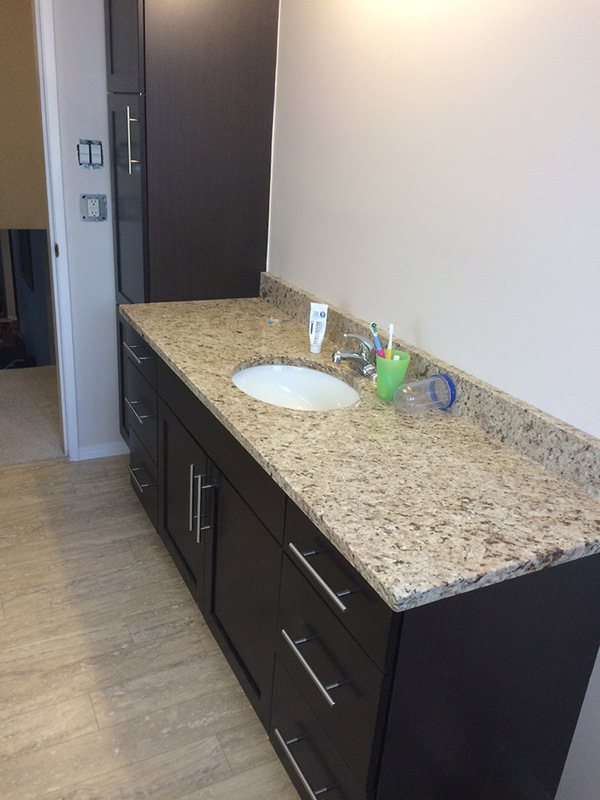 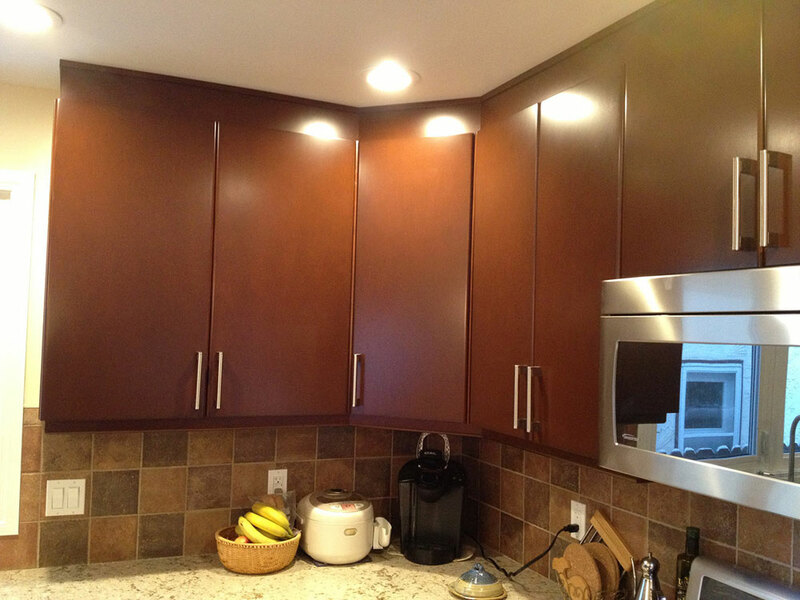 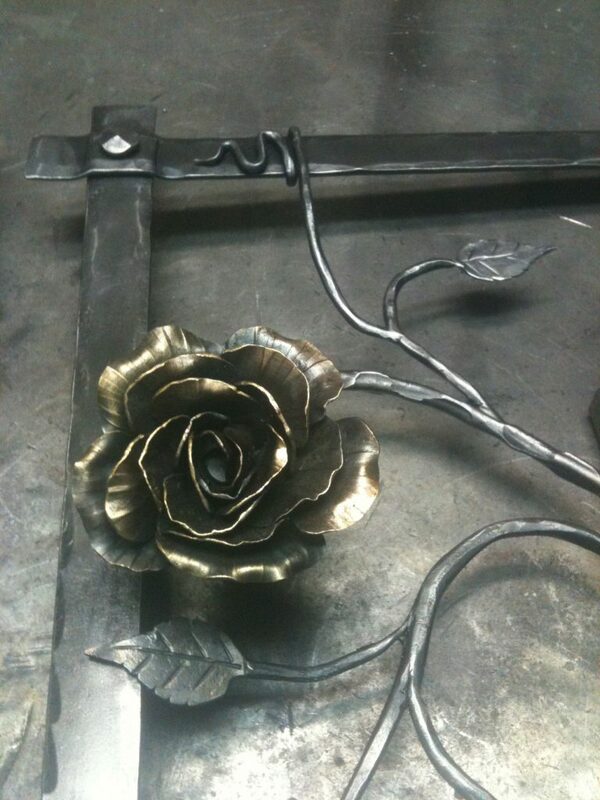 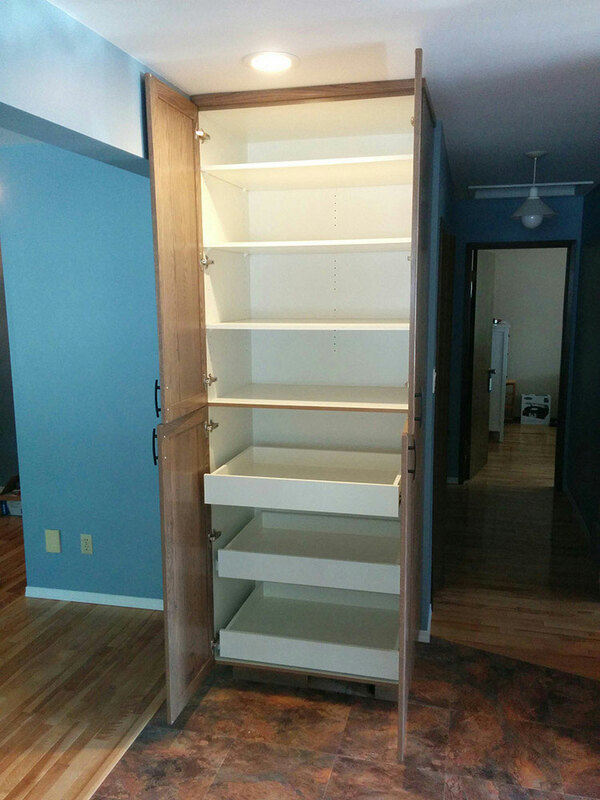 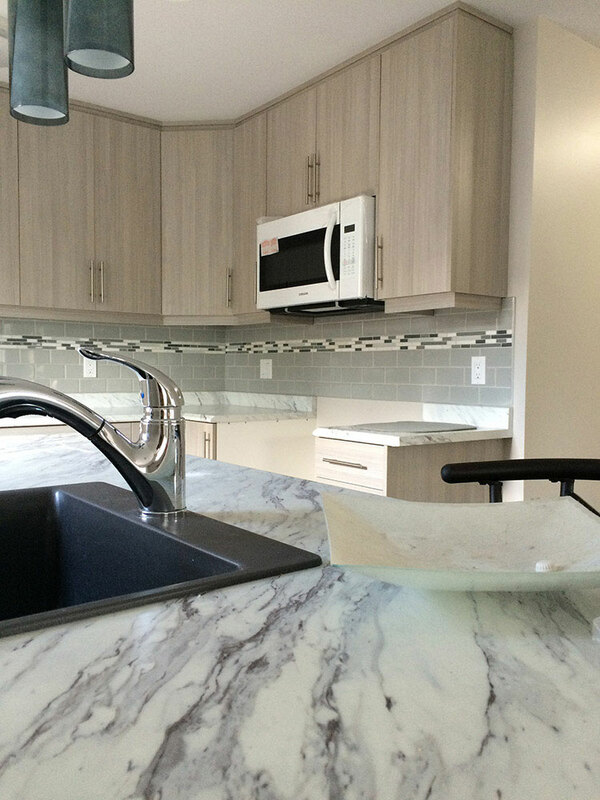 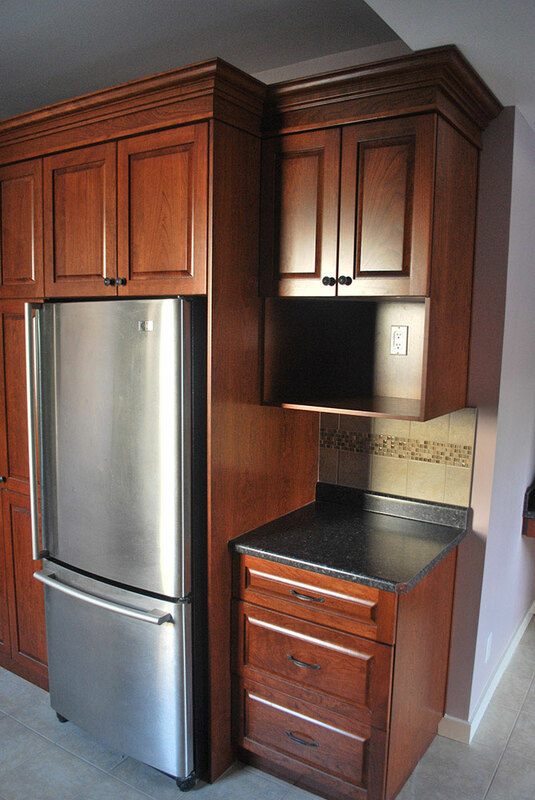 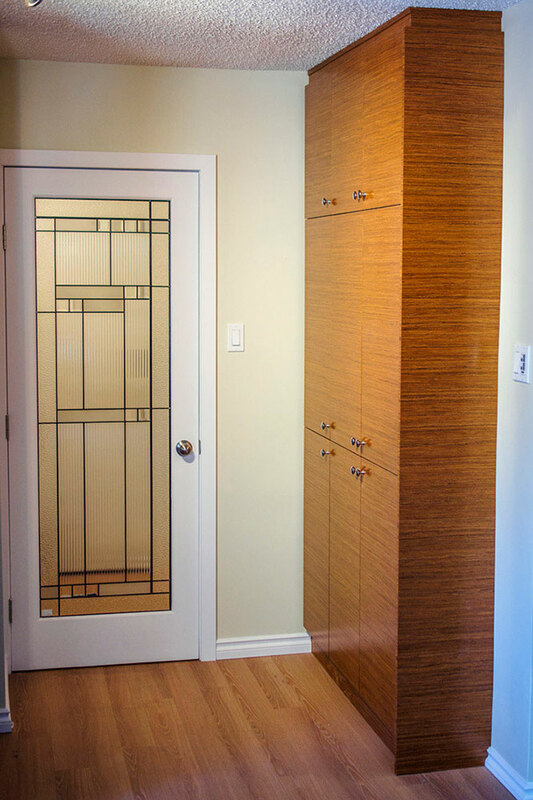 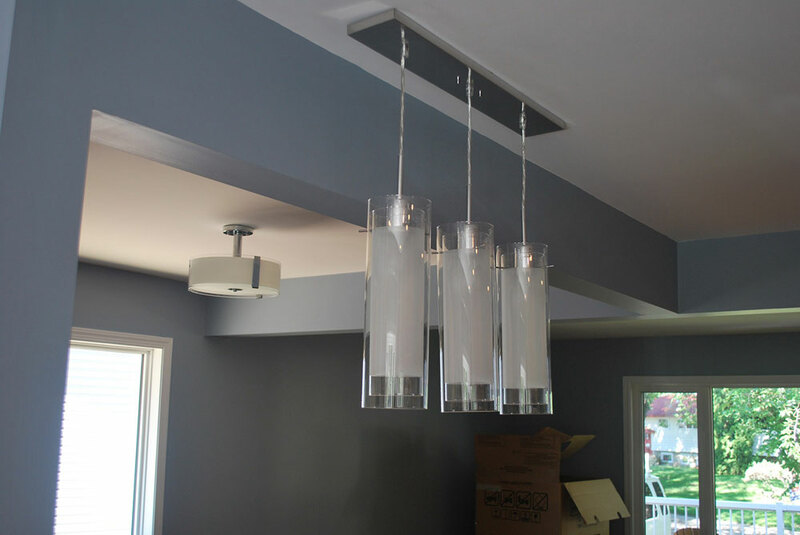 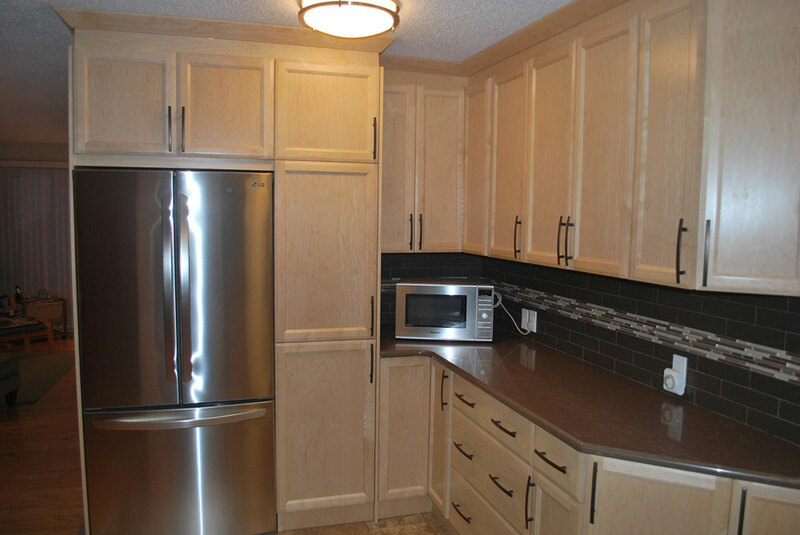 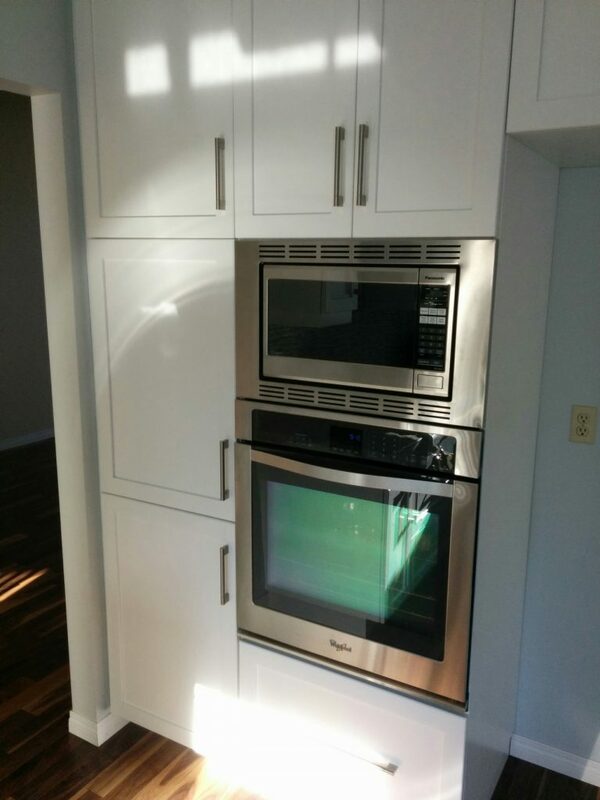 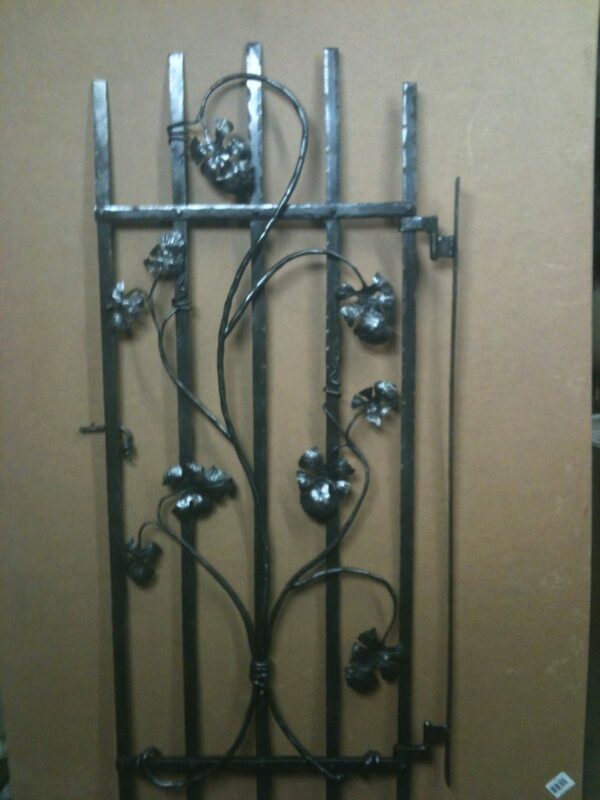 This project was in a small condo unit in the Westmount area. 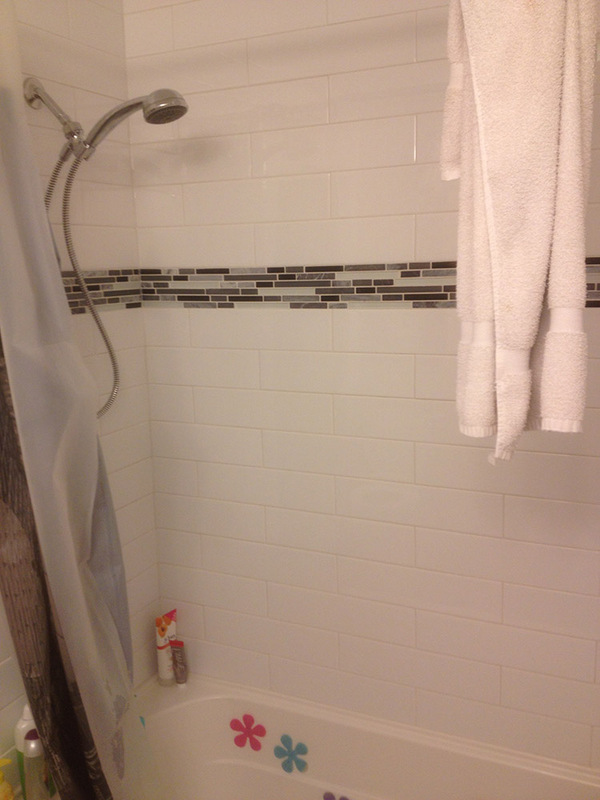 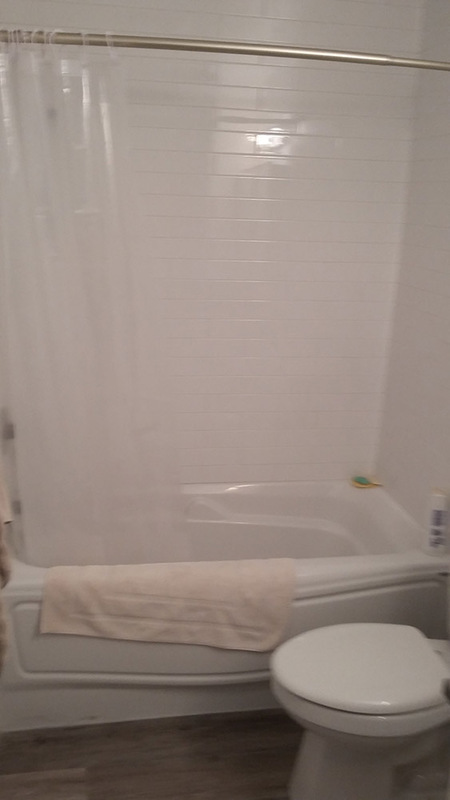 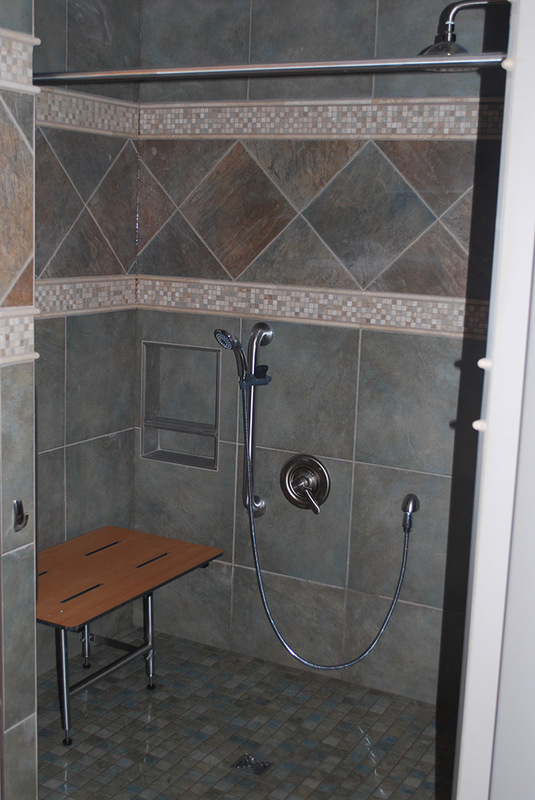 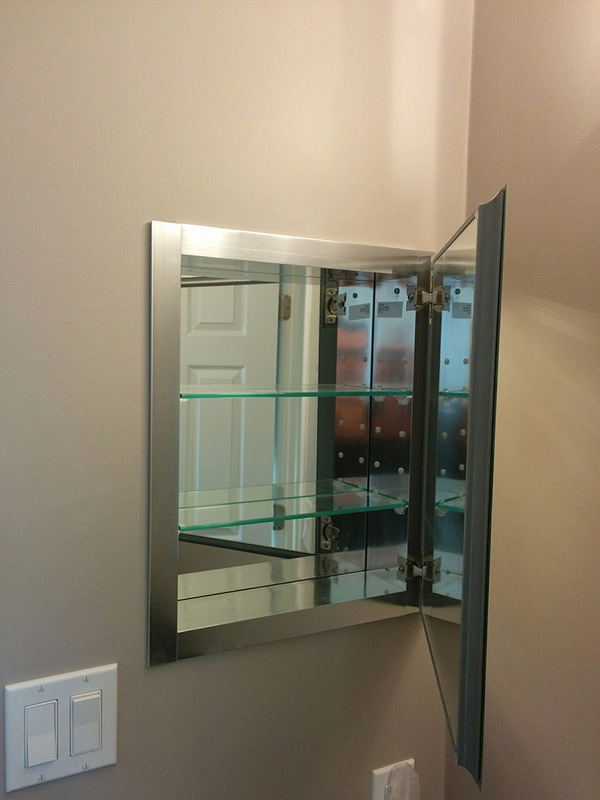 Riverbend Renovation: Our client needed a shower that was accessible by wheelchair. 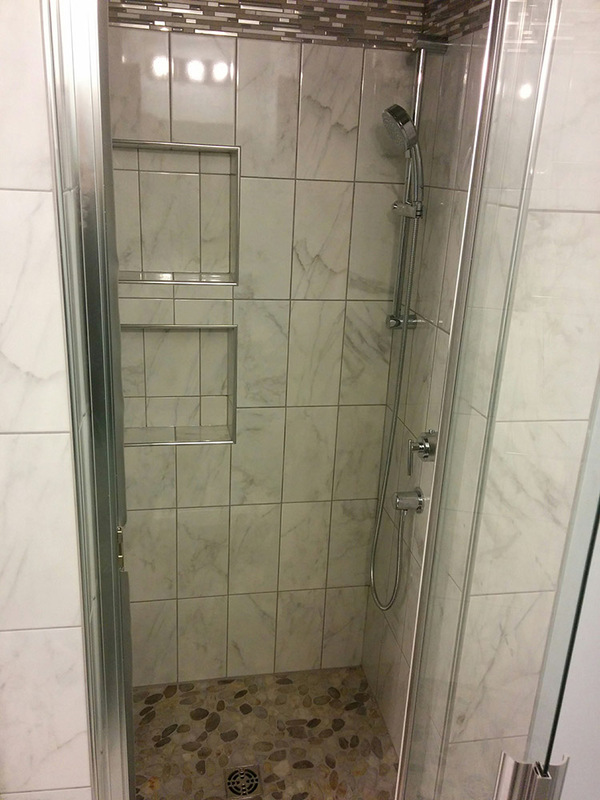 The shower is waterproof and curb-less. 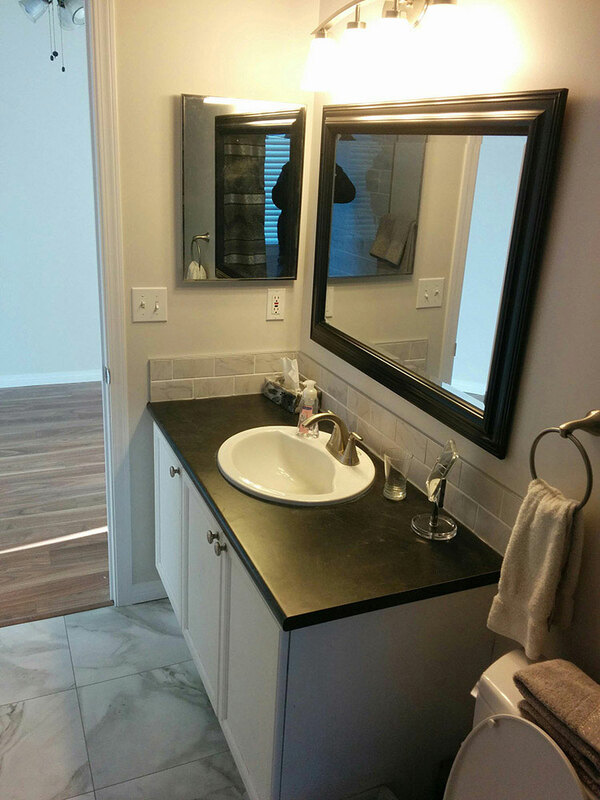 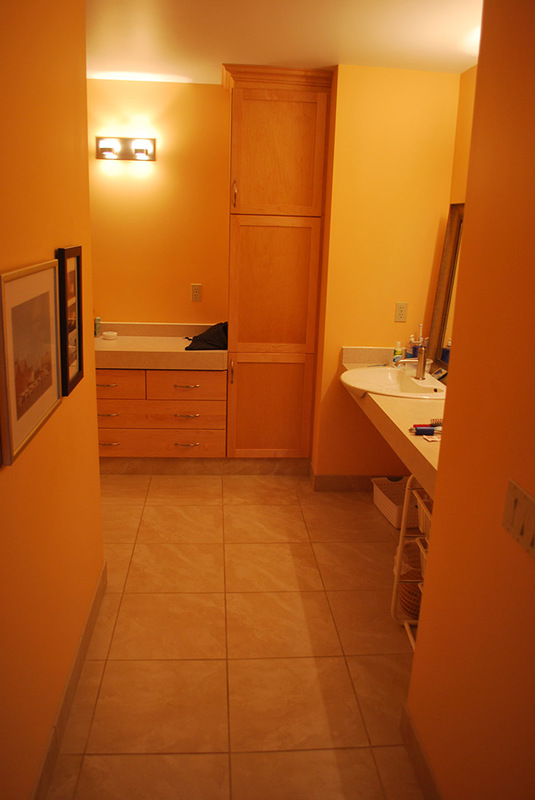 Riverbend Renovation: This bathroom was designed for wheelchair access. 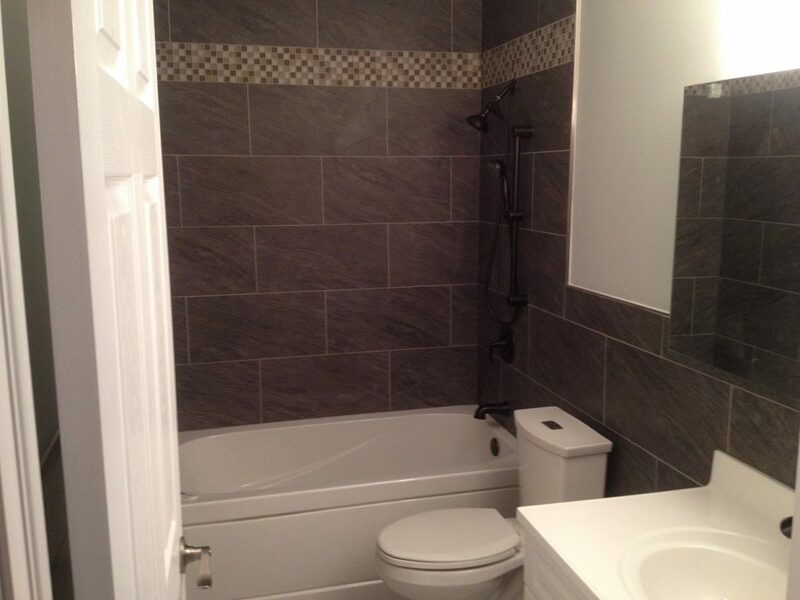 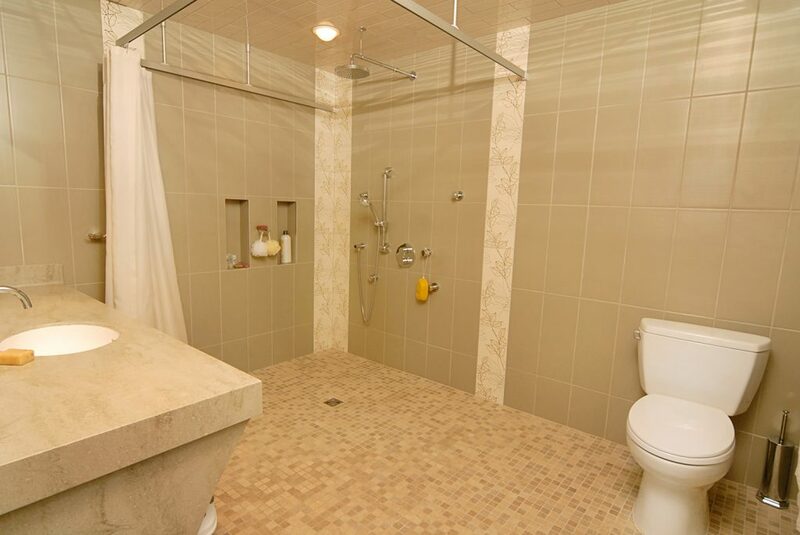 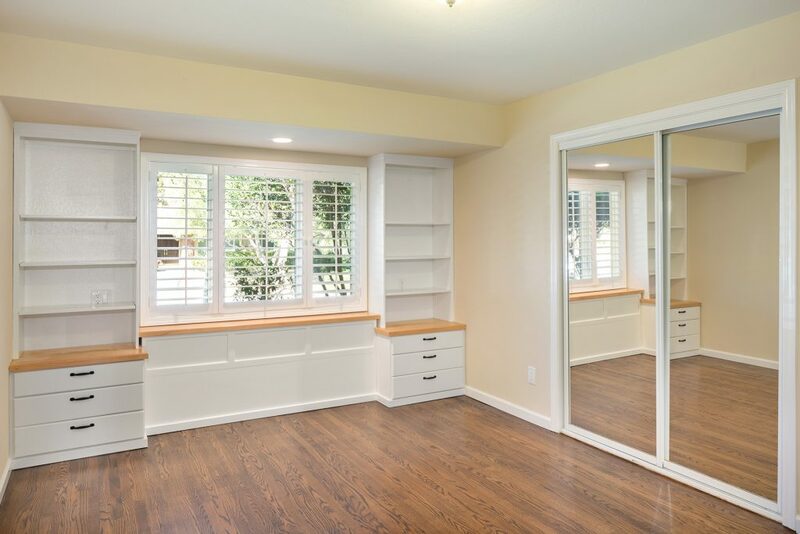 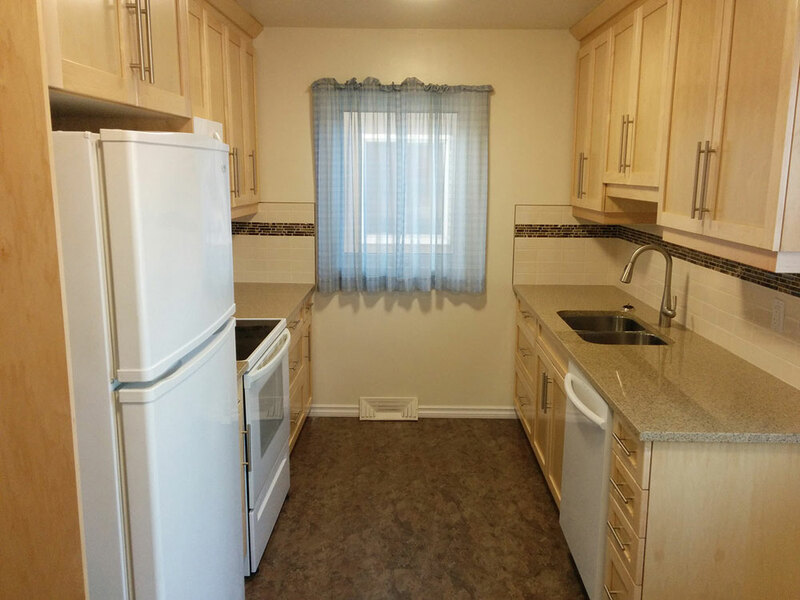 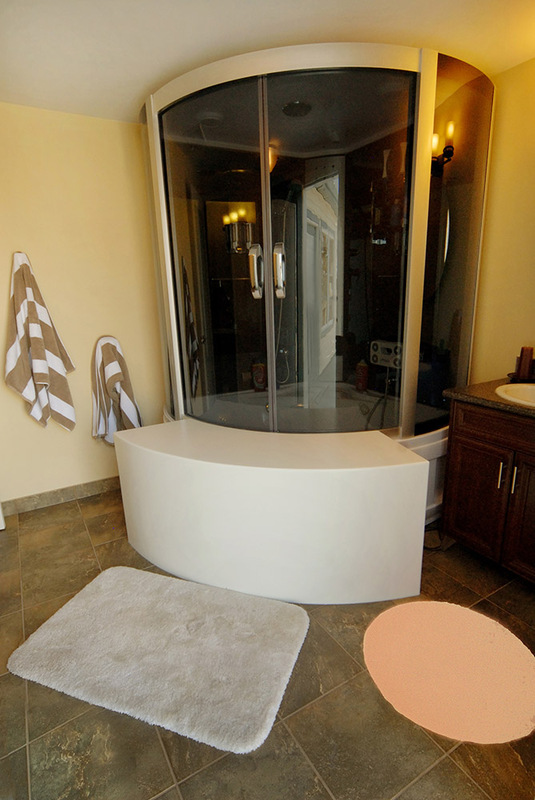 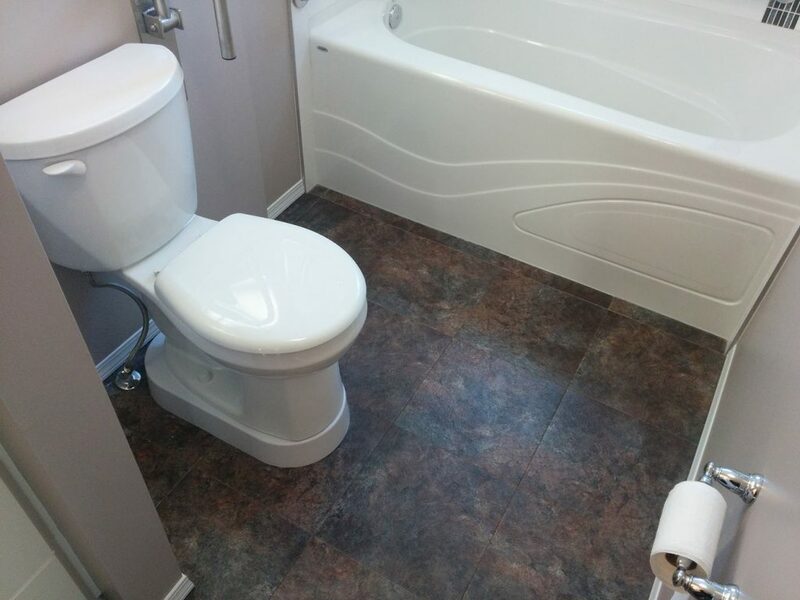 This spacious bathroom is barrier free and allows for wheelchair access. 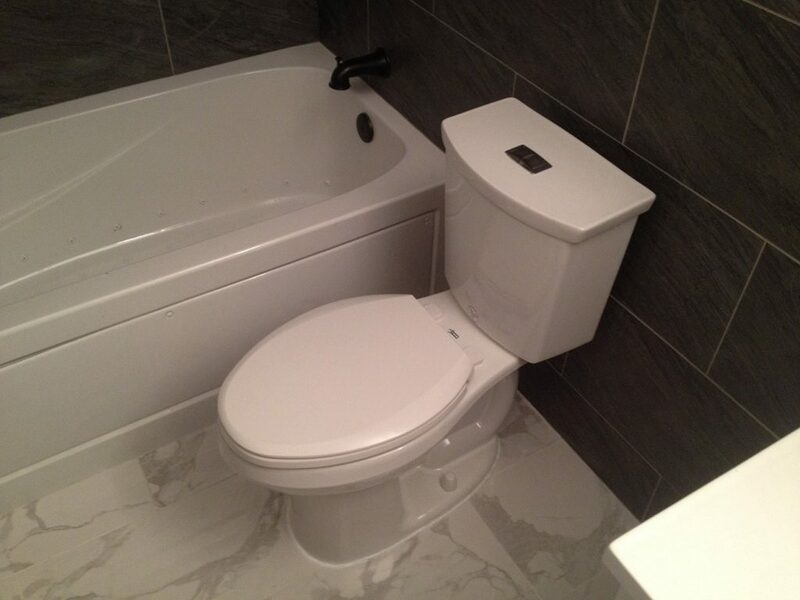 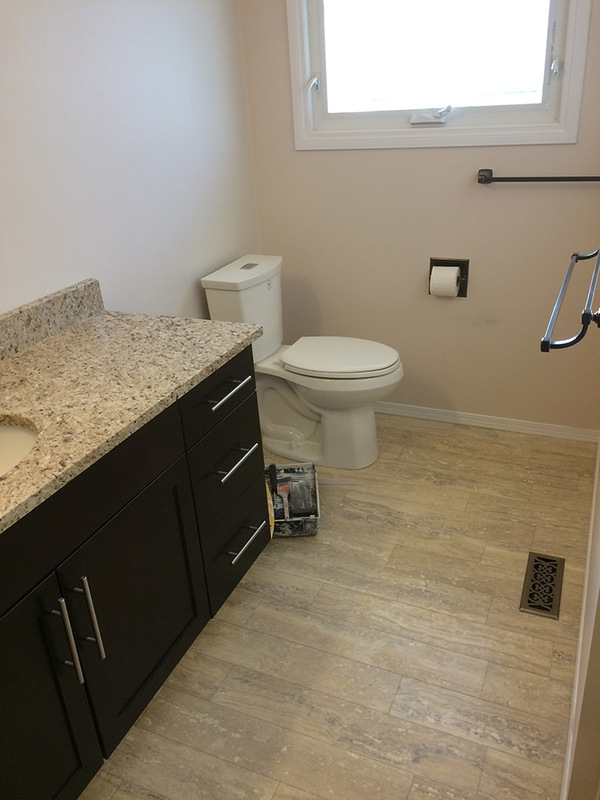 Millwoods Accessible Bathroom Renovation: This toilet looks like a regular toilet but, in fact, it is sitting on a special platform to increase its height, making it easier to sit down and get up. 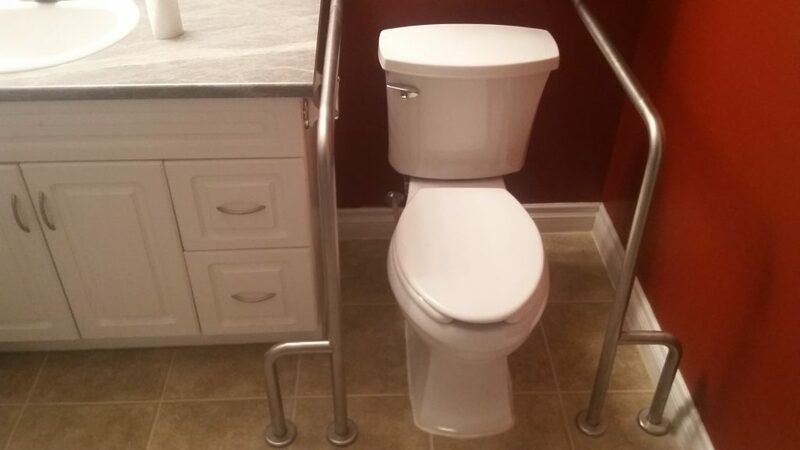 The grab bars can be folded up when not in use. 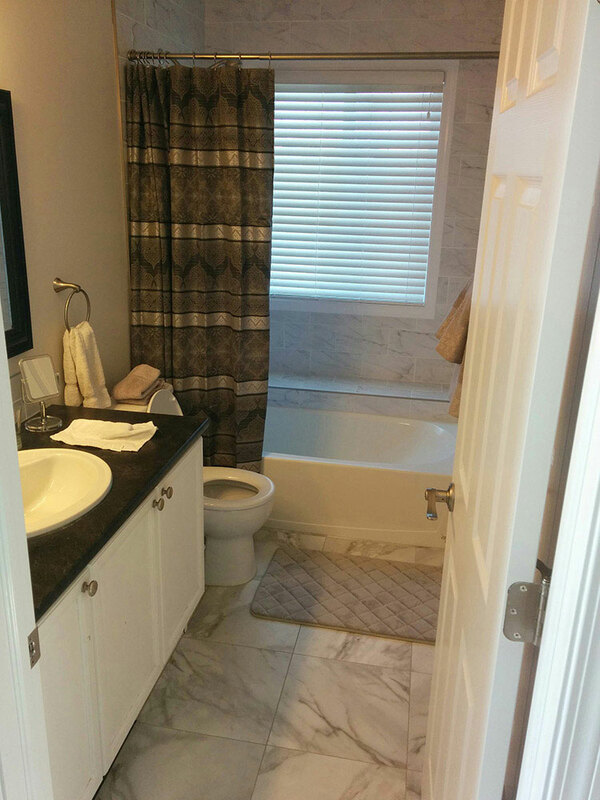 Westmount Accessible Renovation: This project involved removing a bathtub and replacing it with a walk-in shower. 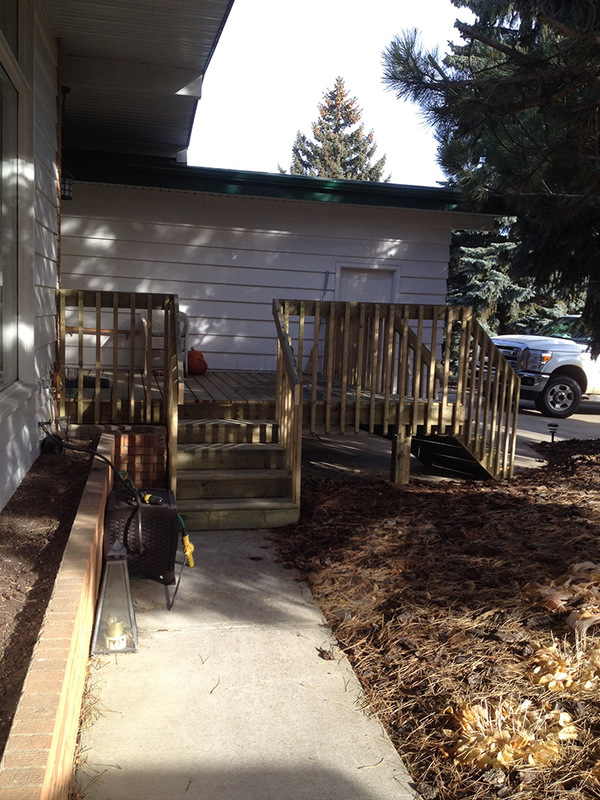 The 'curb' is sloped to allow a walker to get in if necessary. 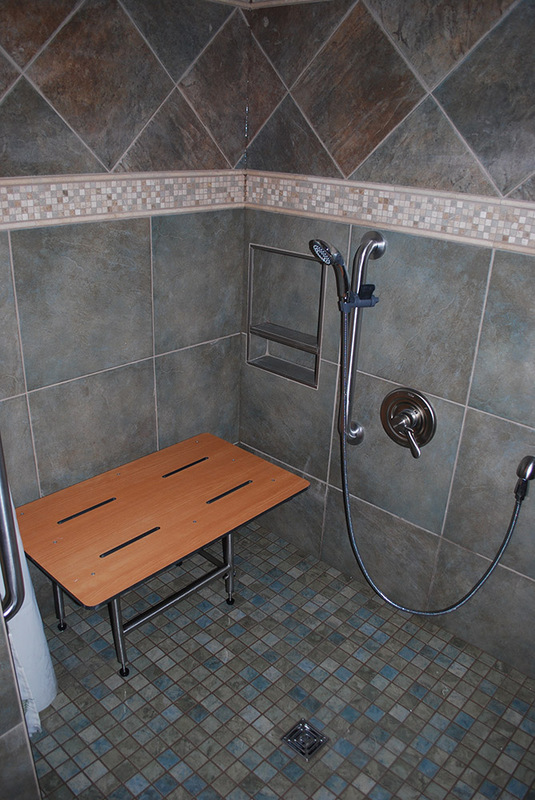 This shower and transfer bench was specially designed for one of our clients. 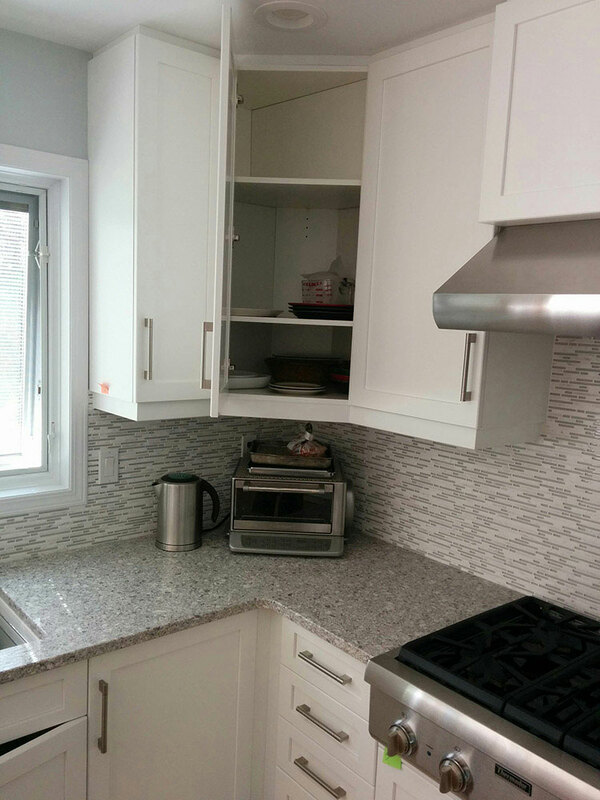 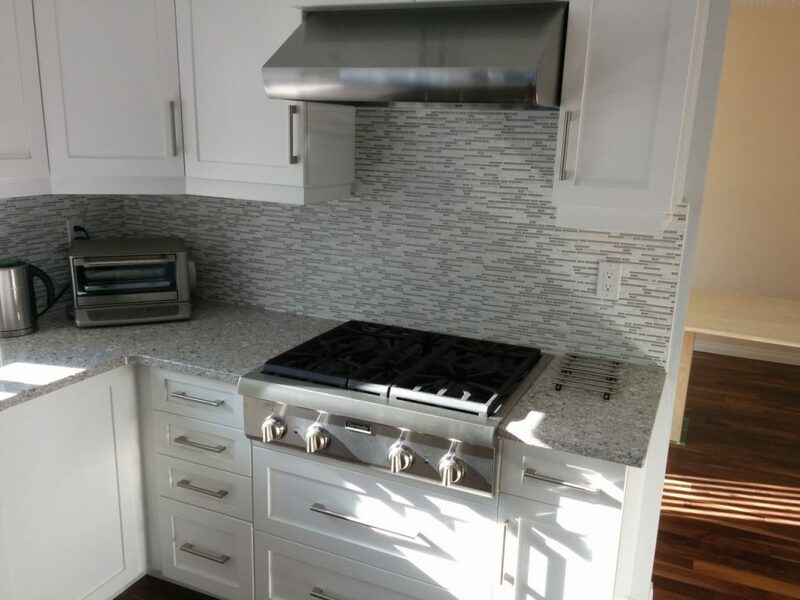 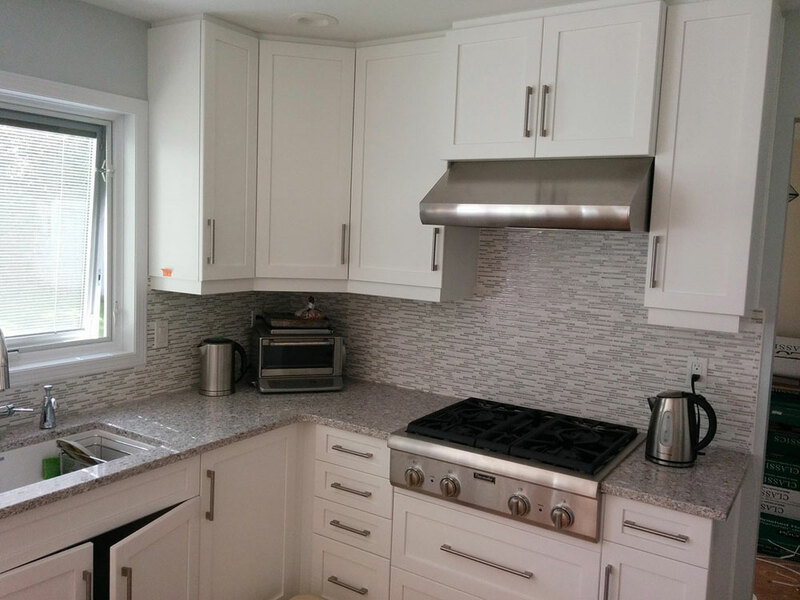 Belgravia Accessible Renovation: Part of the renovations on this home included making sure the kitchen was accessible for someone in a wheelchair. 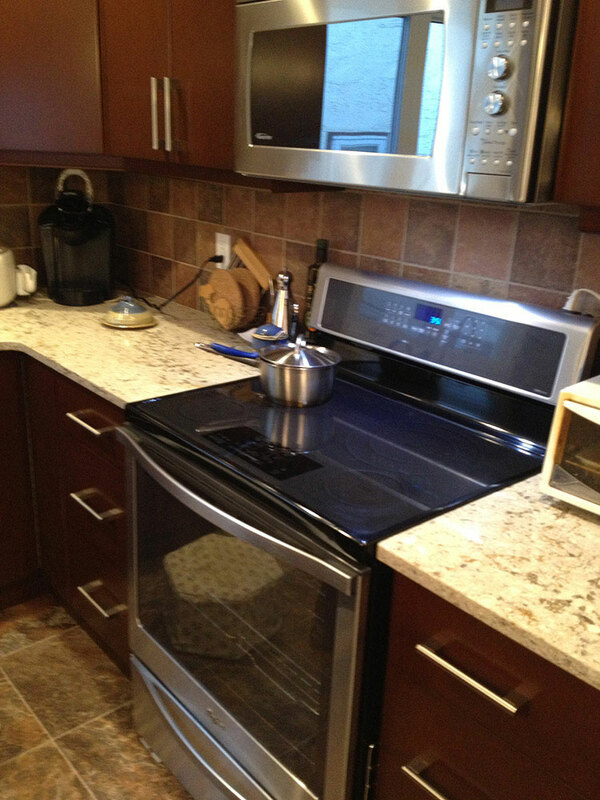 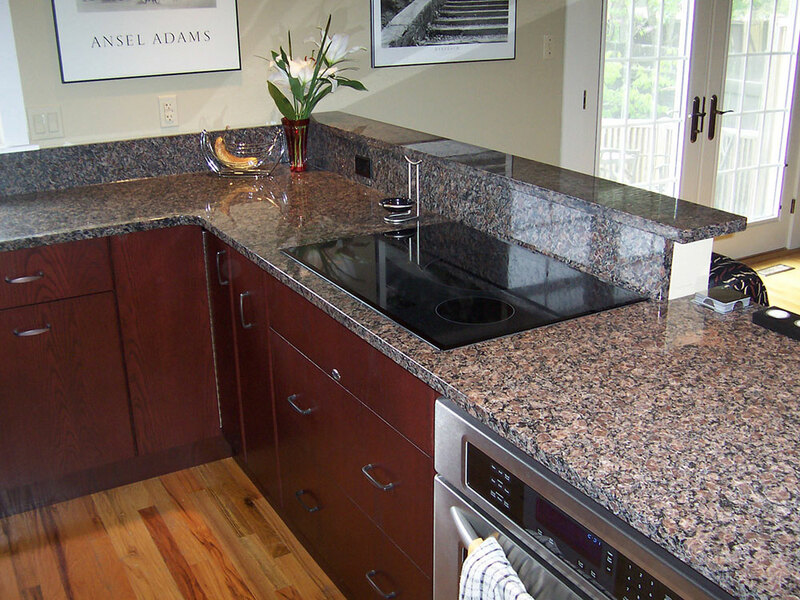 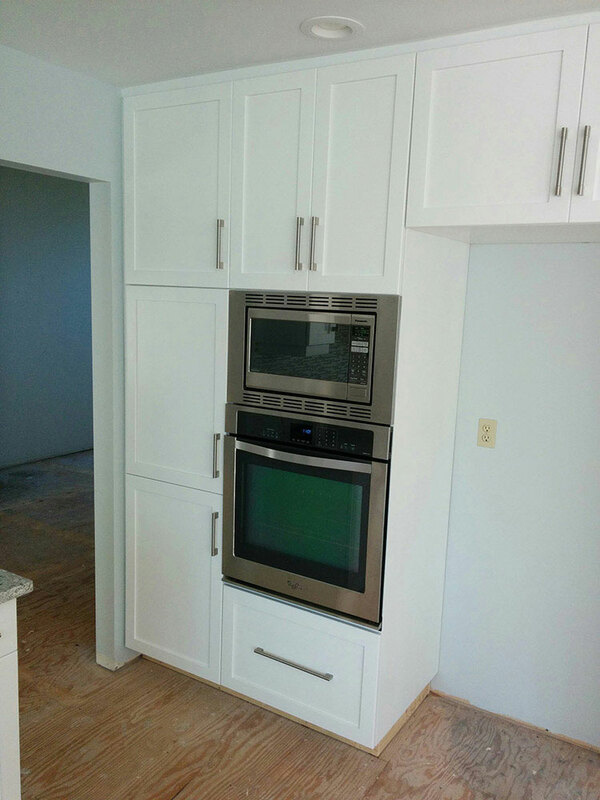 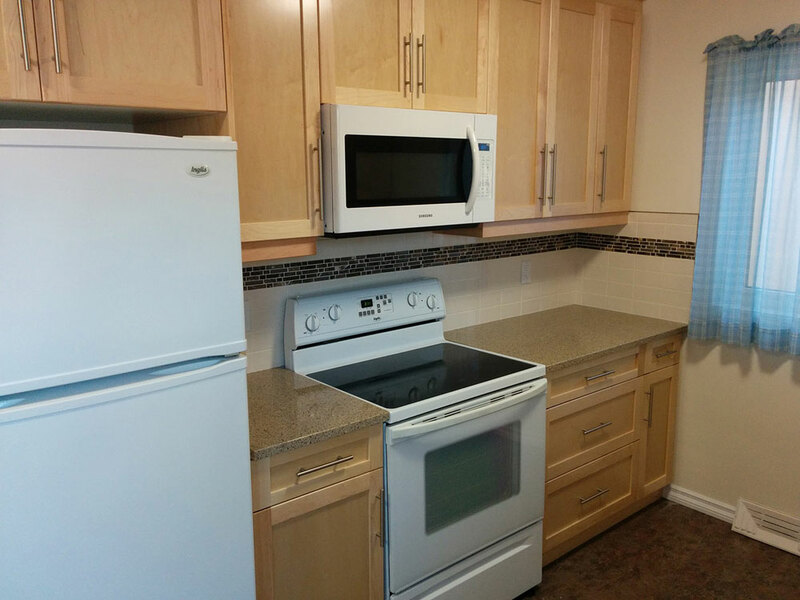 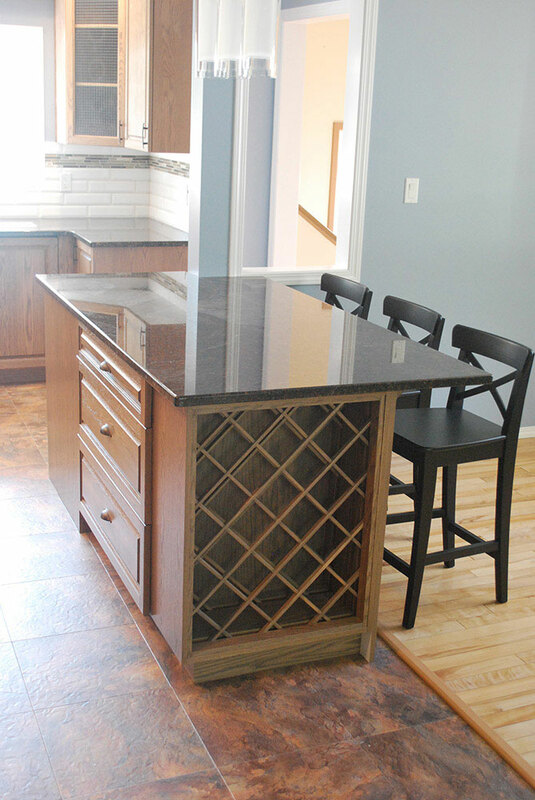 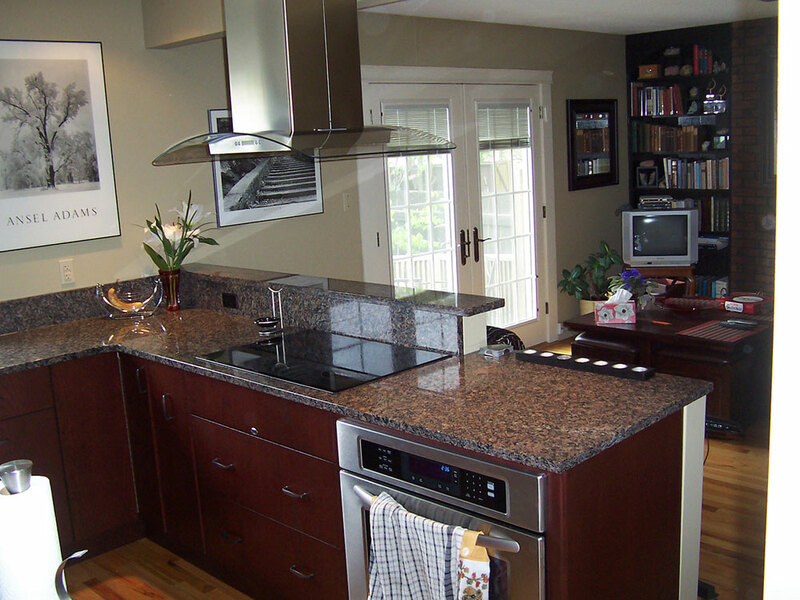 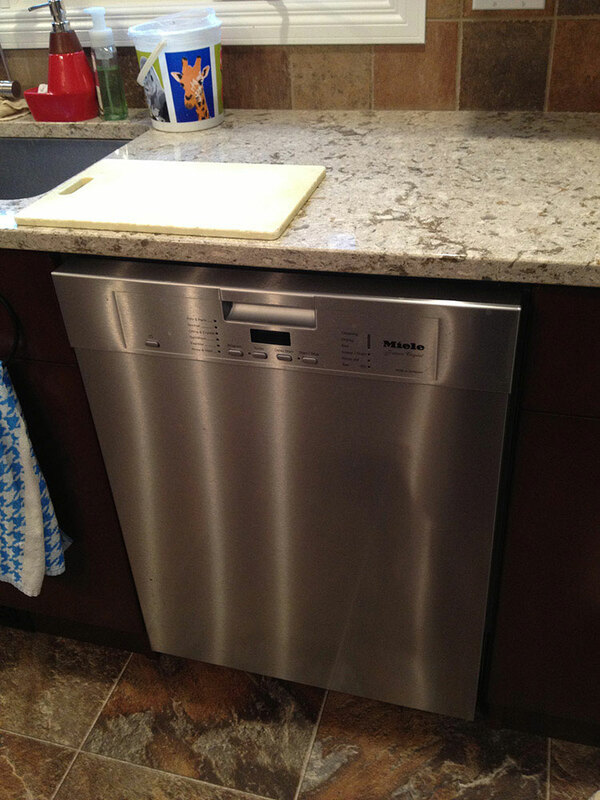 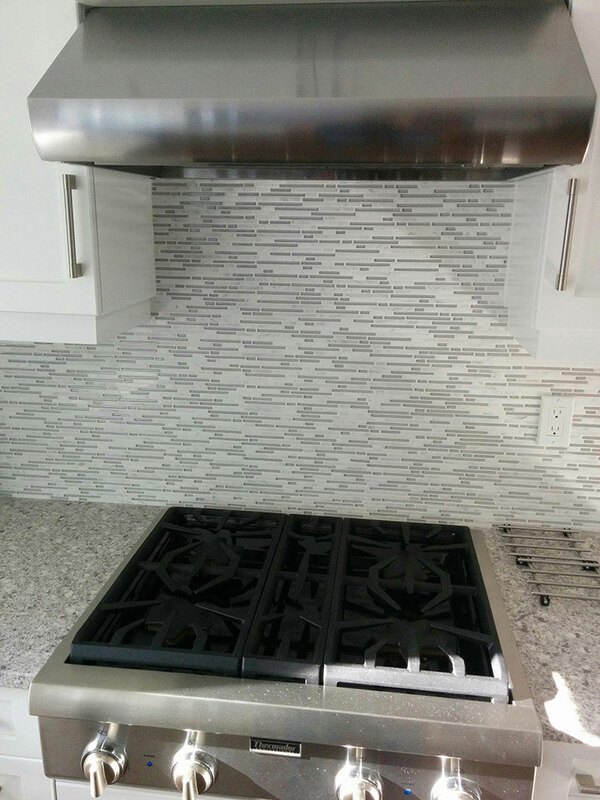 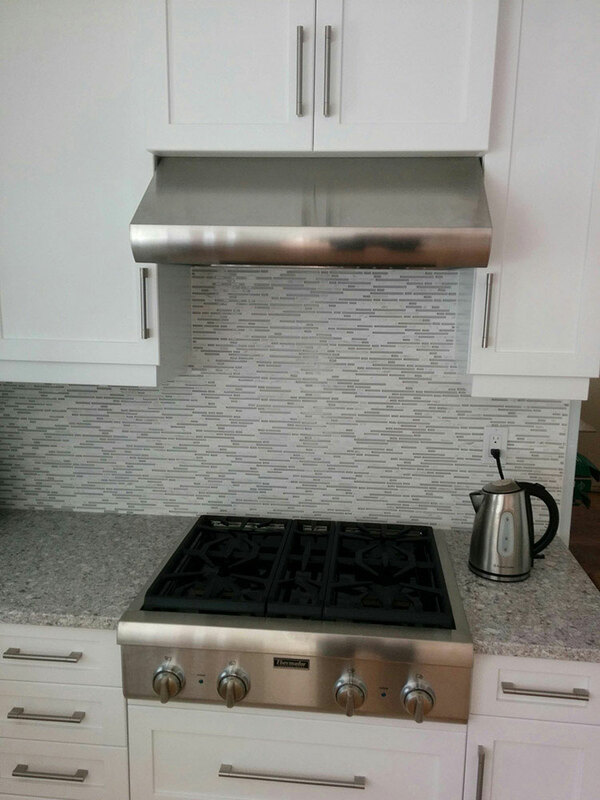 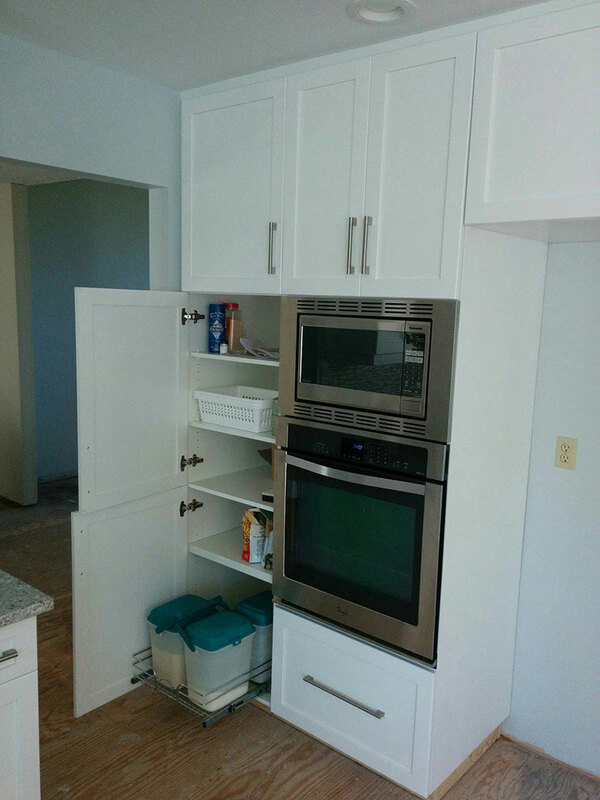 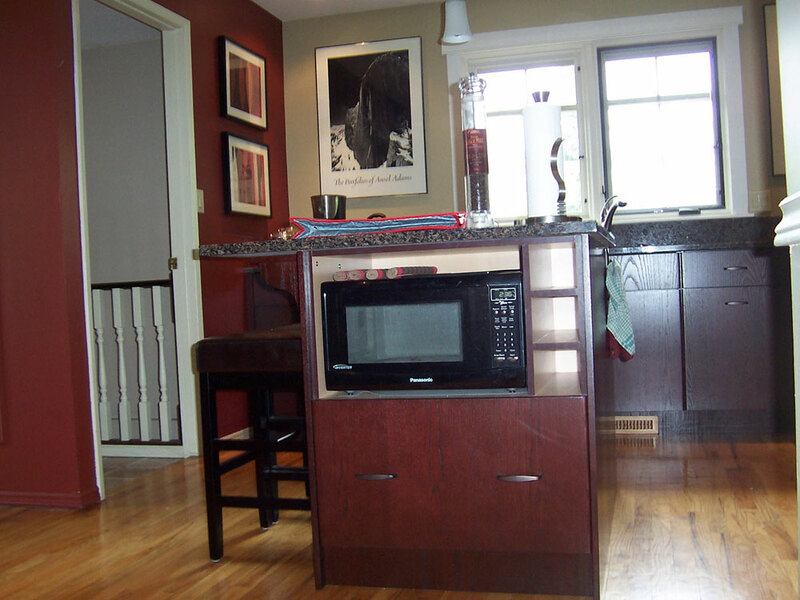 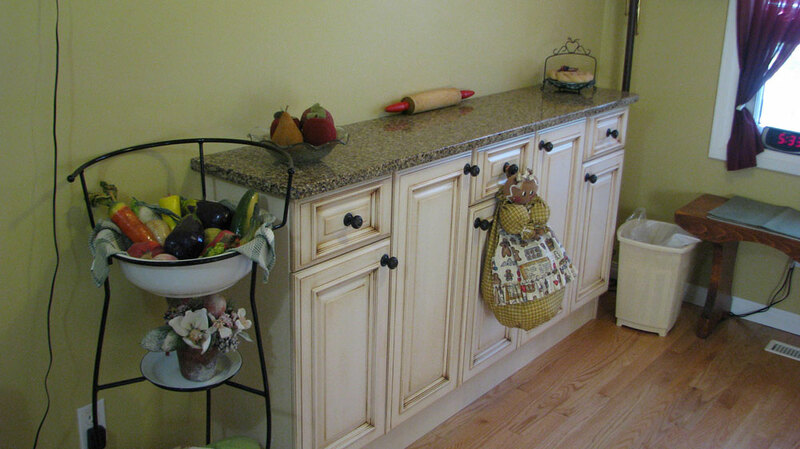 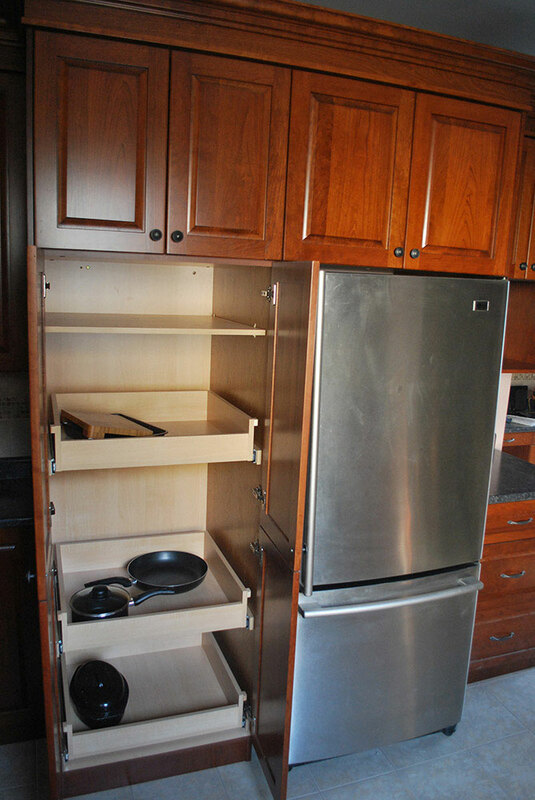 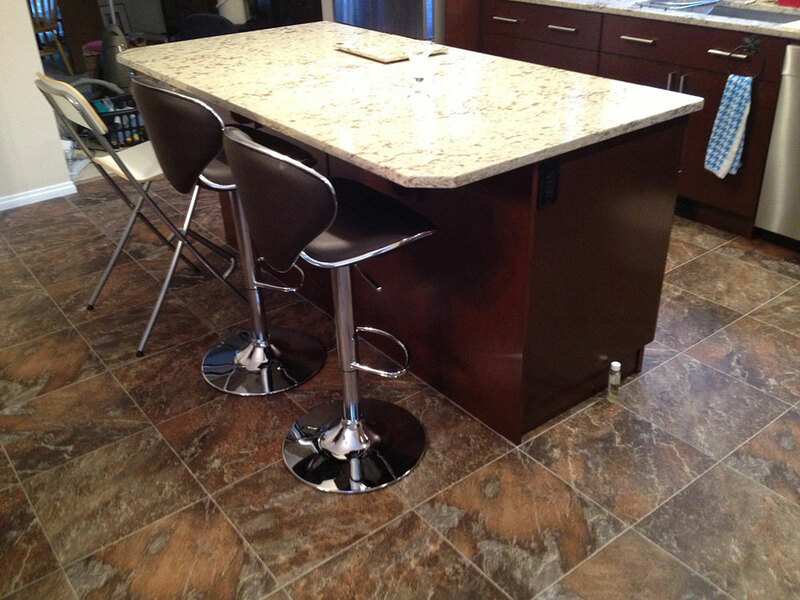 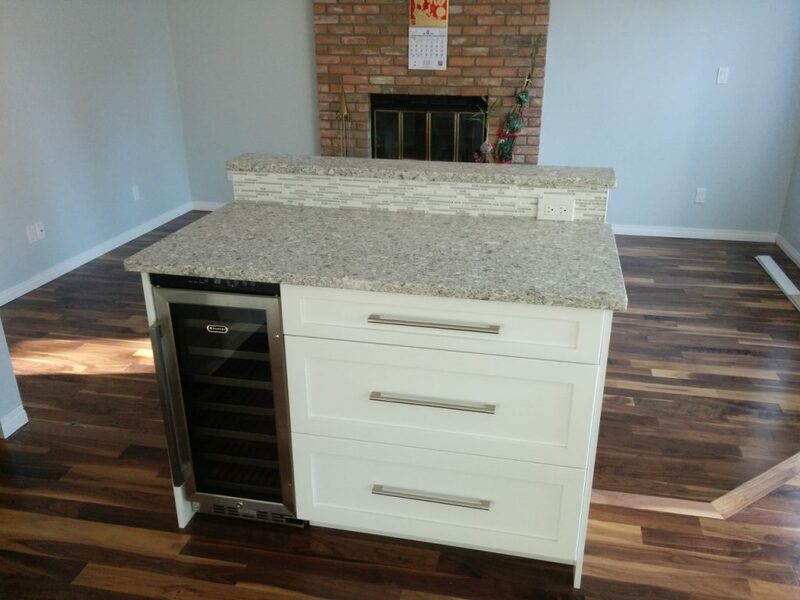 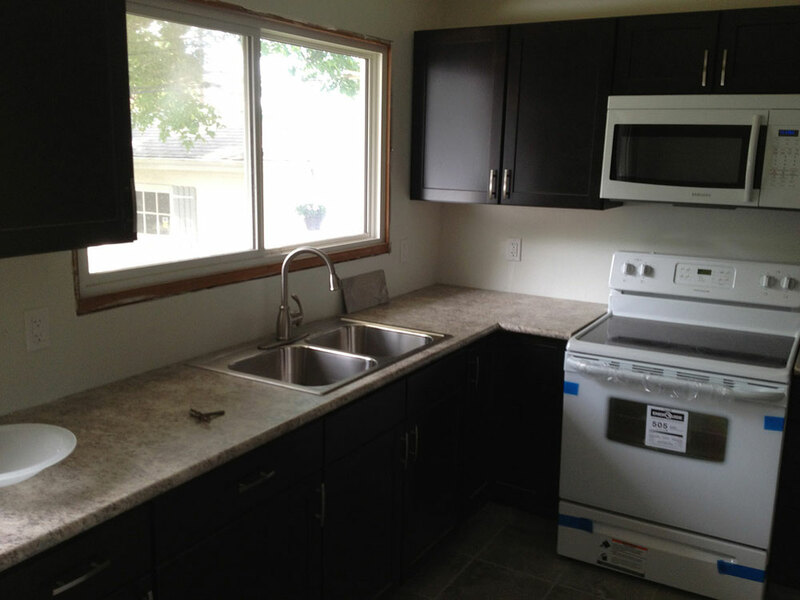 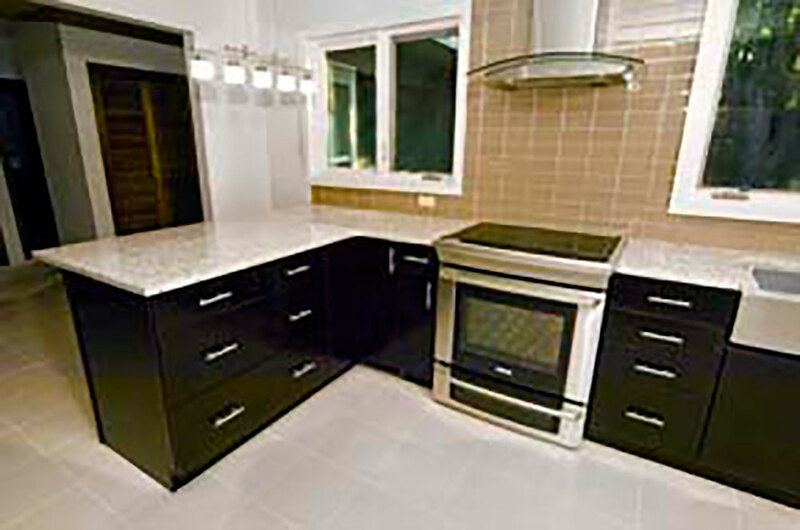 The oven, the island and the cook top all can be accessed while seated. 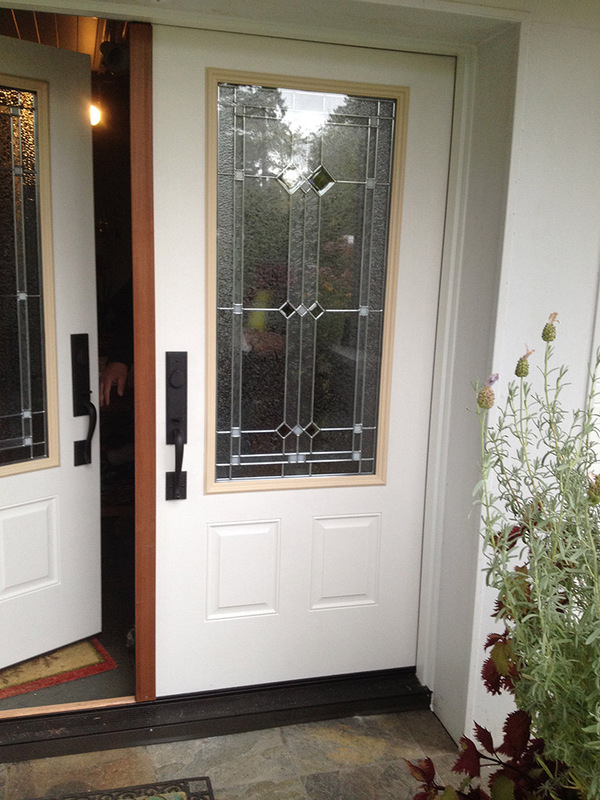 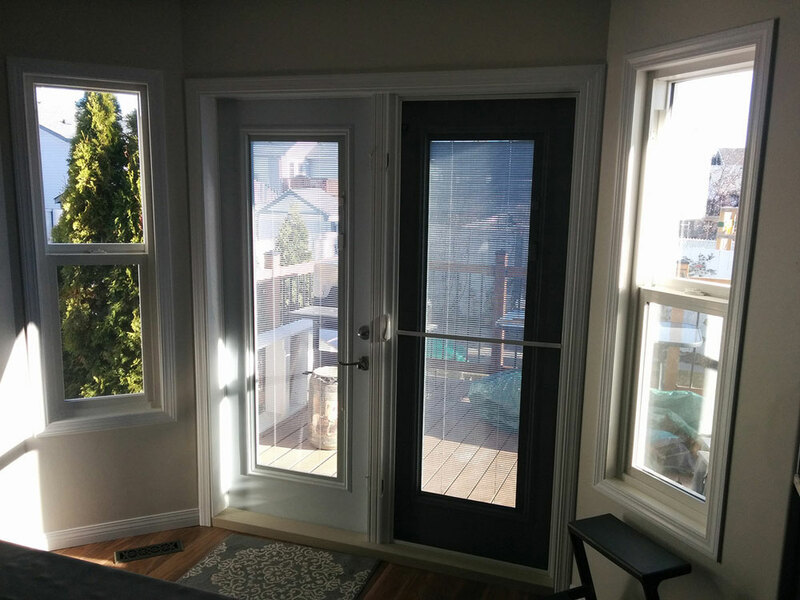 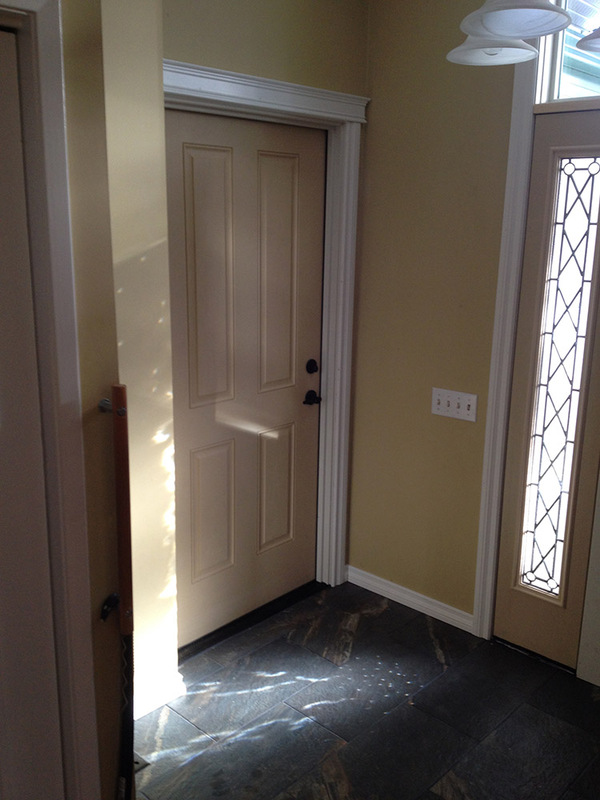 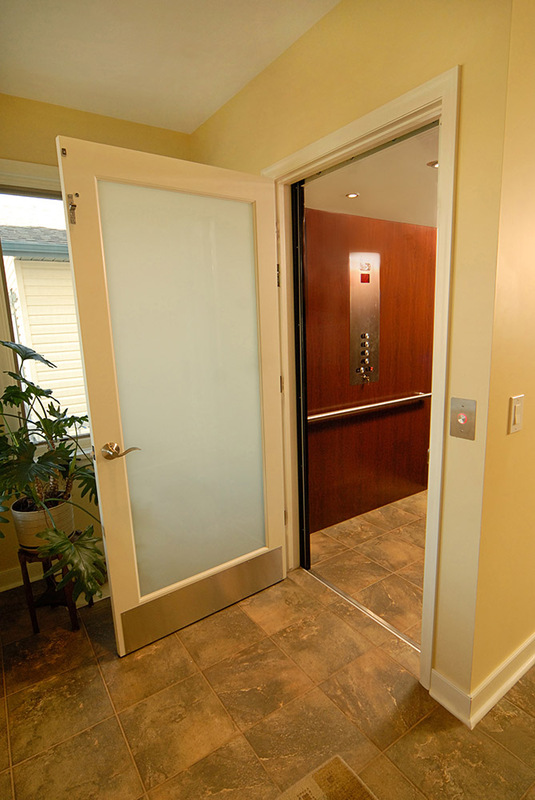 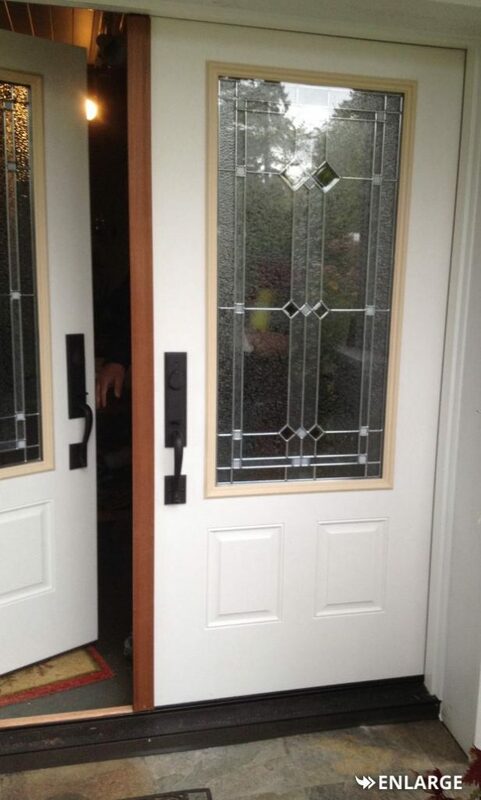 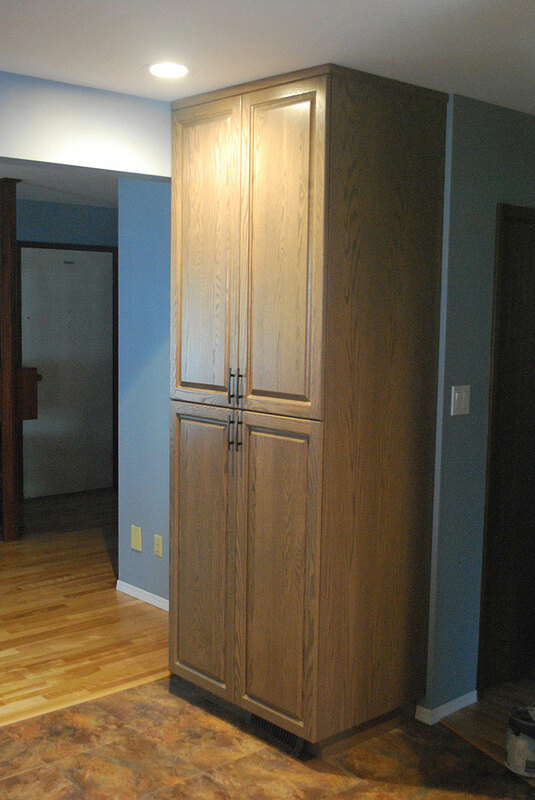 Begravia Accessible Renovation: In order to access the second floor using a wheelchair, we installed a custom elevator. 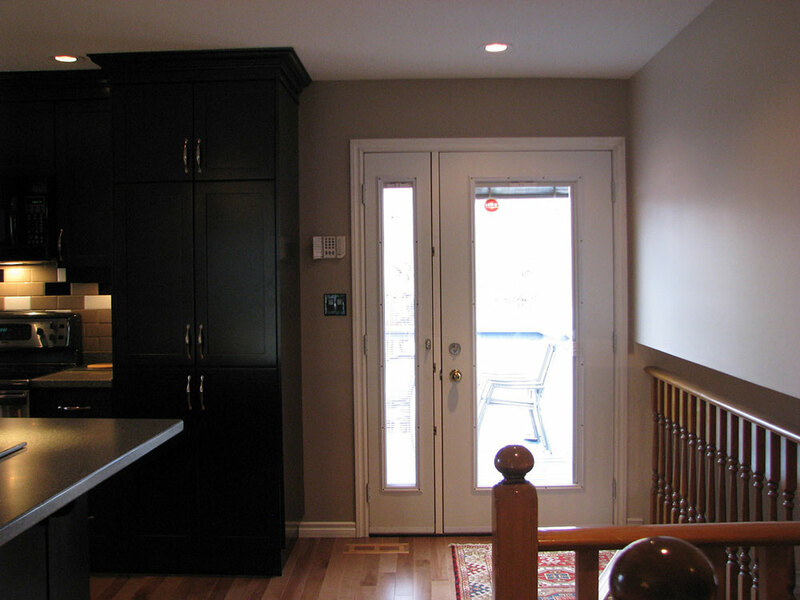 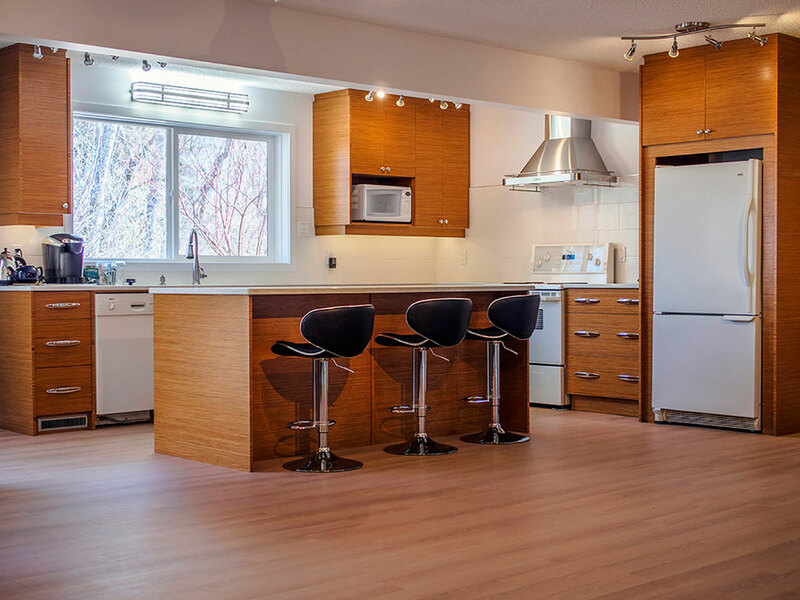 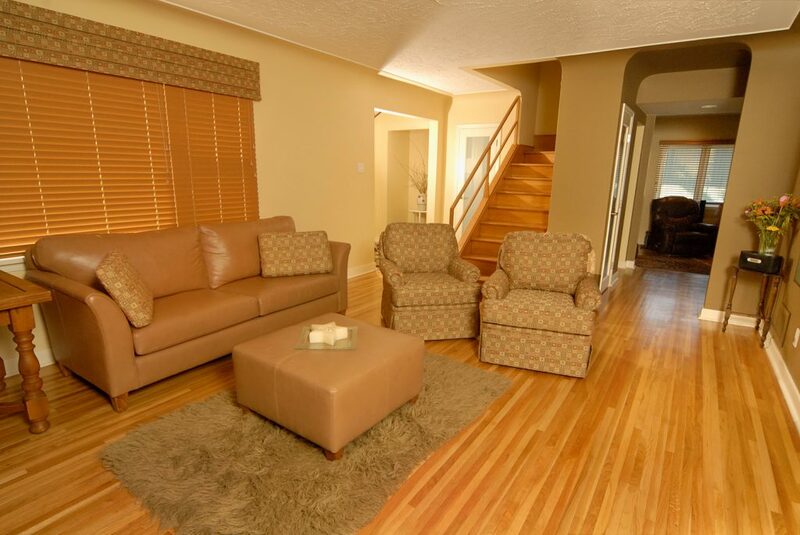 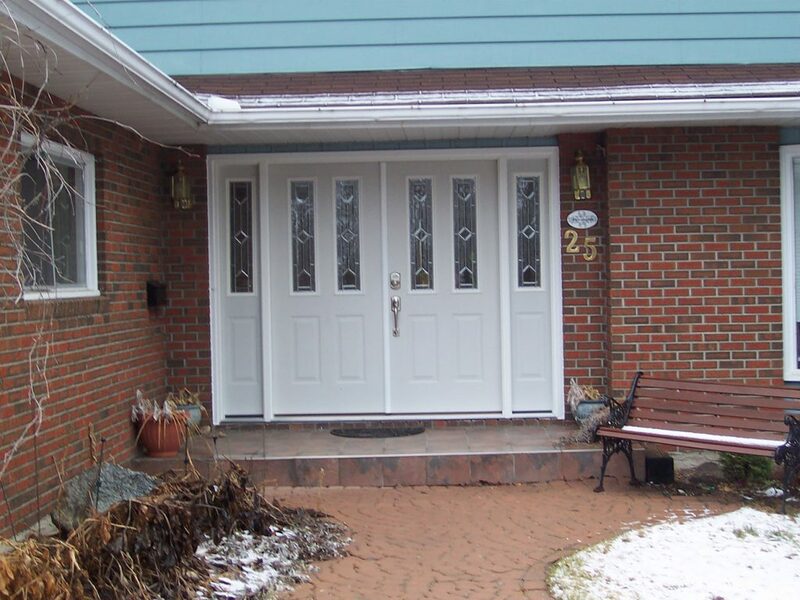 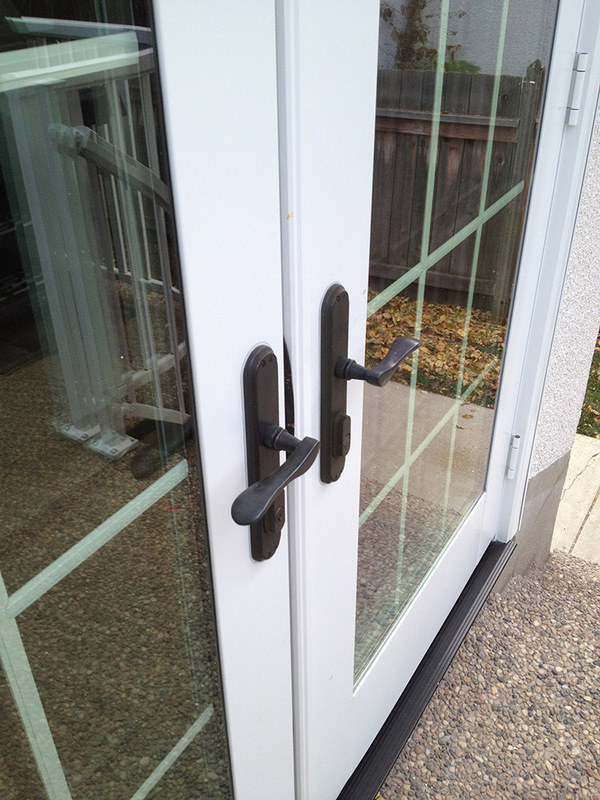 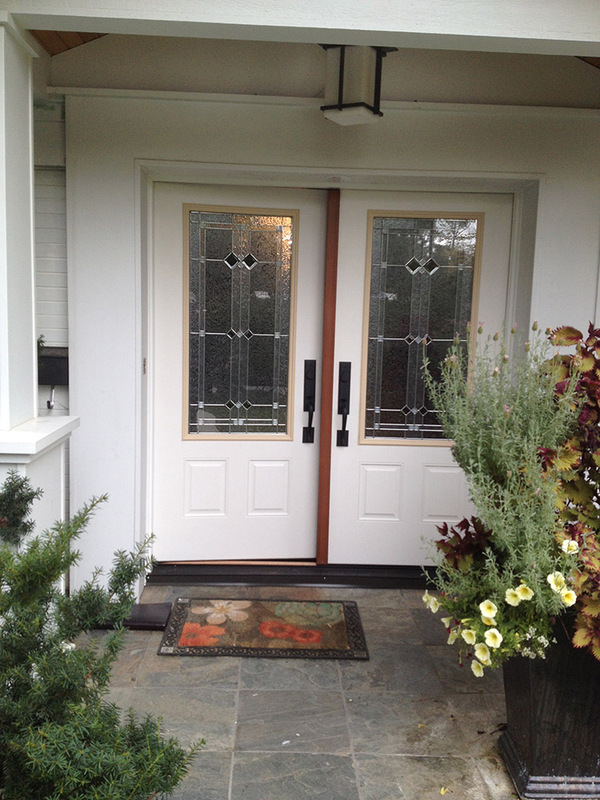 Belgravia Renovation: Extensive renovations were completed on this home to make it wheelchair accessible. 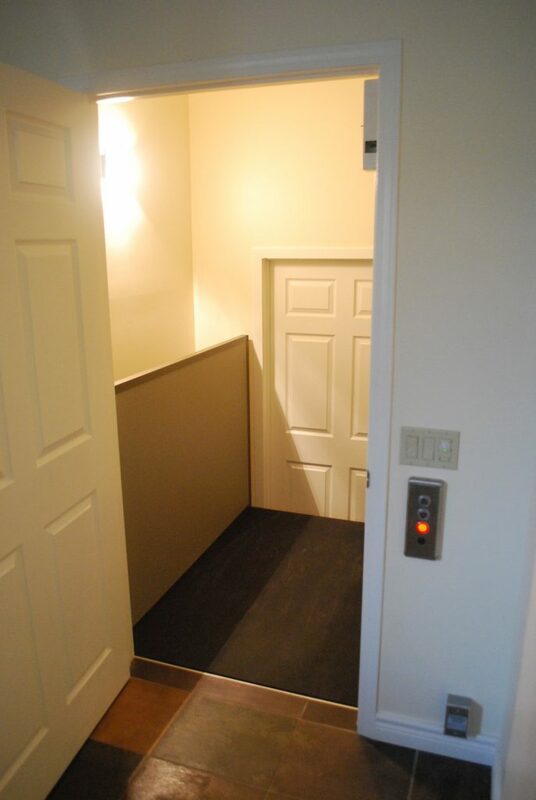 The second floor is accessed using an elevator. 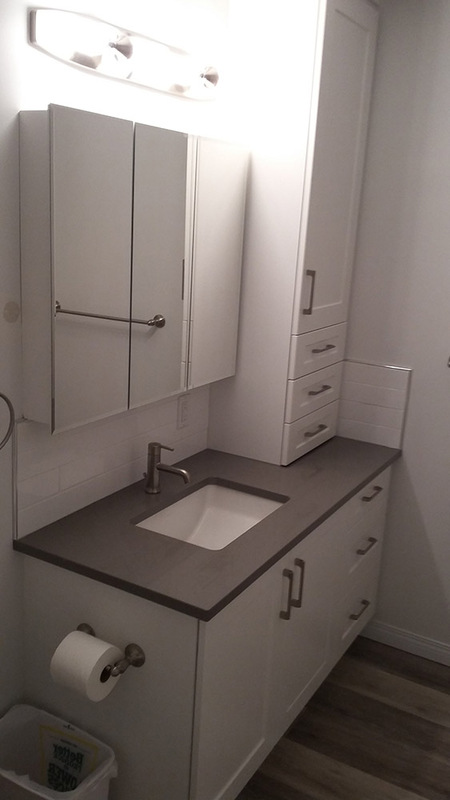 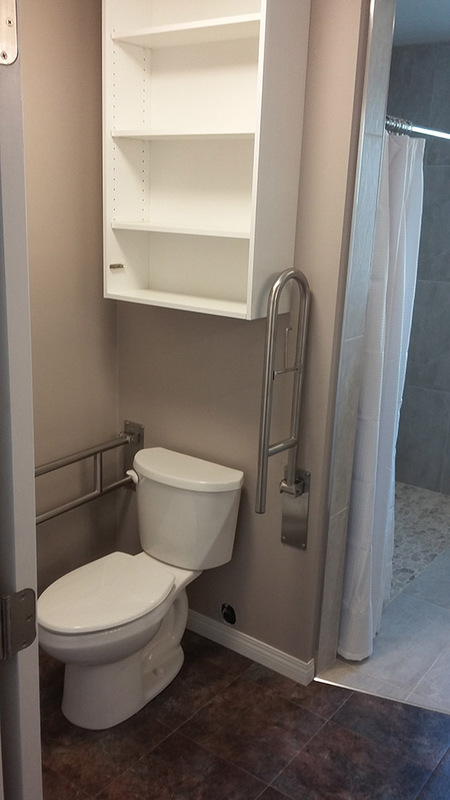 Westmount Accessible Renovation: The toilet is a ADA approved comfort-height toilet and also has two grab bars mounted to the wall and bolted to the concrete floor. 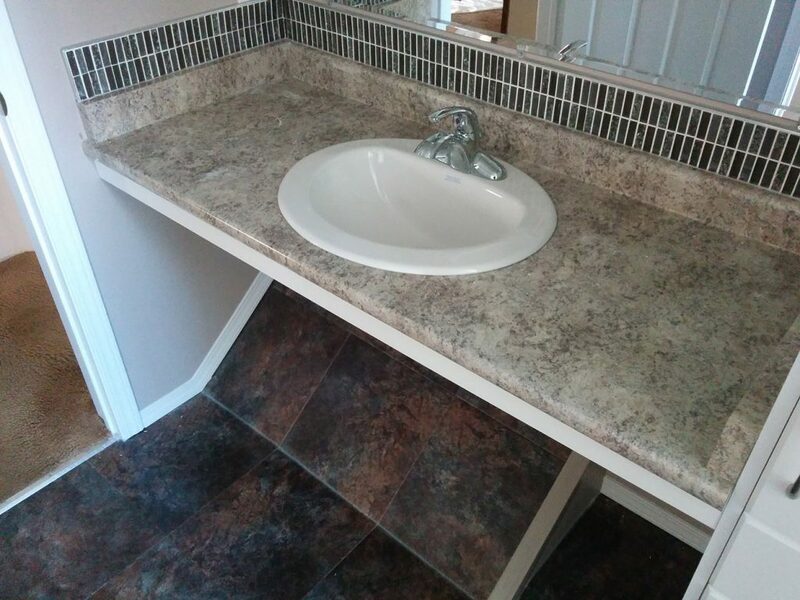 A new top for the vanity replaced the banjo style top that was there before. 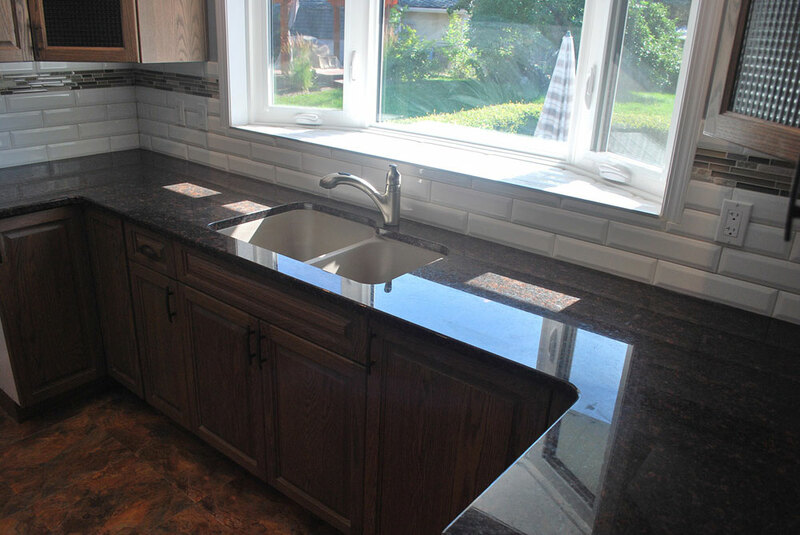 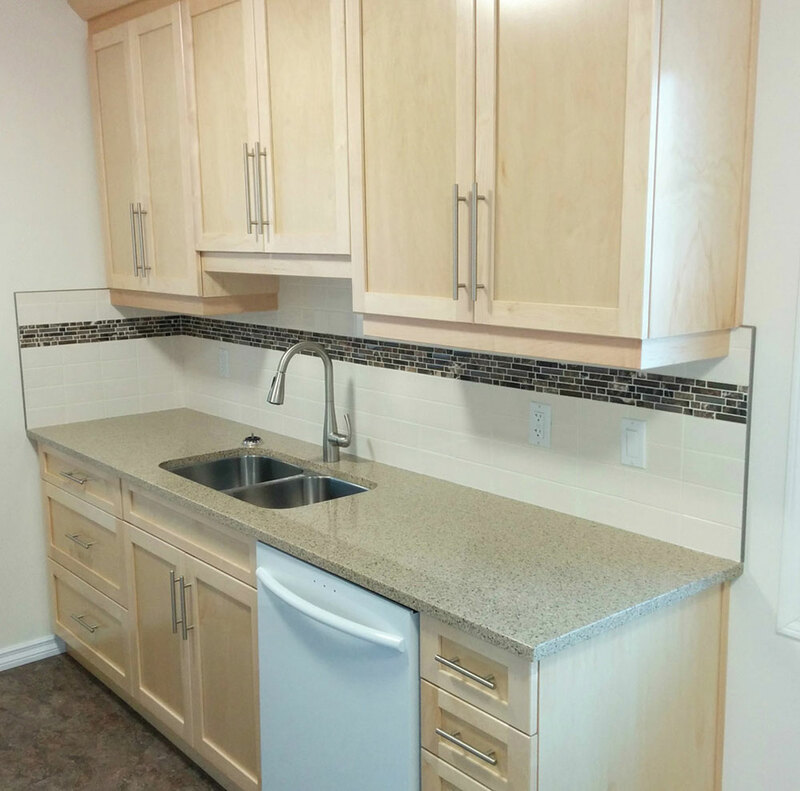 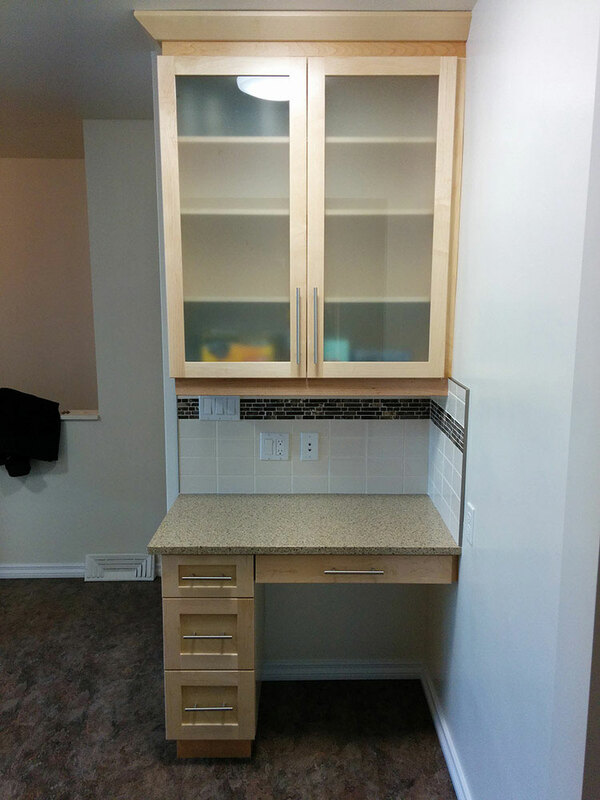 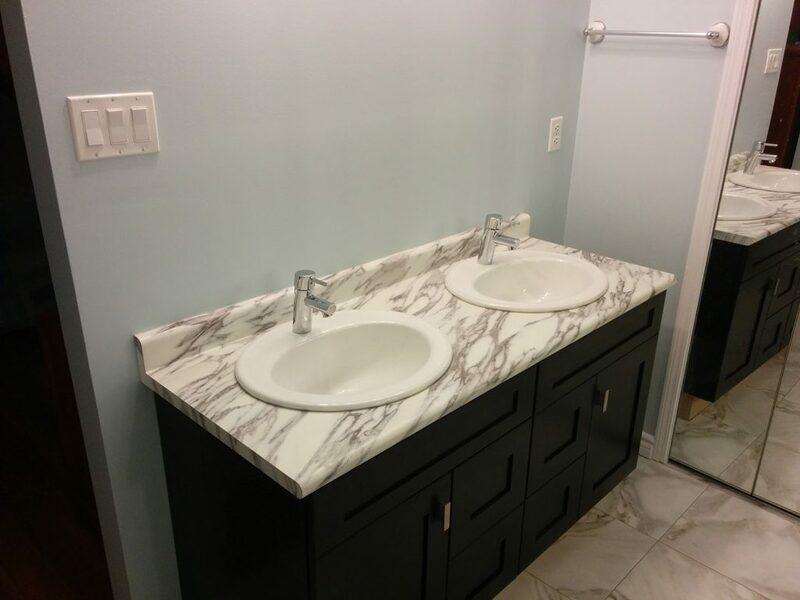 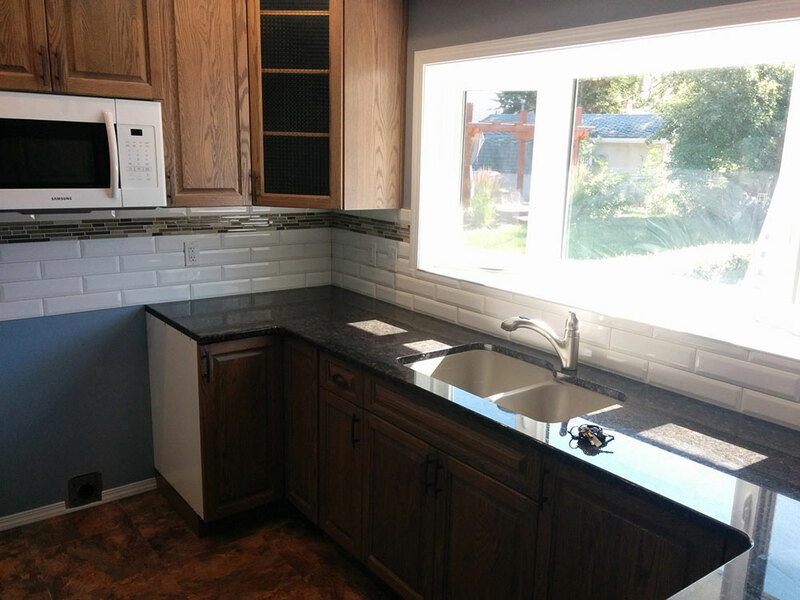 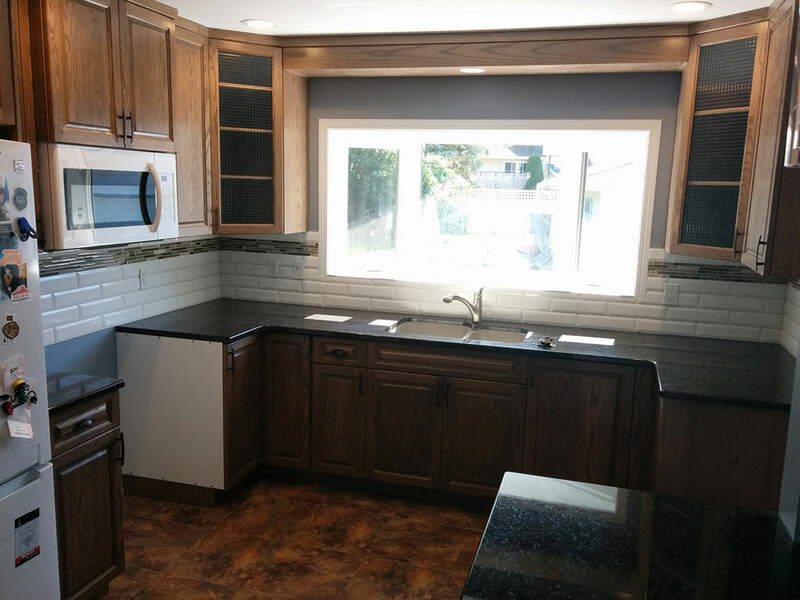 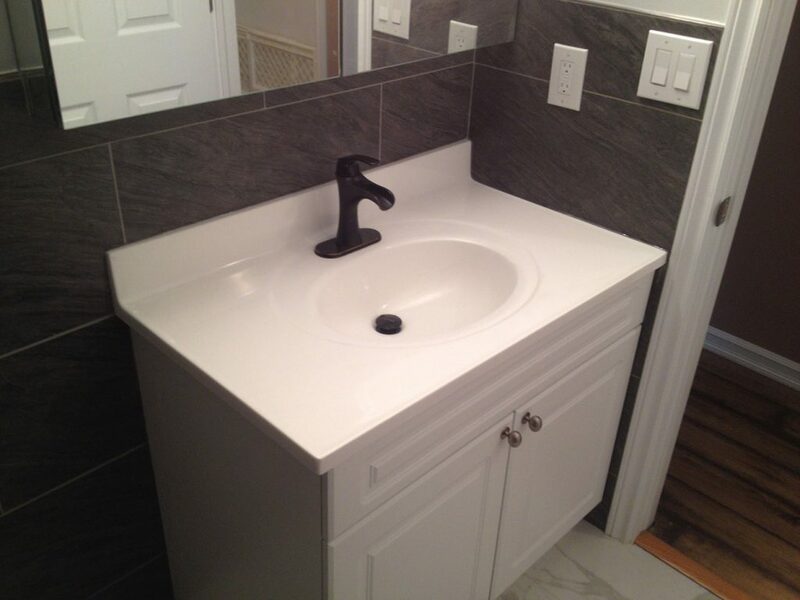 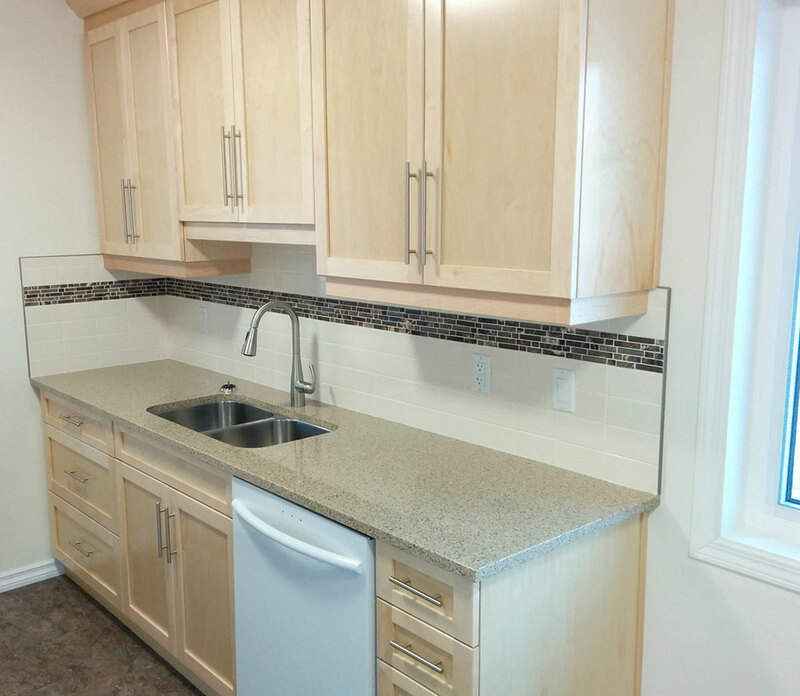 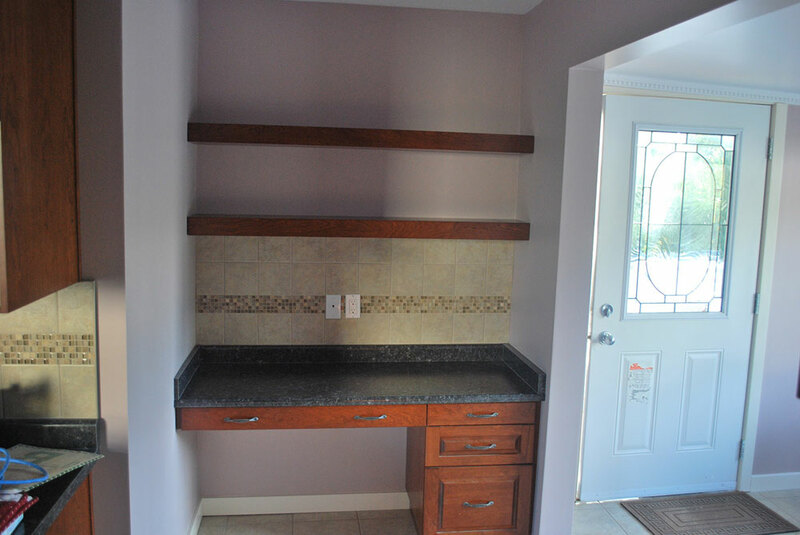 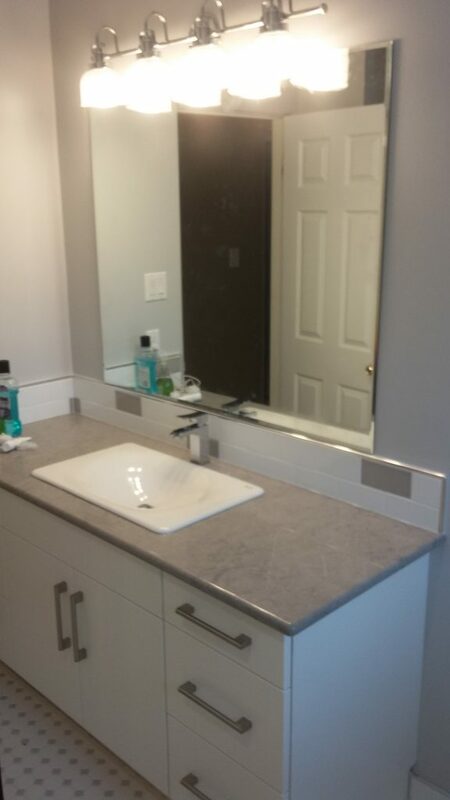 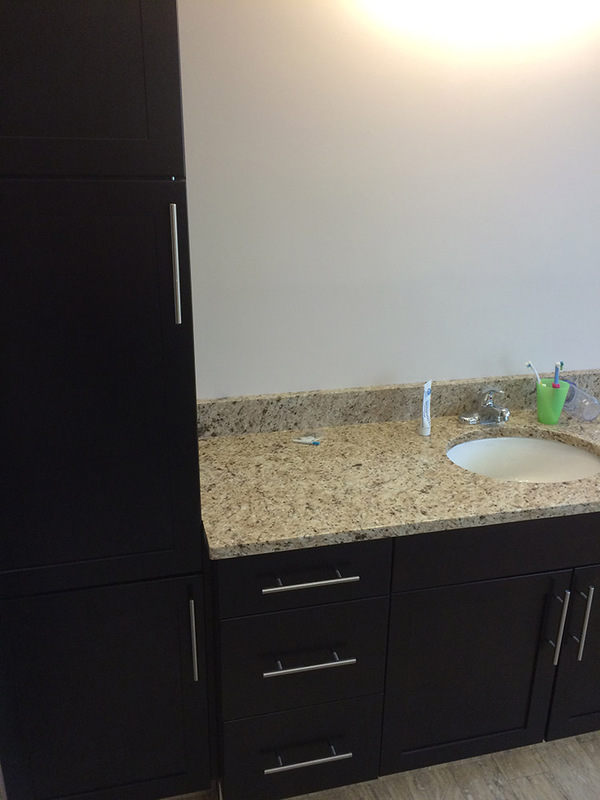 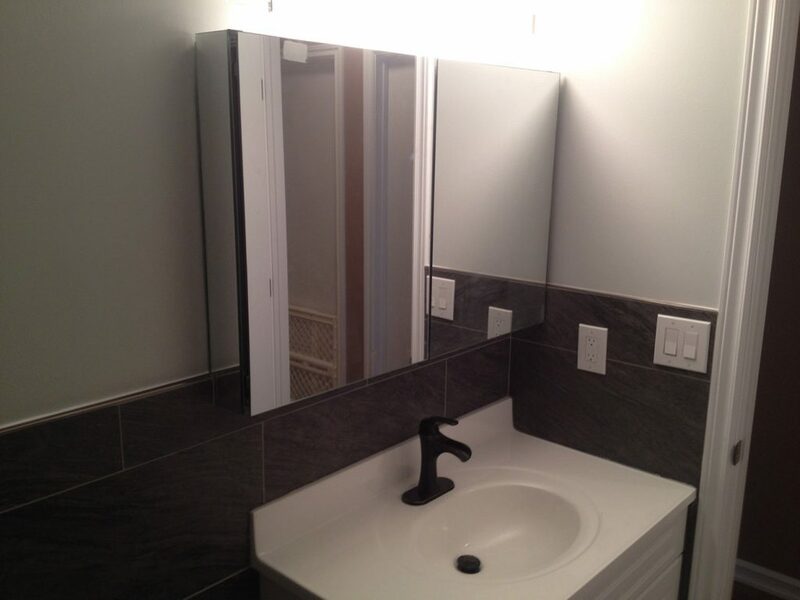 Sherwood Park Accessible Renovation: Custom vanity with grey quartz counter top and a cast iron sink. 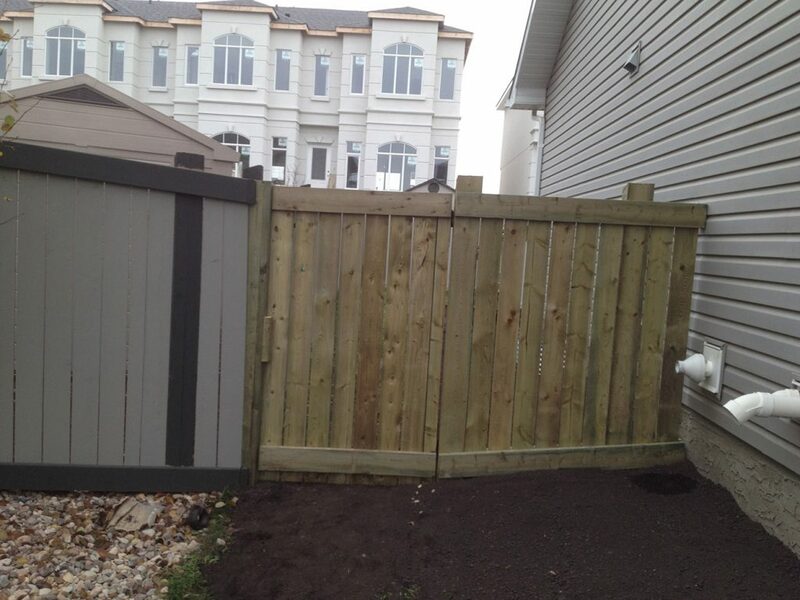 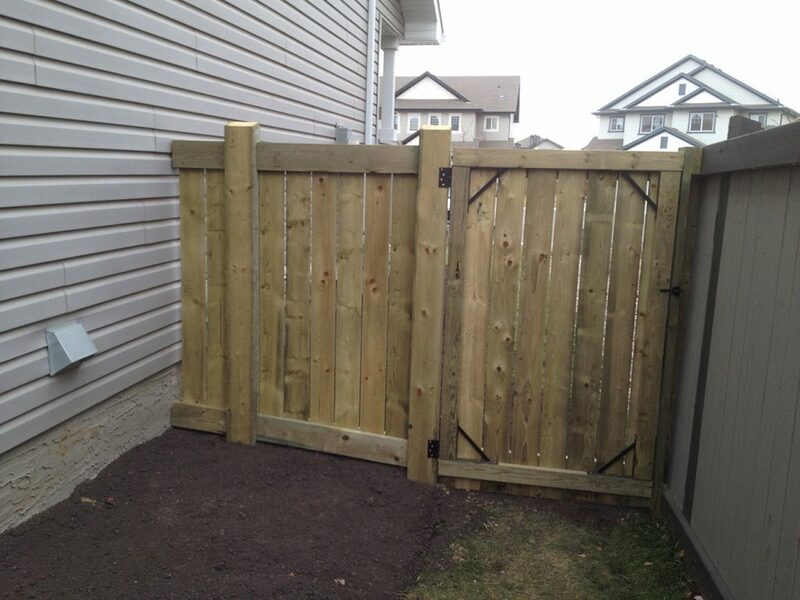 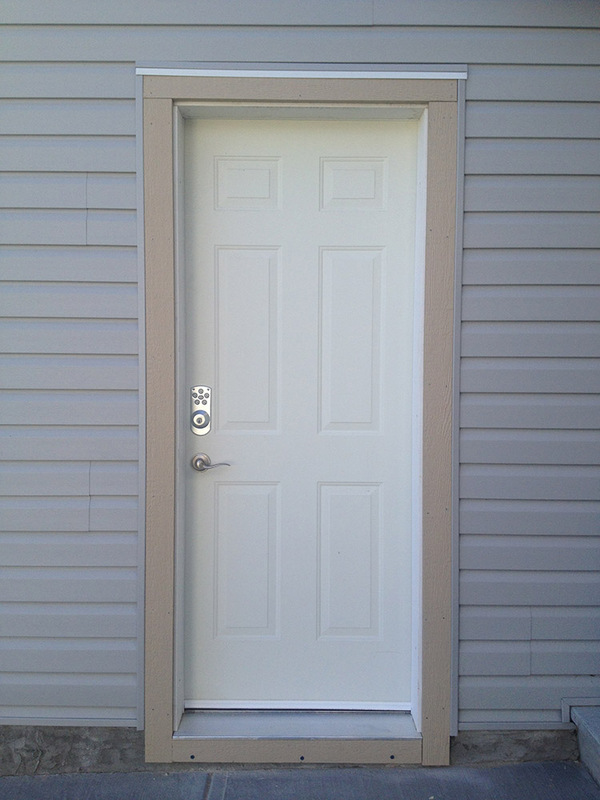 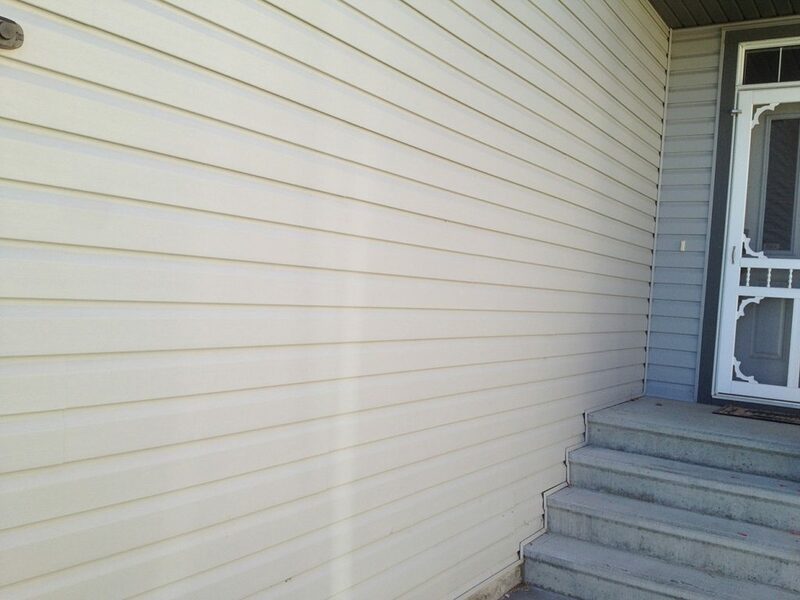 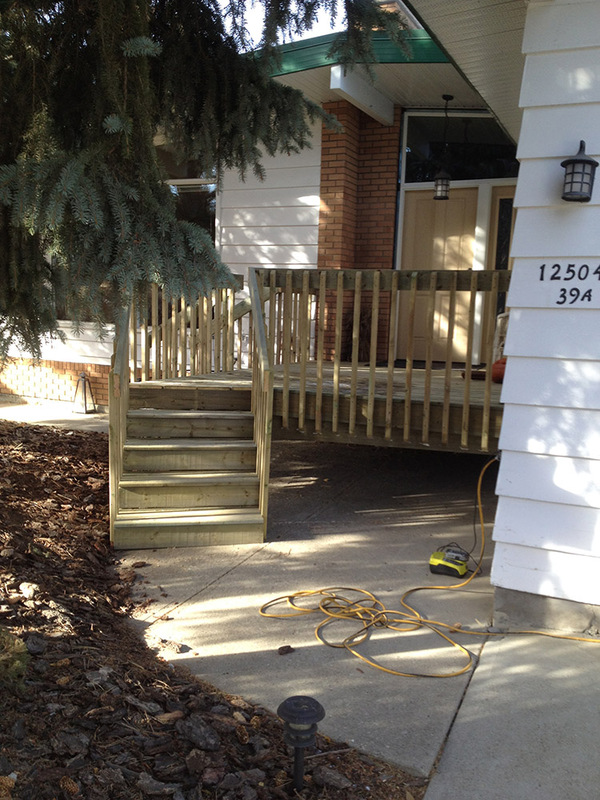 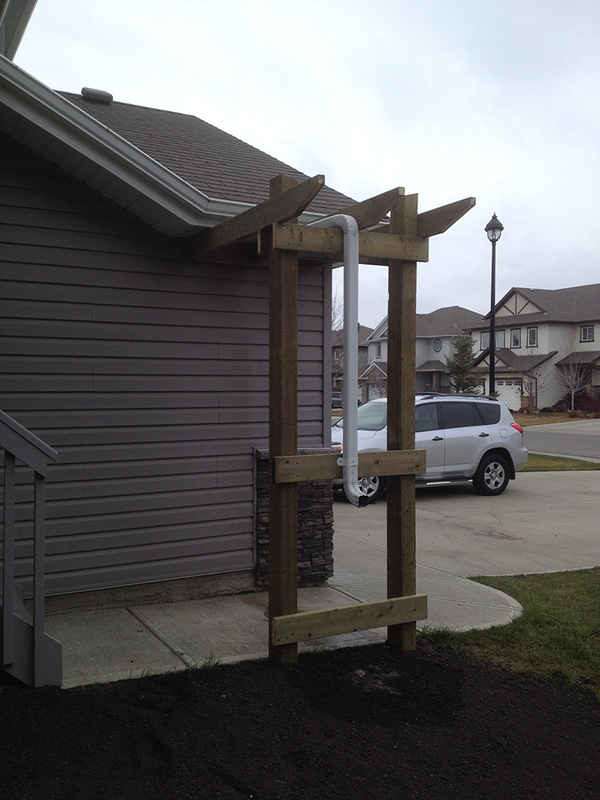 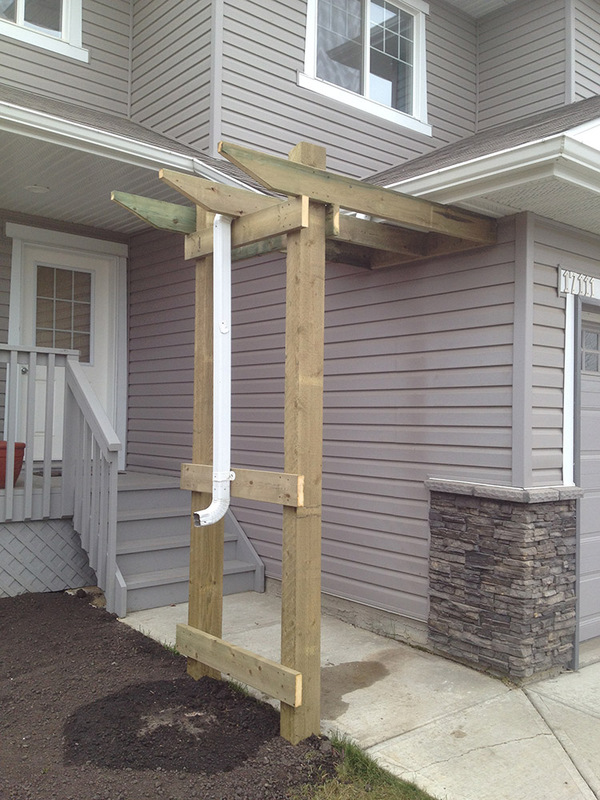 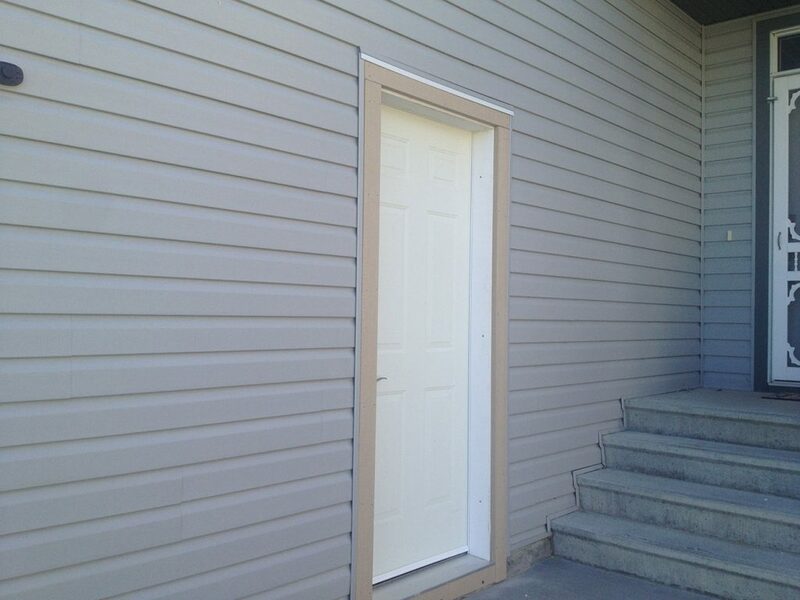 Sturgeon County Accessible Renovation: In addition to renovating the bathroom to be wheelchair accessible, we also designed and built this wheelchair ramp to allow our client egress in case of an emergency. 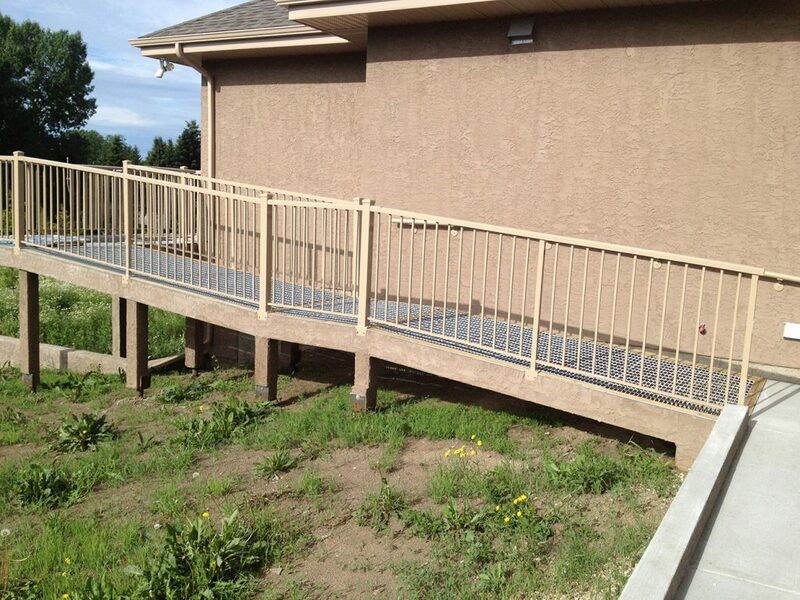 The ramp is built with pressure treated posts on pilings and pressure treated beams. 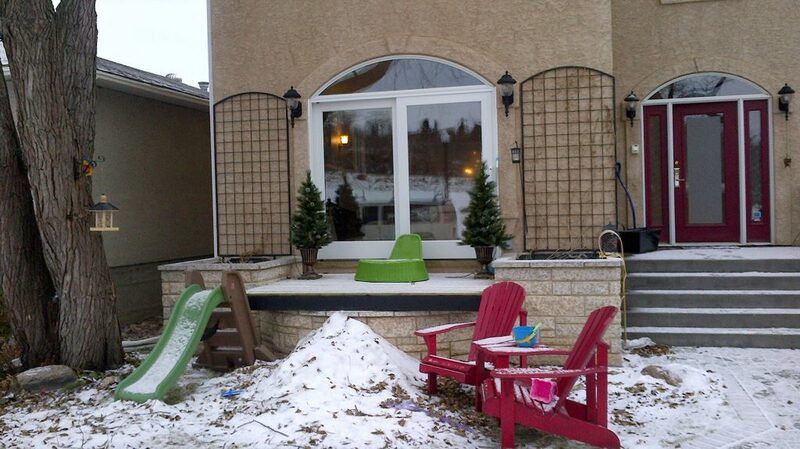 Steel grating was chosen instead of other surfaces because it is non-skid and allows snow to fall through during the winter. 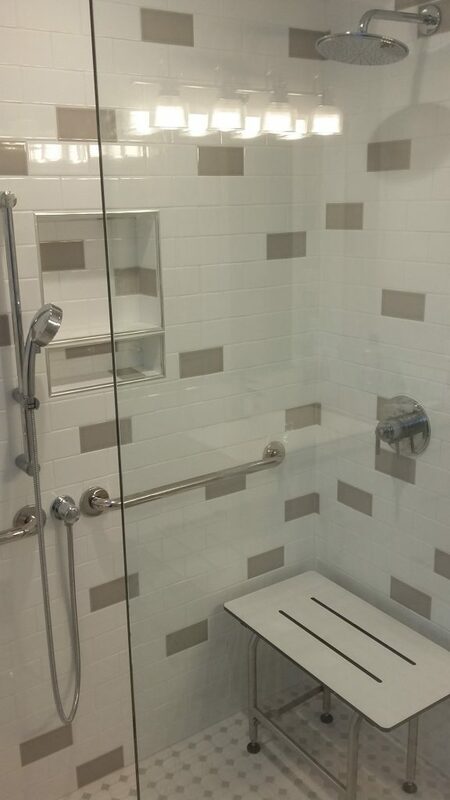 Kensington Accessible Shower Renovation: A closeup of the phenolic resin shower bench that we use for our accessible showers. 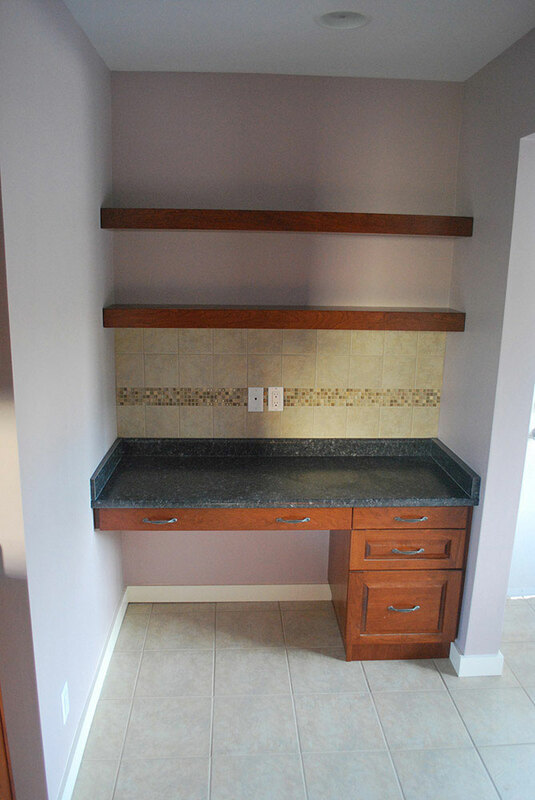 The bench won't grow mold or rot and it can support up to 500 pounds. 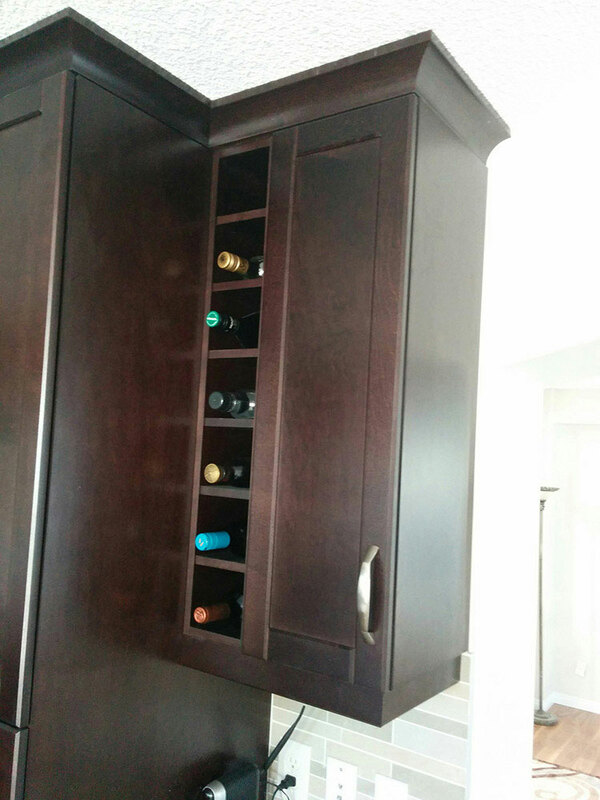 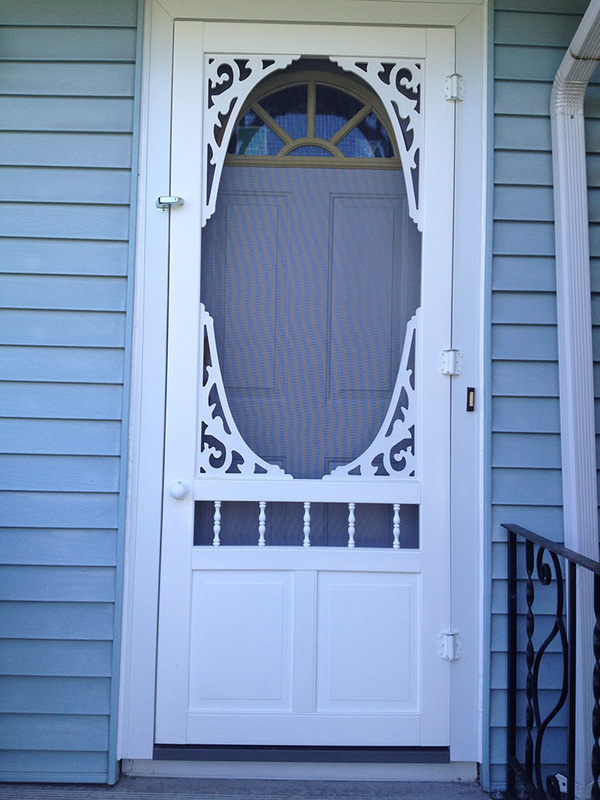 This one is in white but a natural wood color is also available. 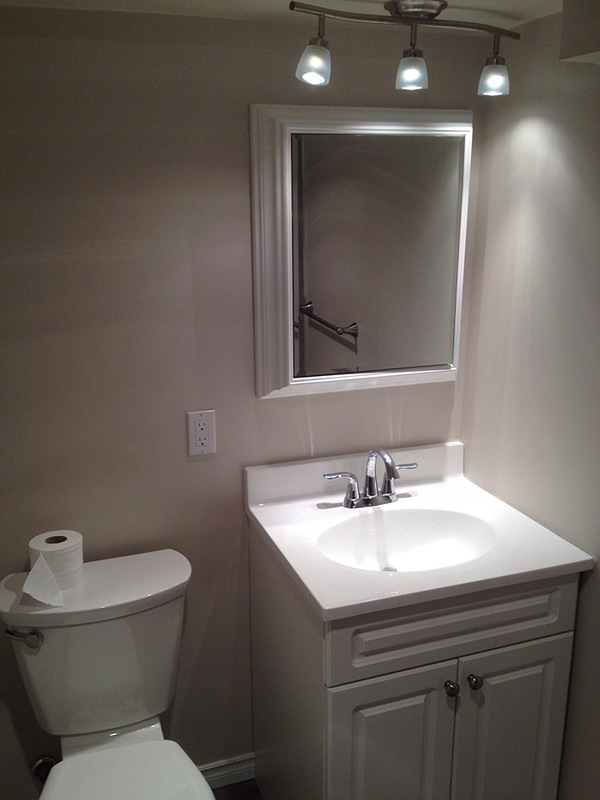 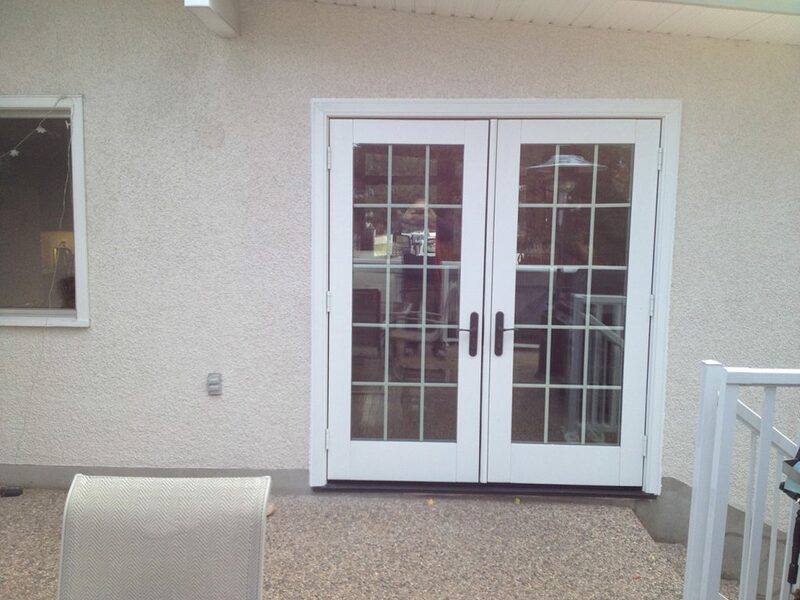 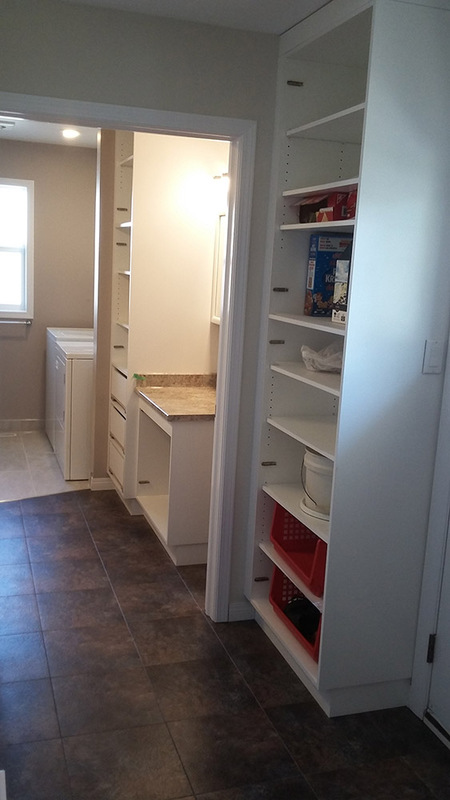 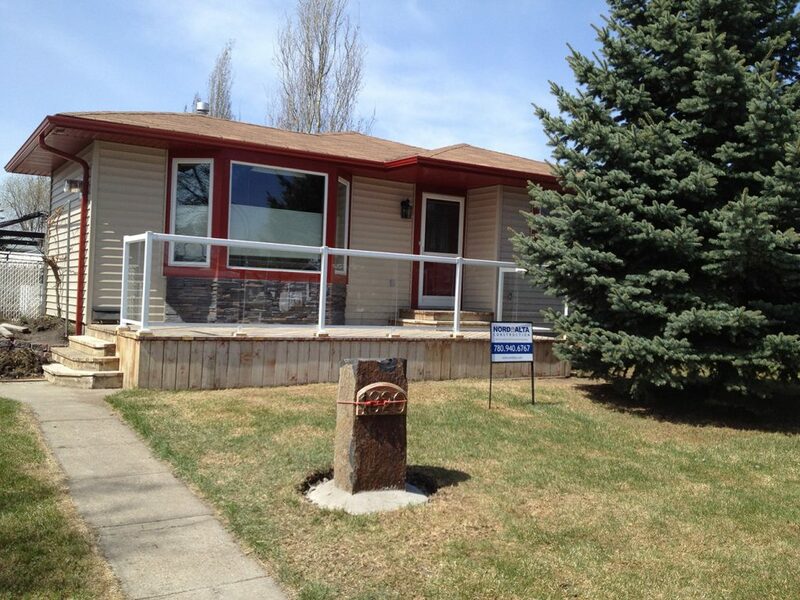 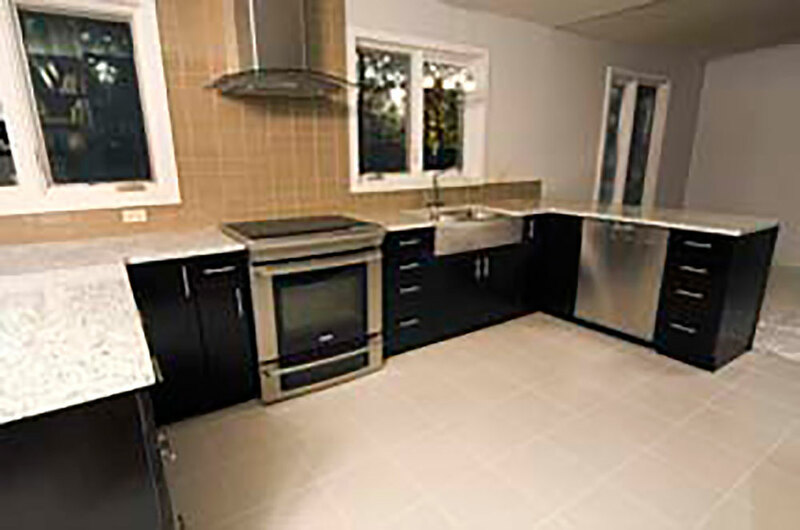 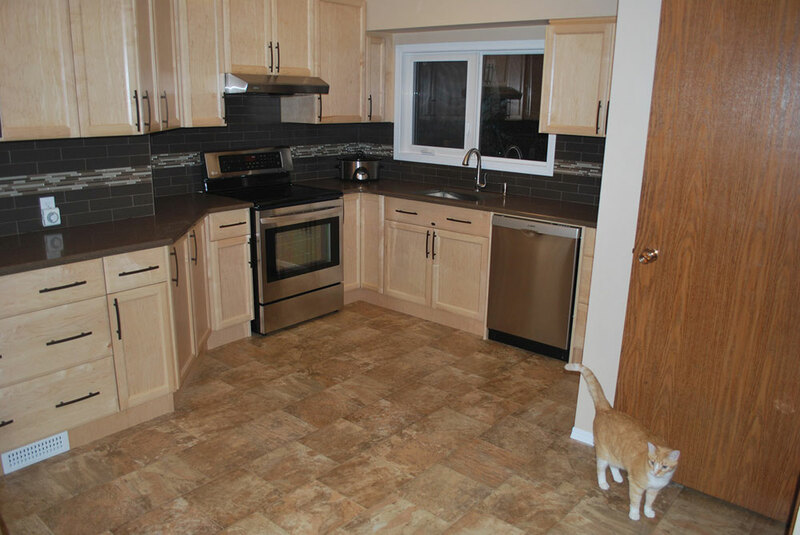 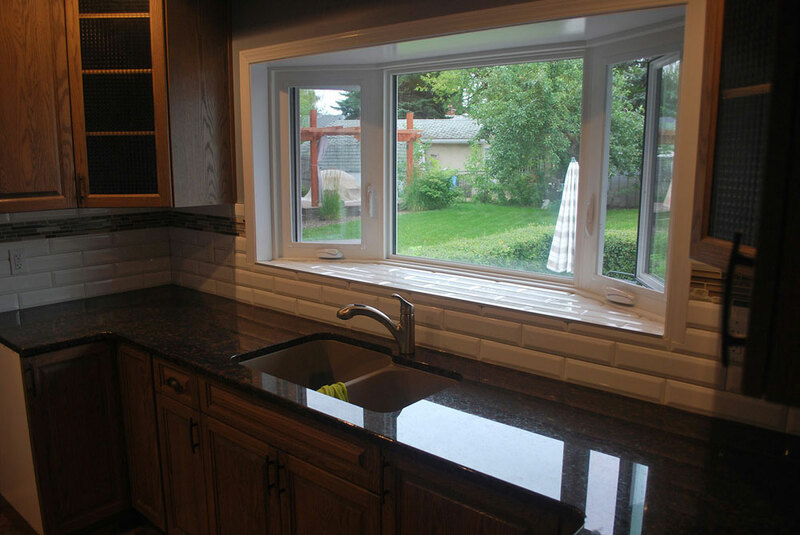 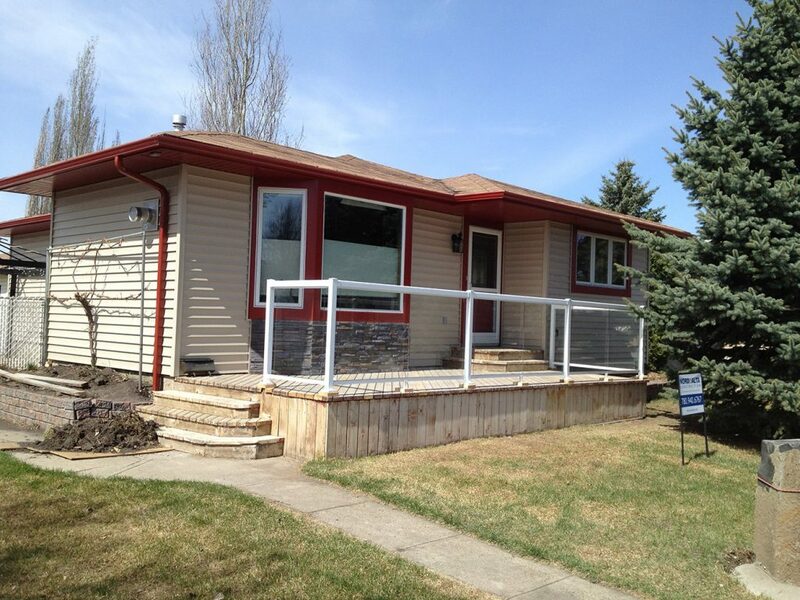 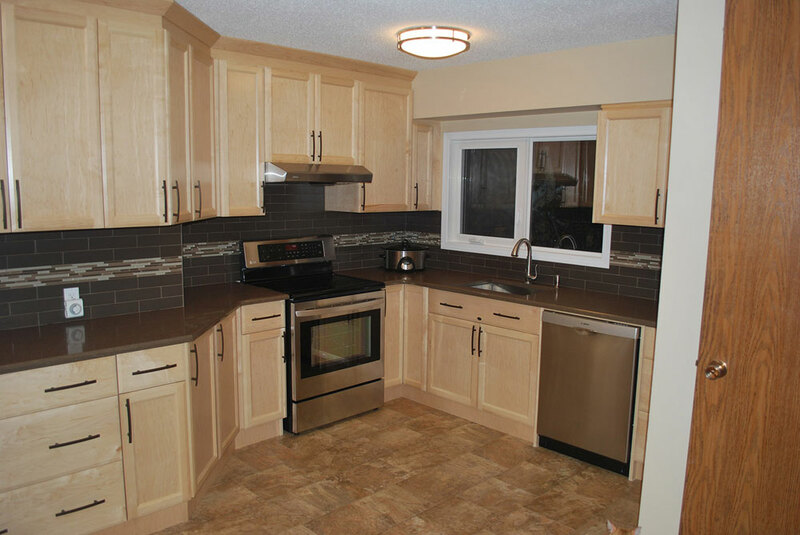 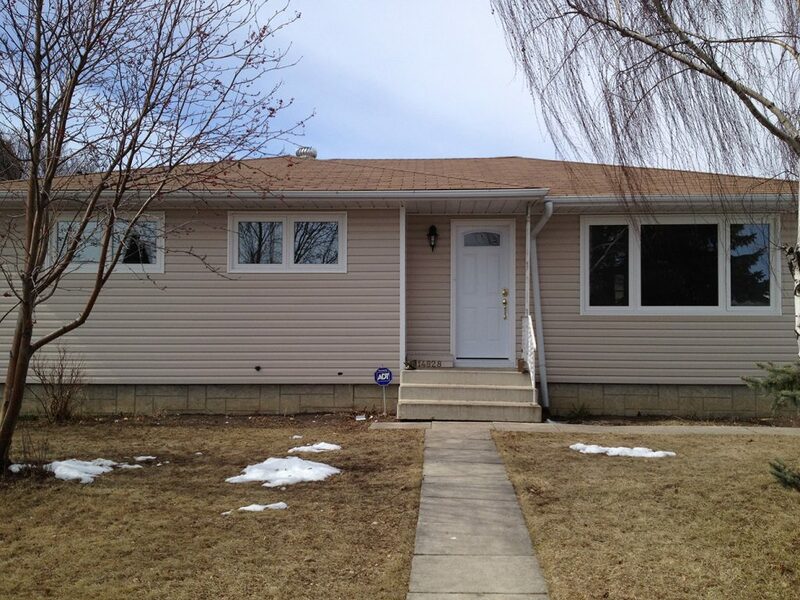 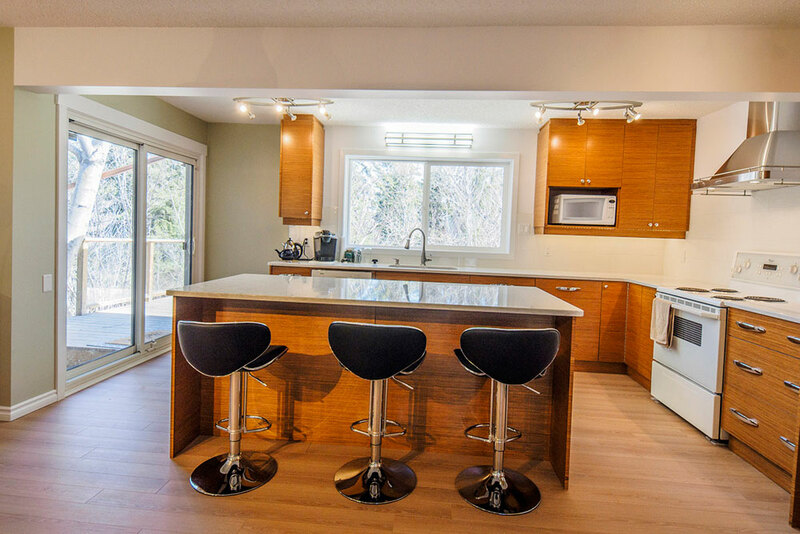 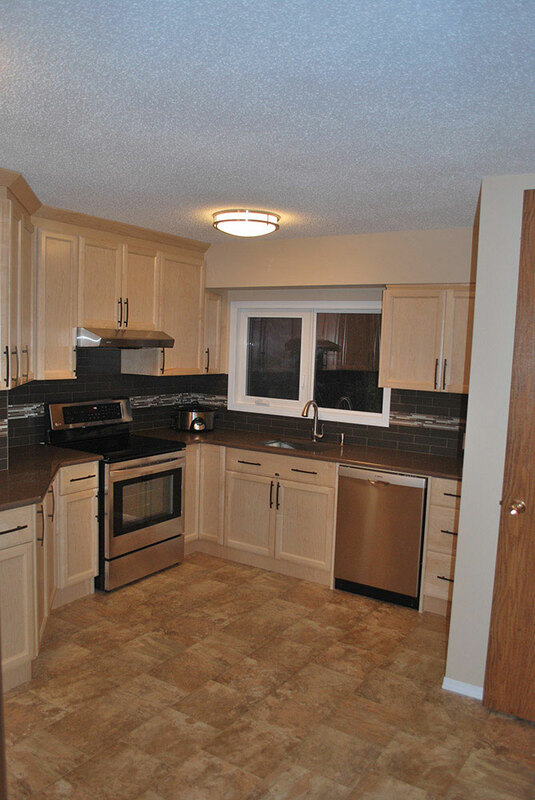 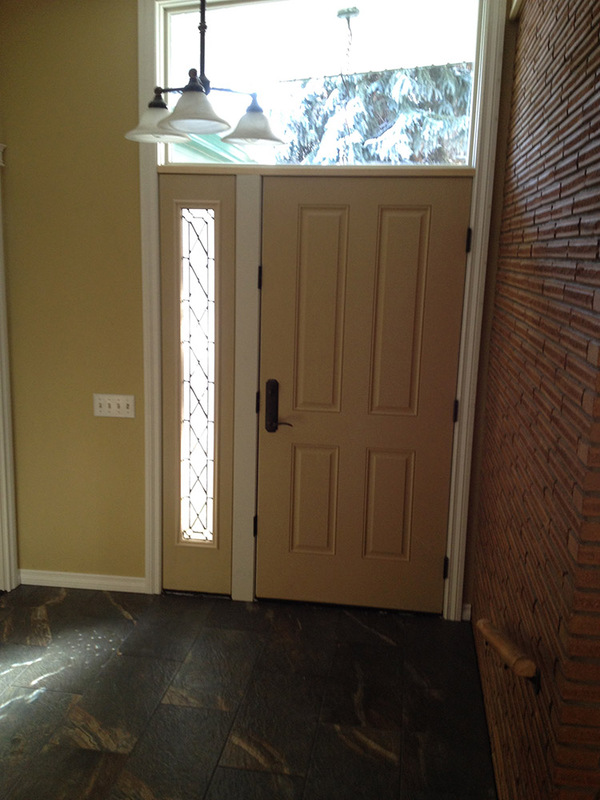 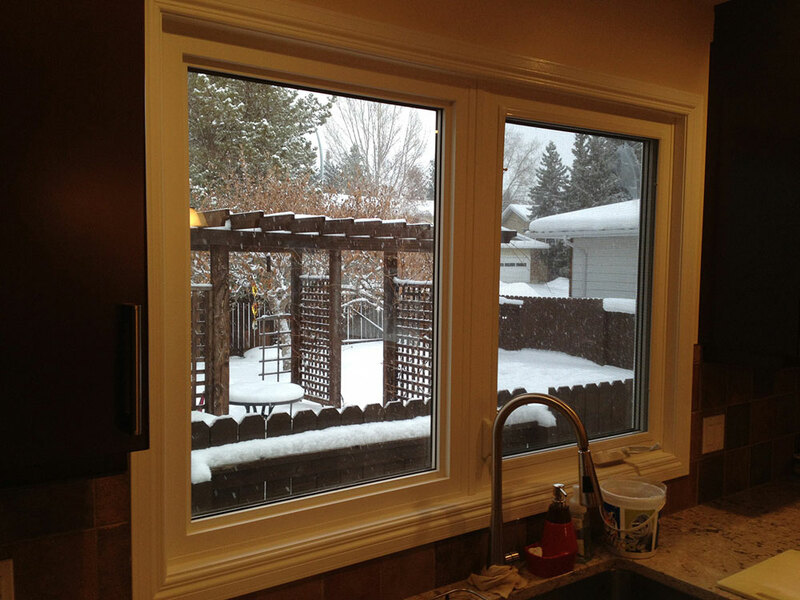 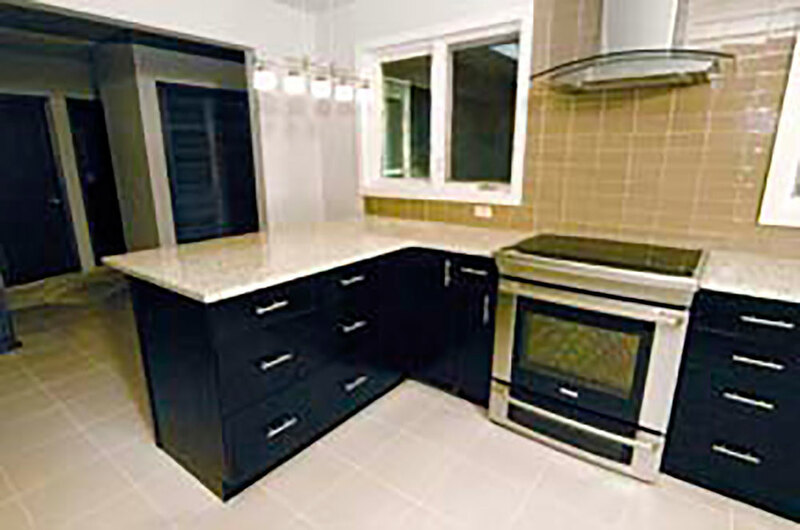 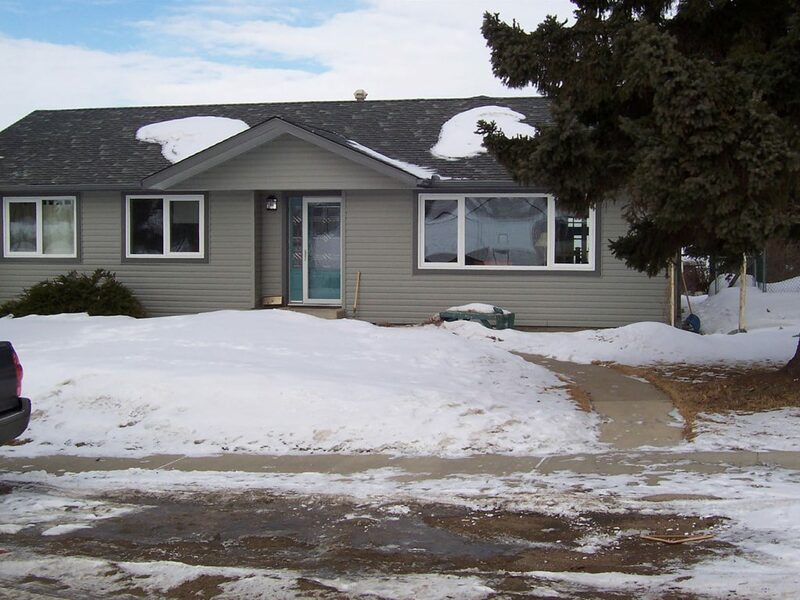 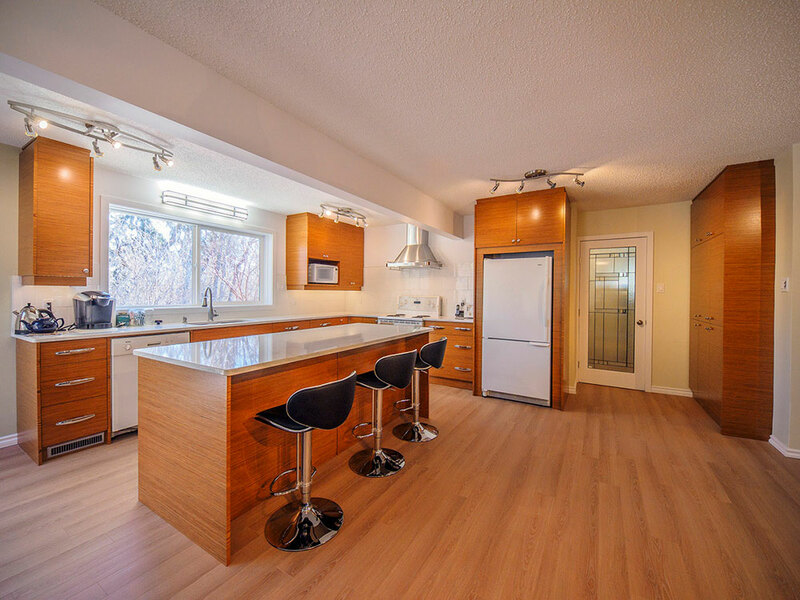 Millwoods Accessible Renovation: The original bathroom and ensuite were combined to create one large bathroom. 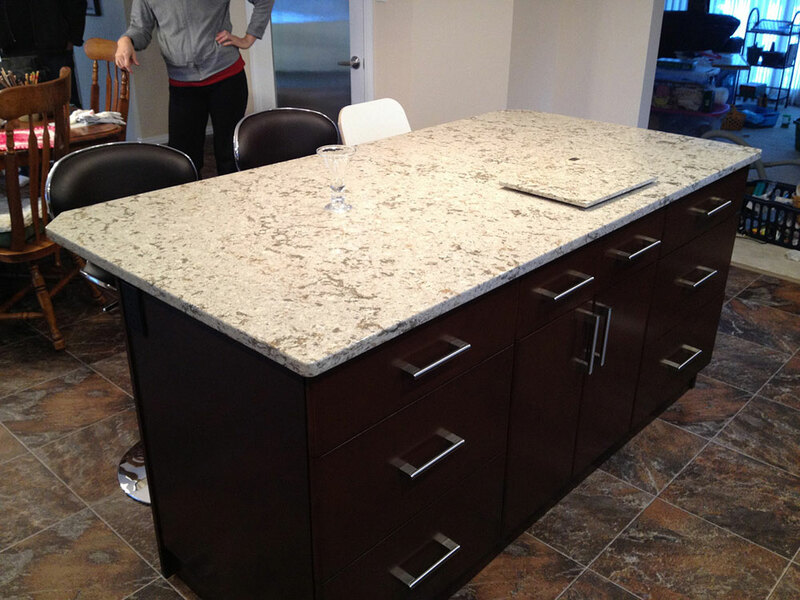 Here we have the beautiful laminate top with a white custom linen tower. 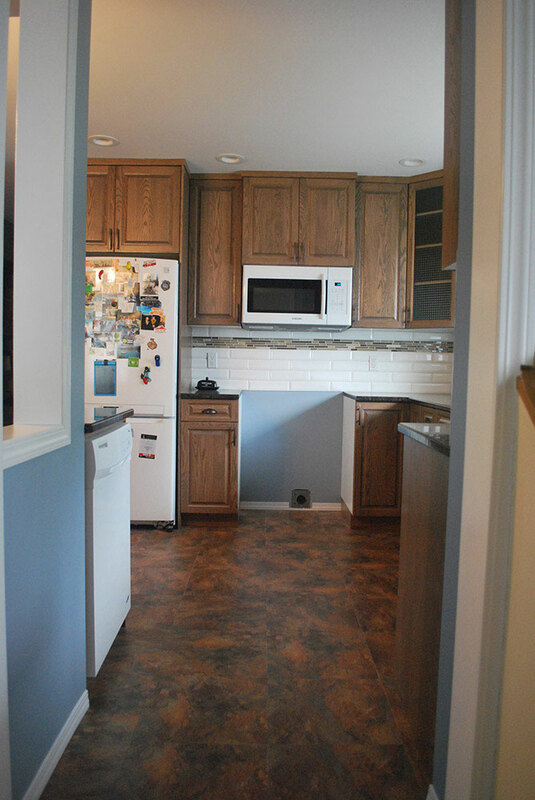 The flooring is luxury vinyl tile. 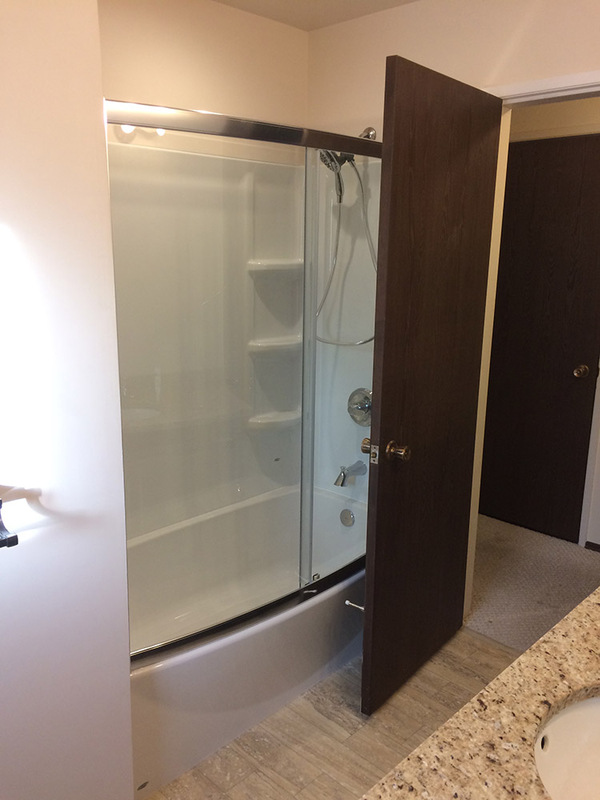 Sherwood Park Accessible Renovation: The focus of this shower renovation was to design a shower that a caregiver could shower the clients' daughter without lifting her into a tub or risking a potential fall. 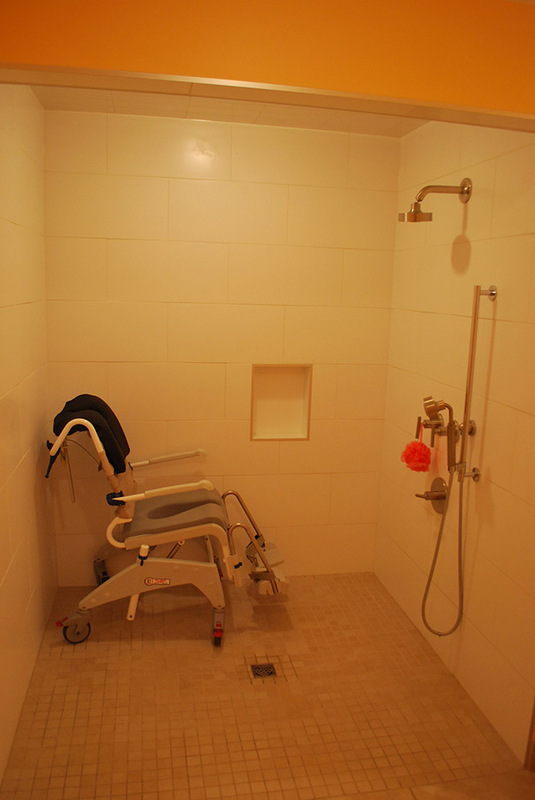 The shower is curb-less and the seat folds up for the rest of the family to use. 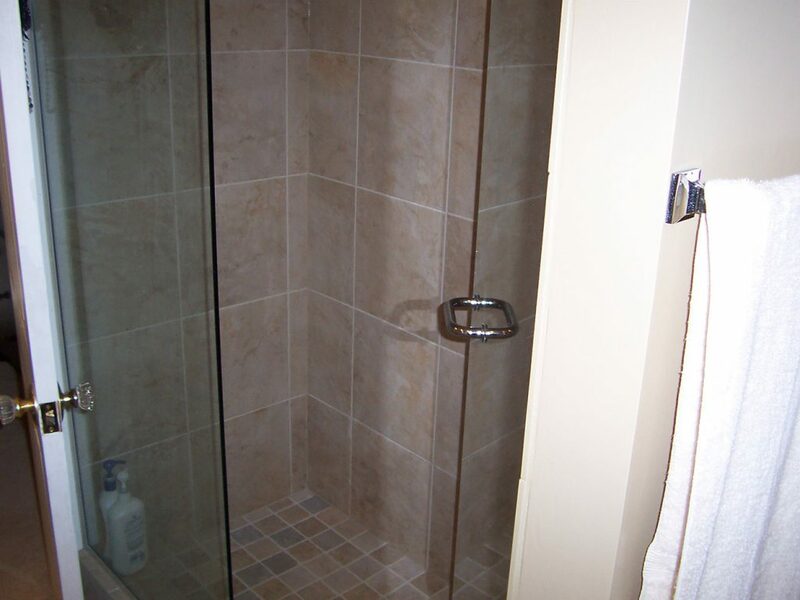 An added bonus is that the caregiver doesn't get soaking wet when giving the client a shower.